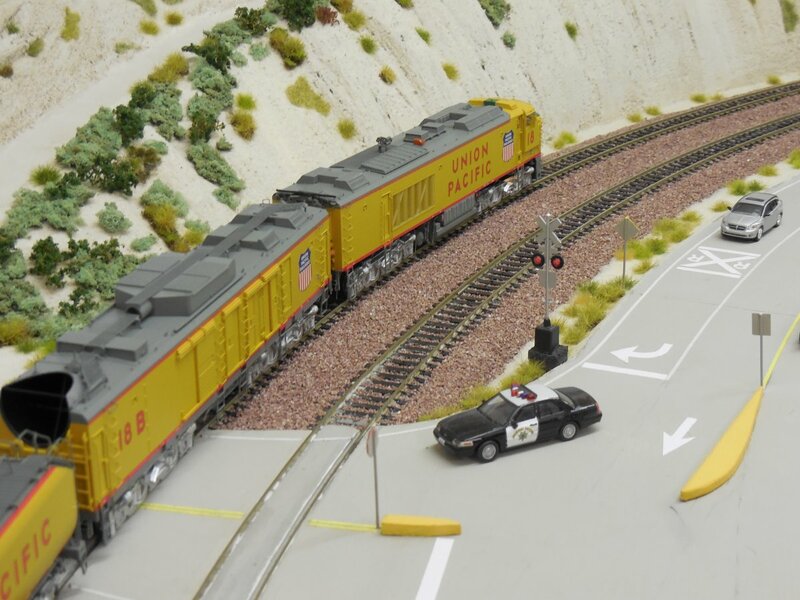 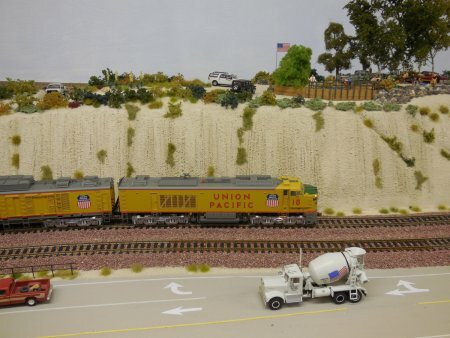 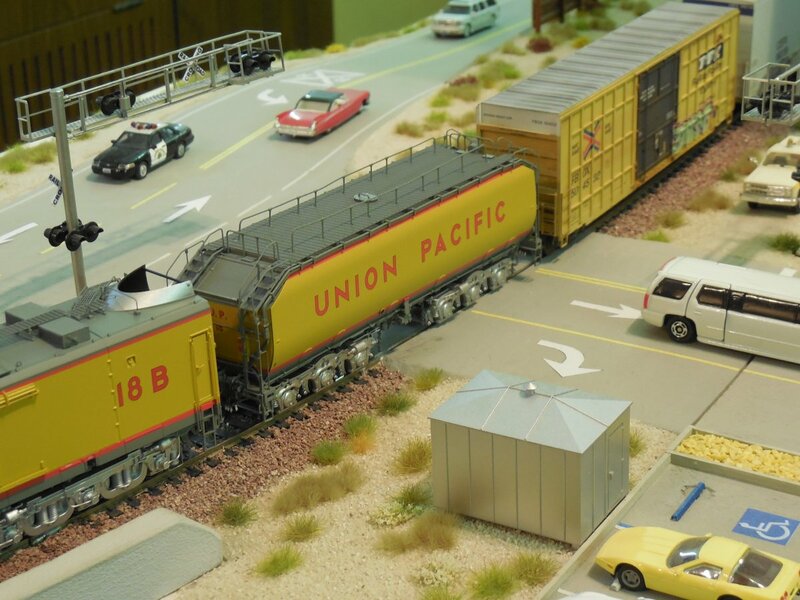 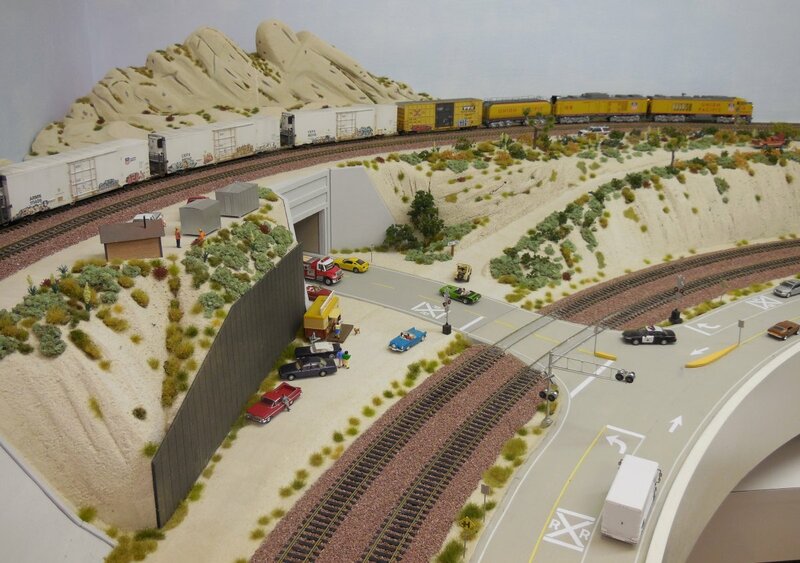 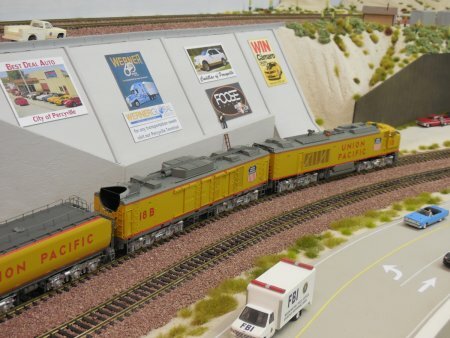 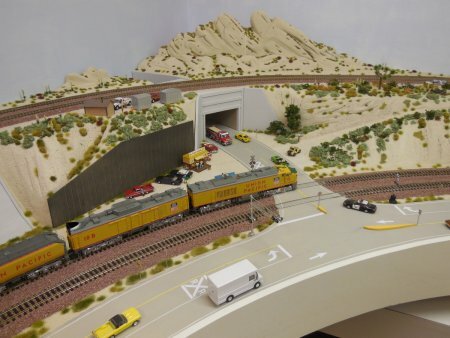 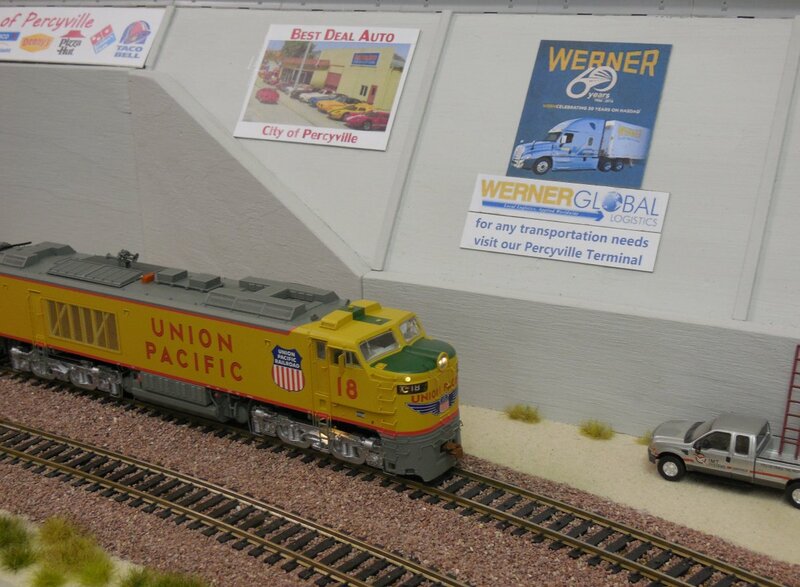 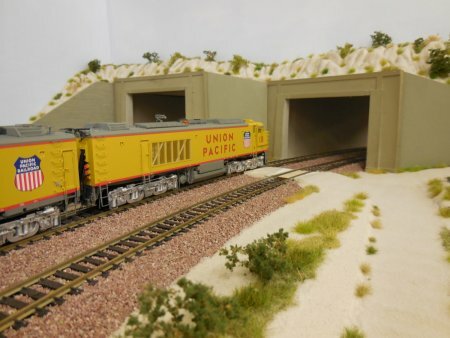 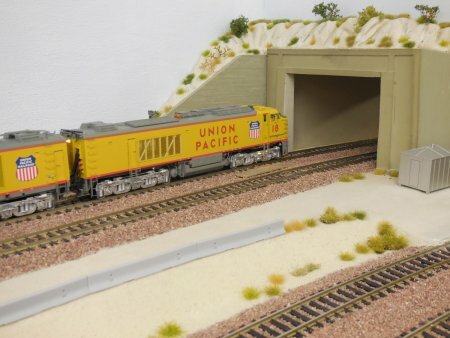 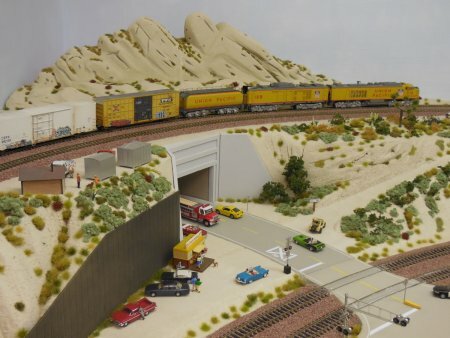 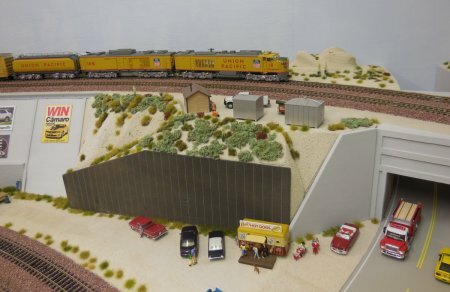 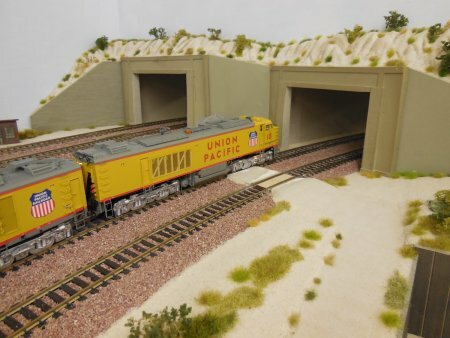 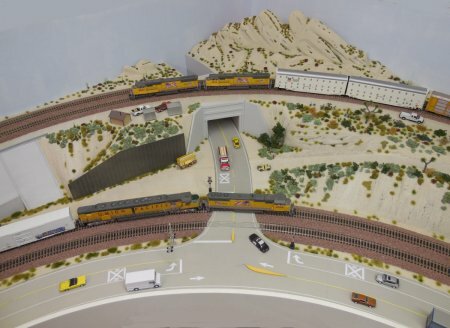 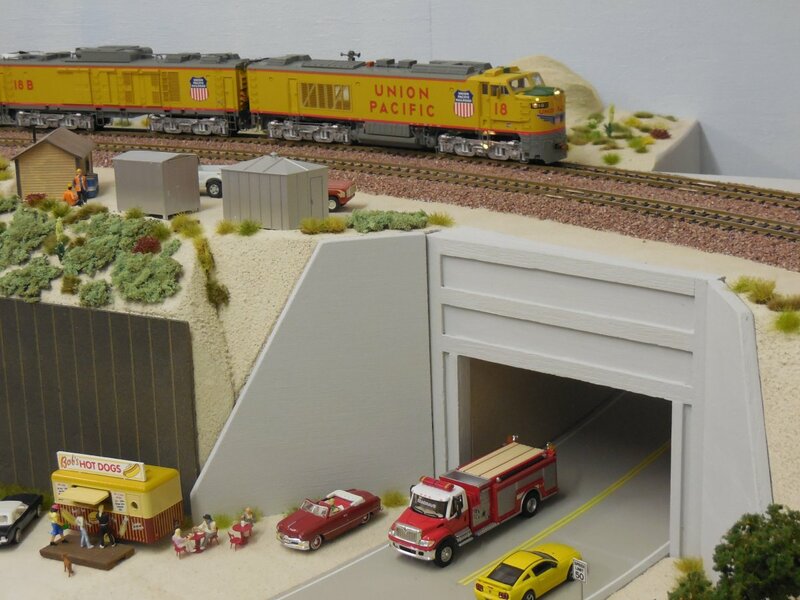 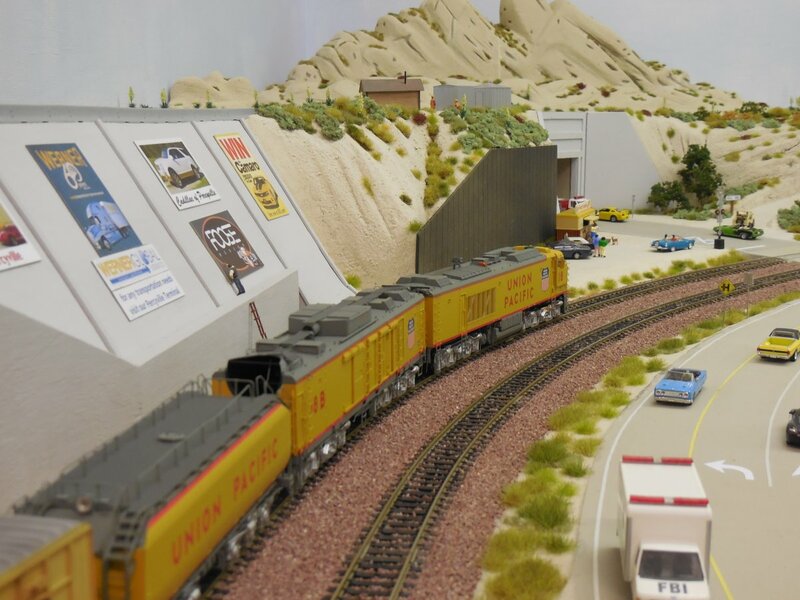 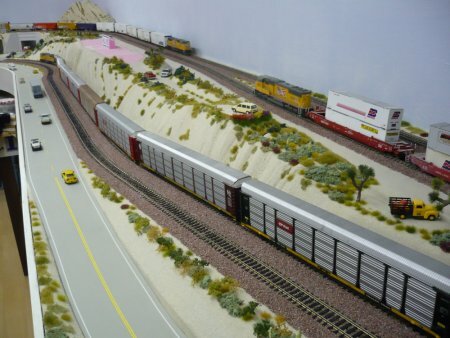 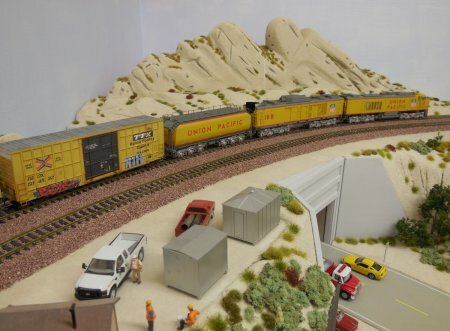 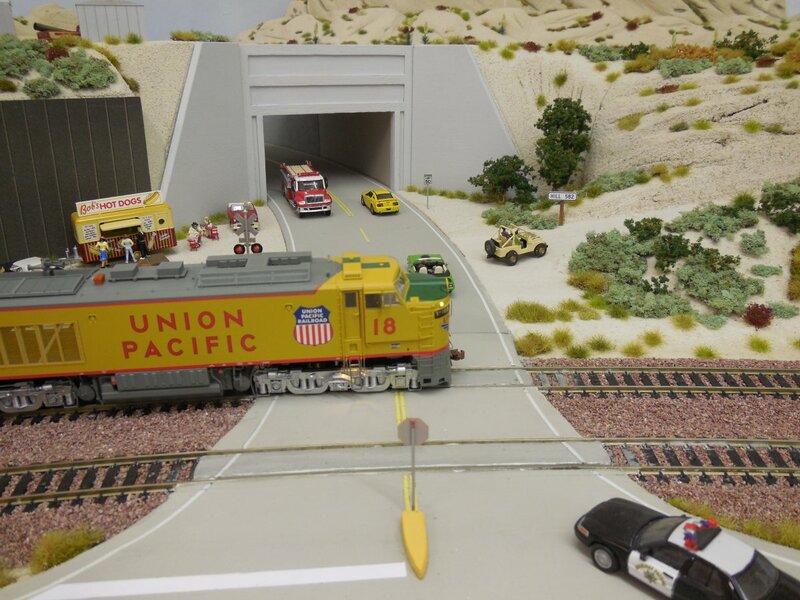 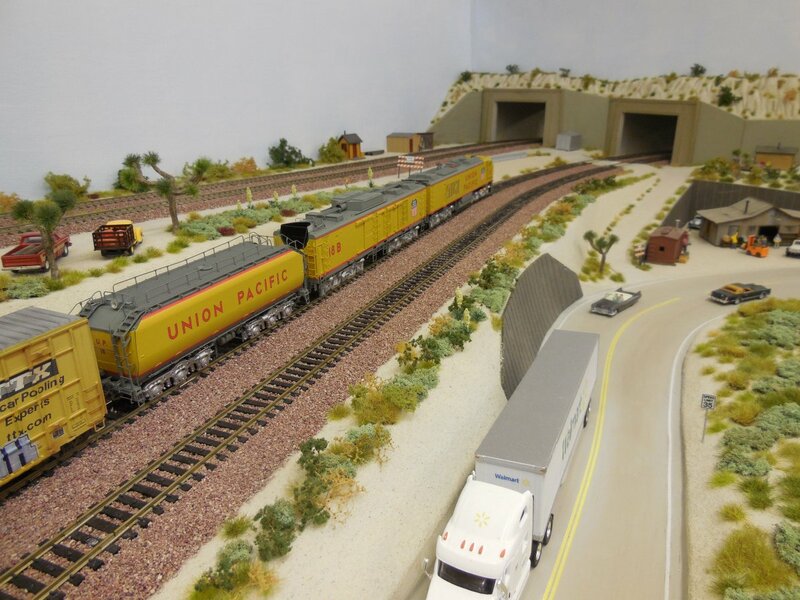 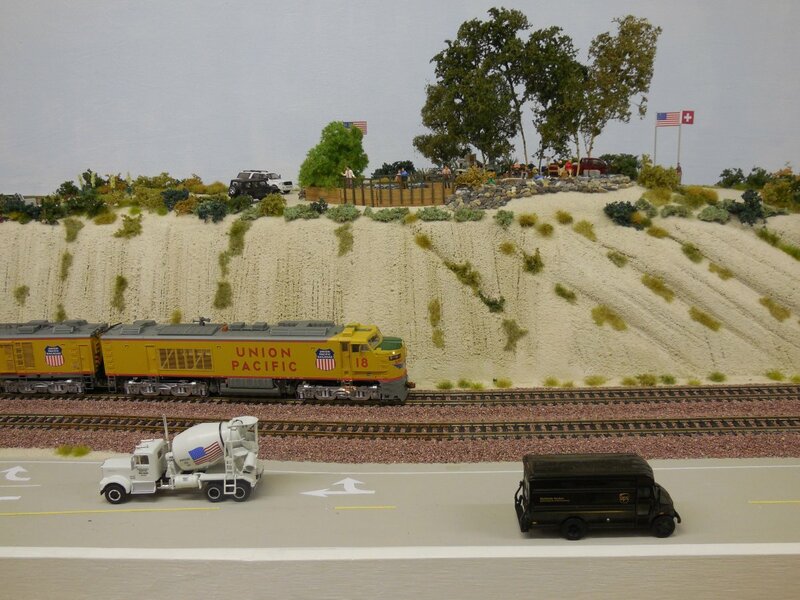 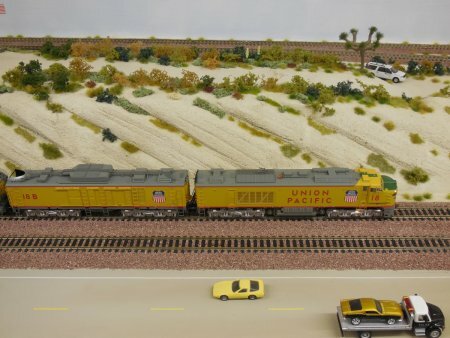 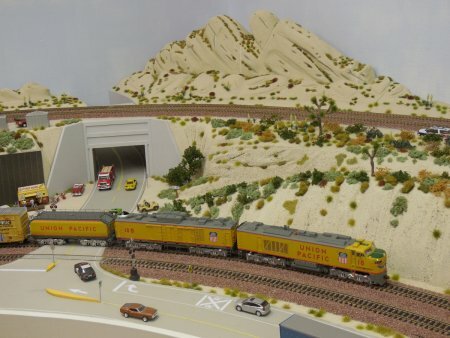 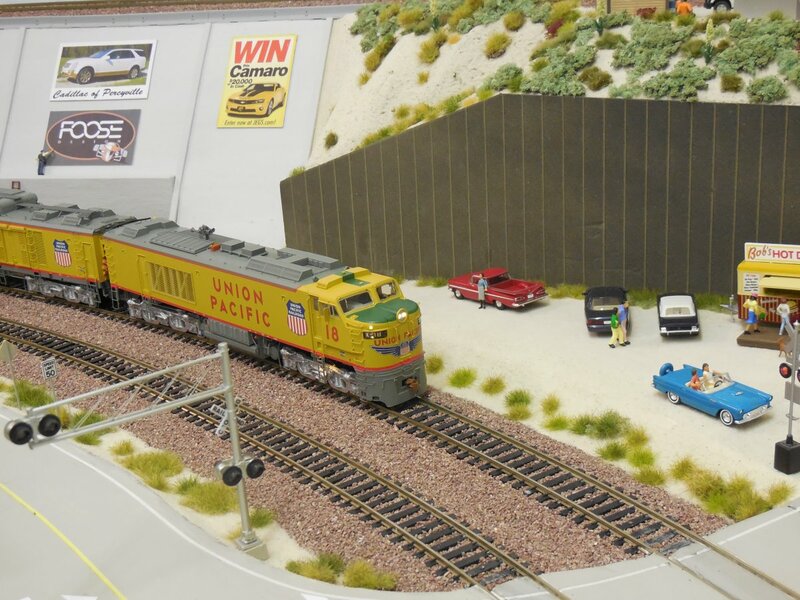 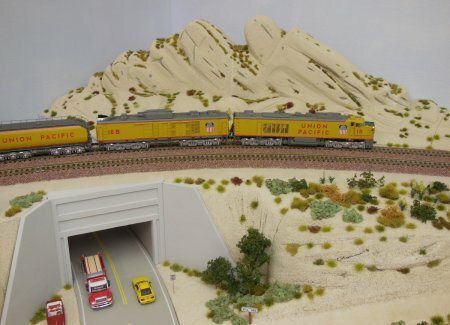 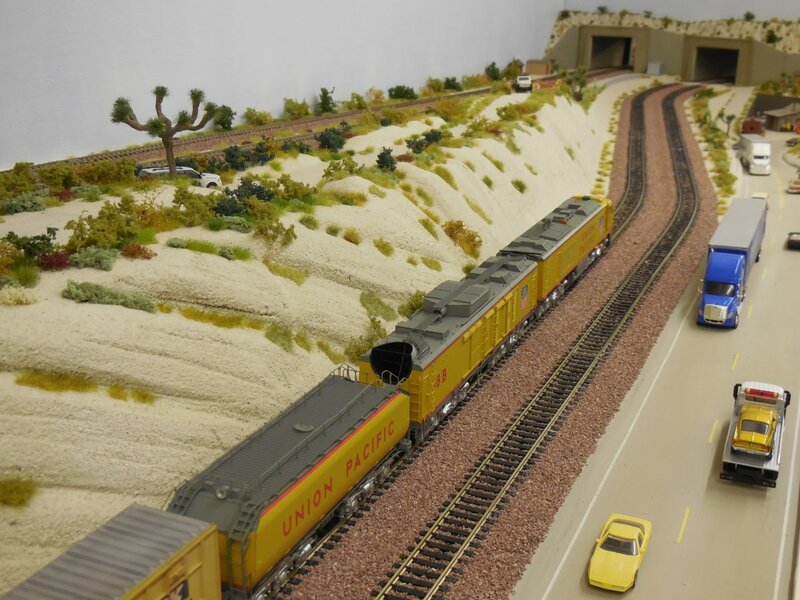 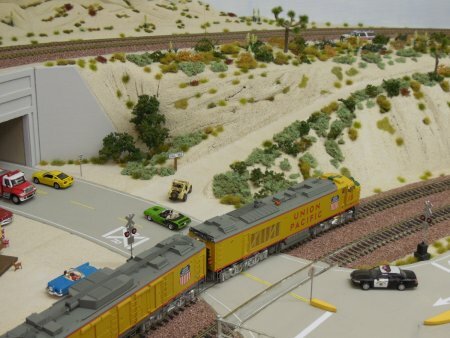 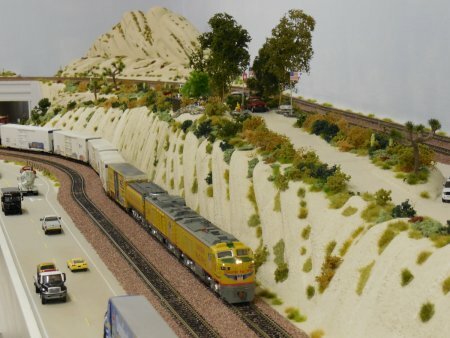 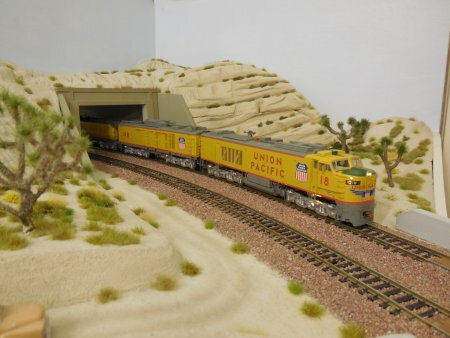 Only on my layout, a UP Big Blow GTEL is rolling over Cajon Pass. 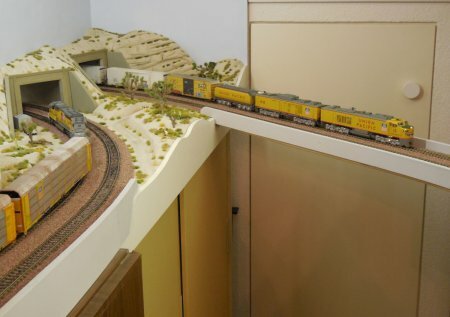 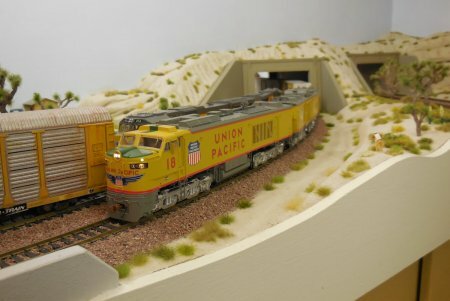 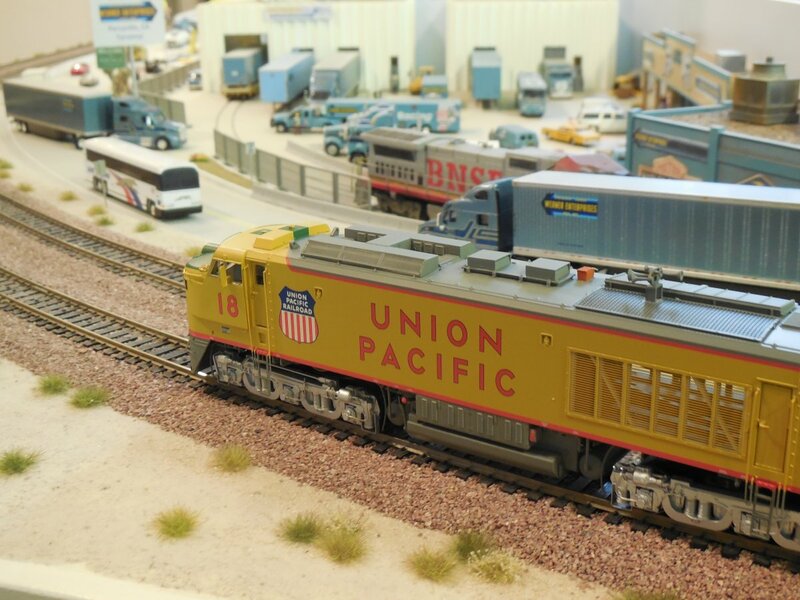 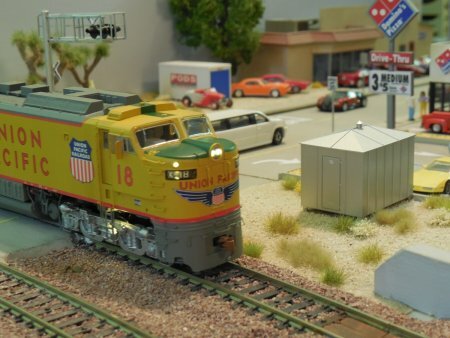 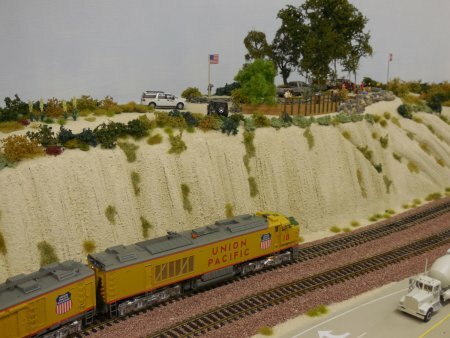 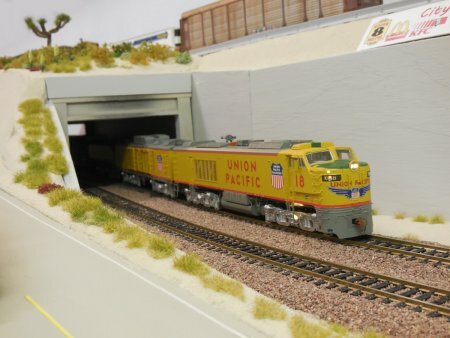 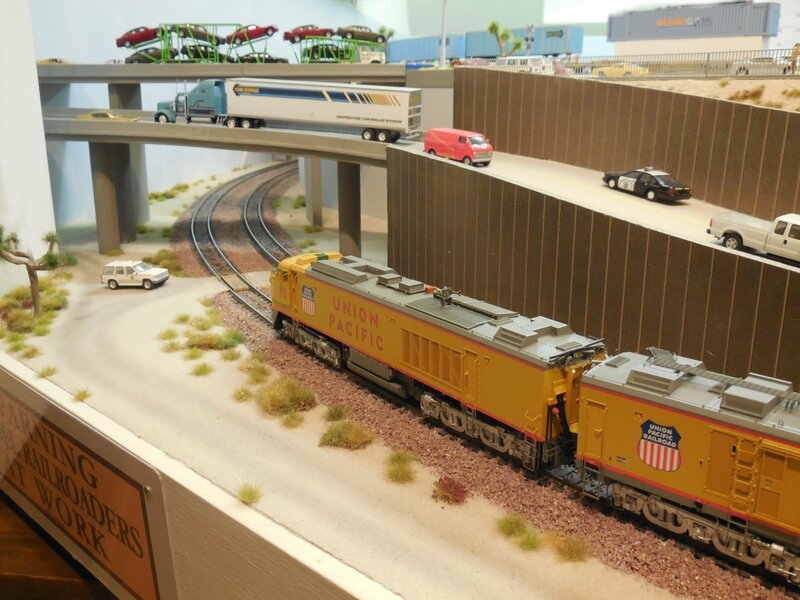 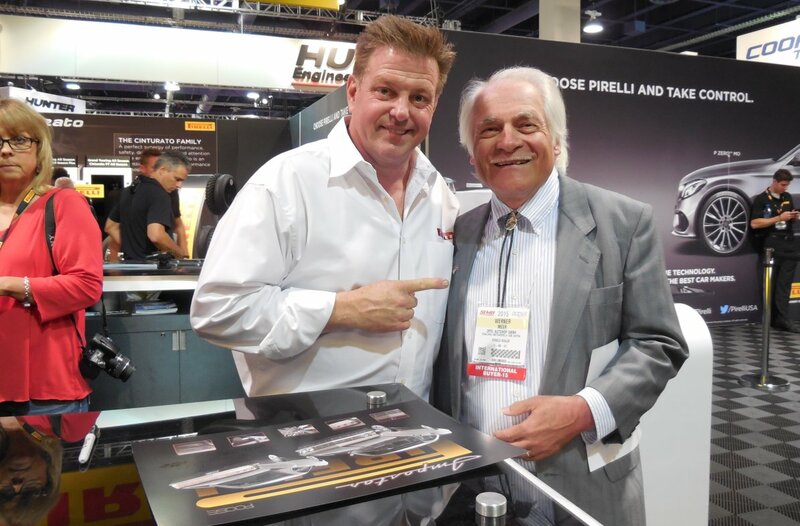 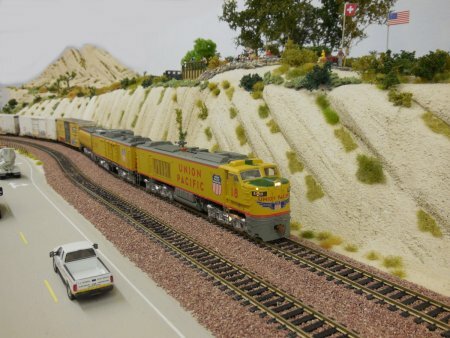 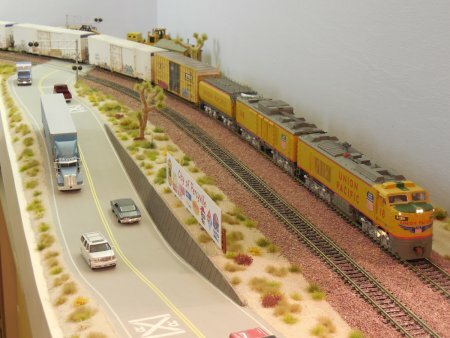 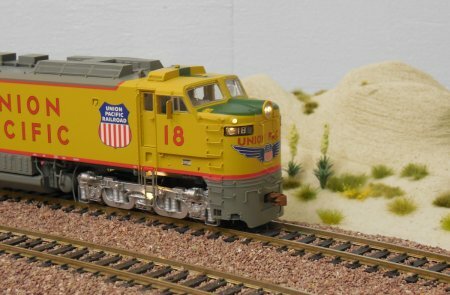 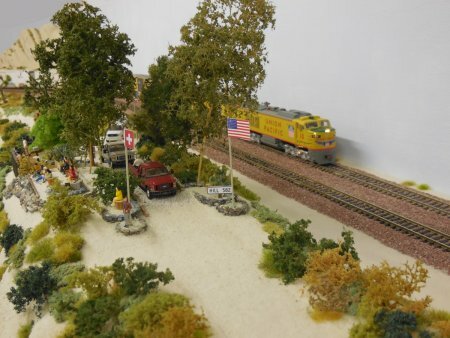 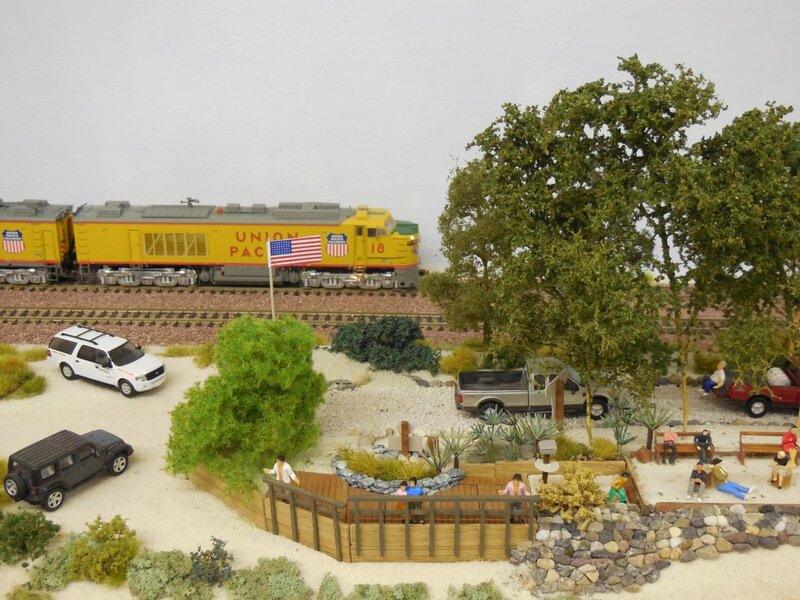 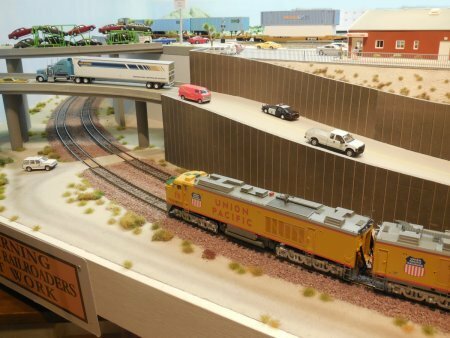 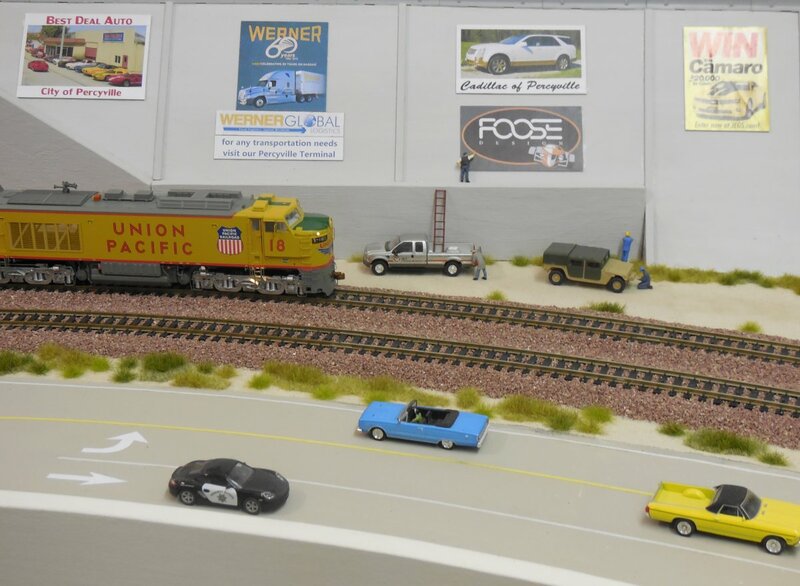 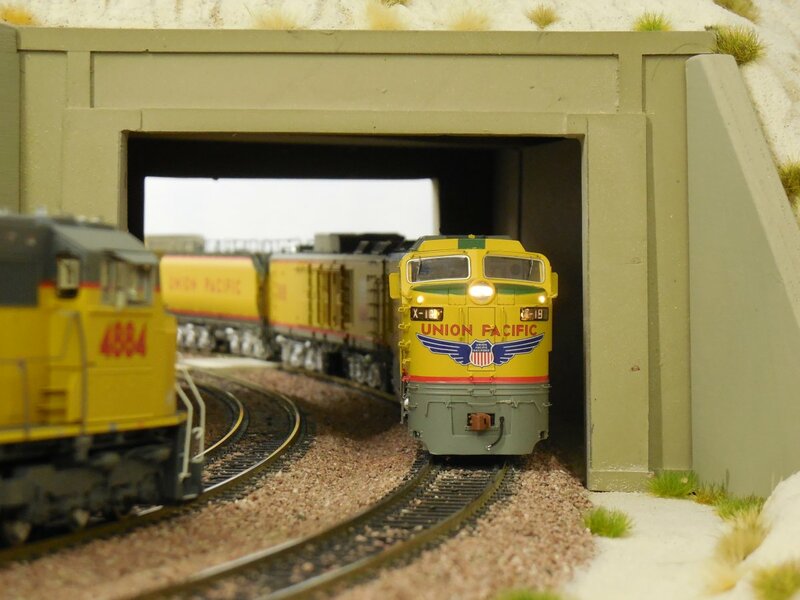 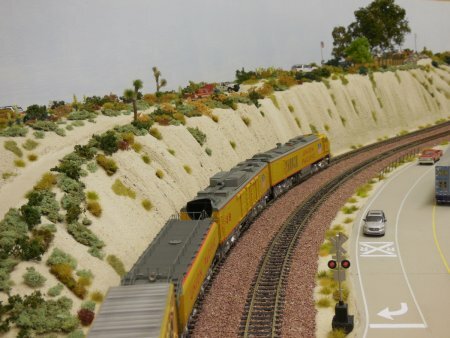 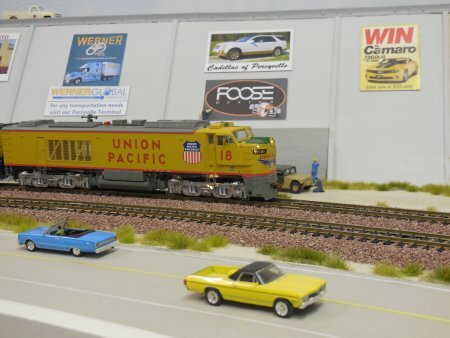 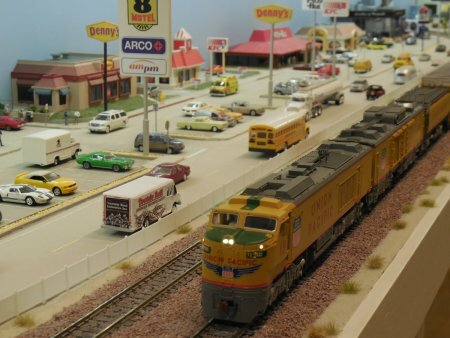 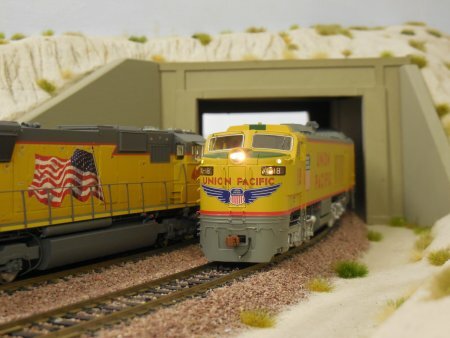 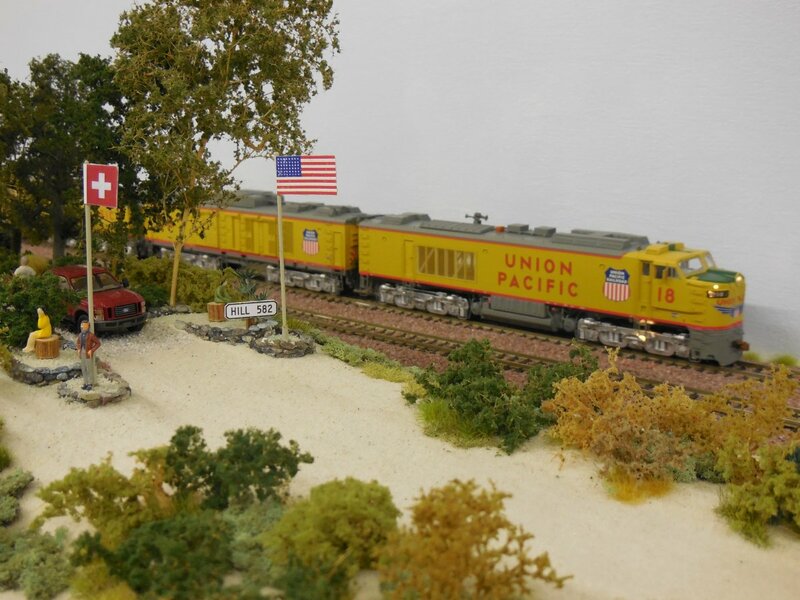 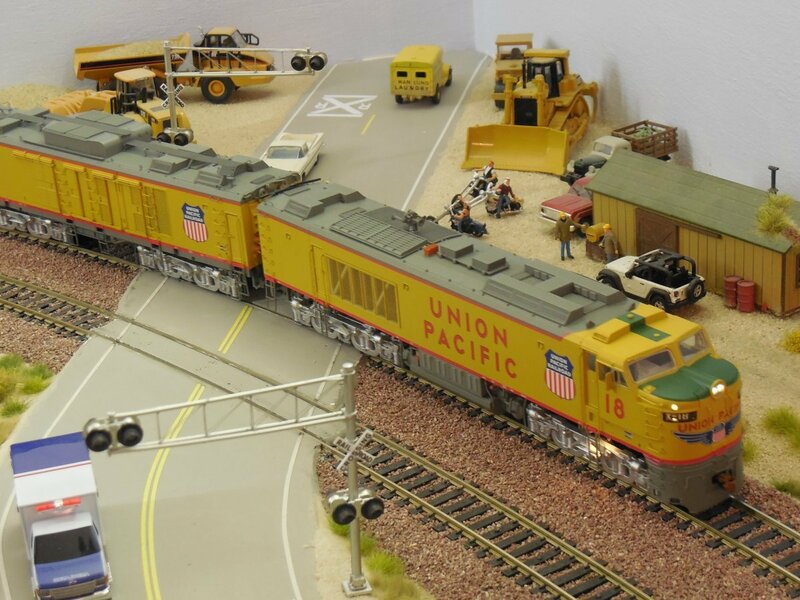 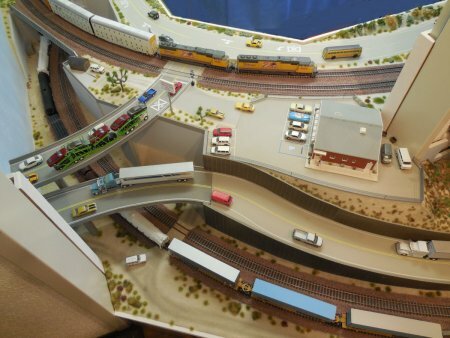 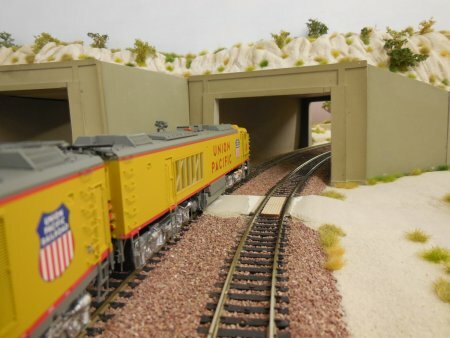 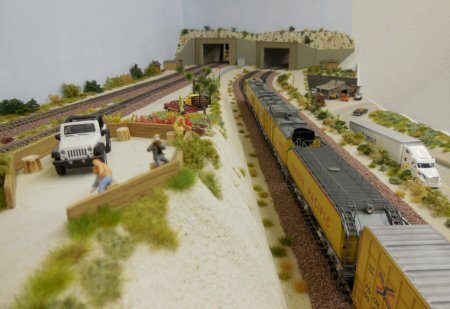 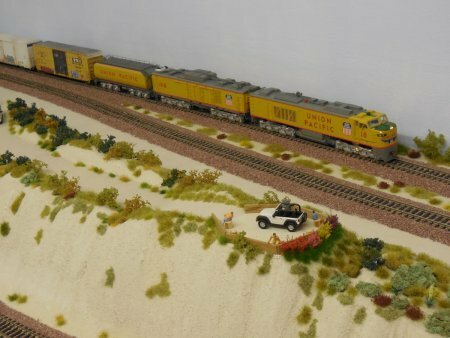 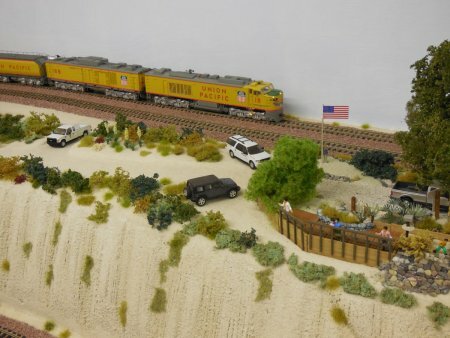 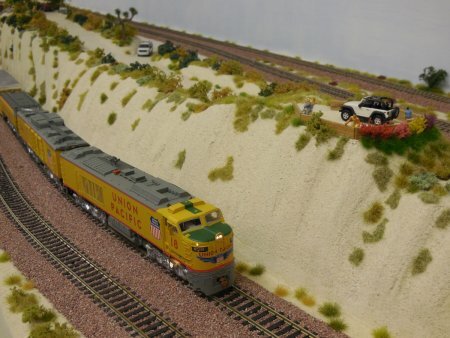 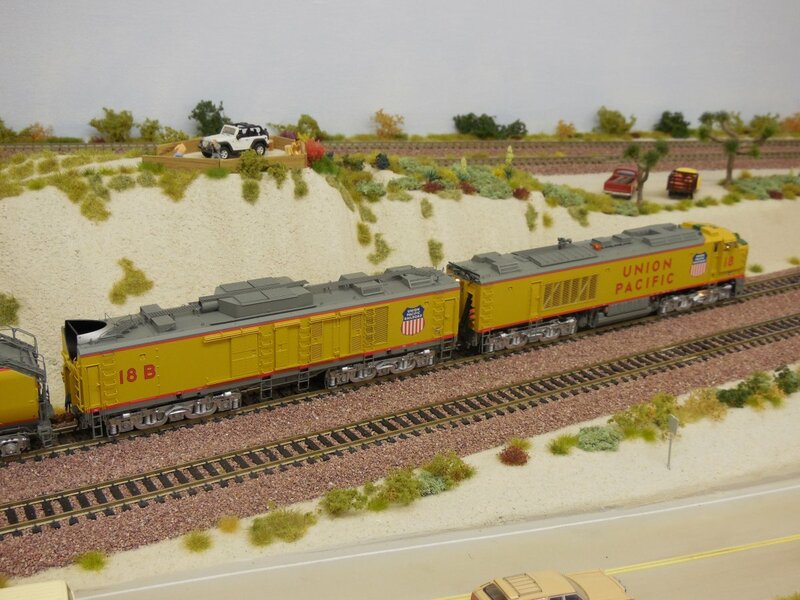 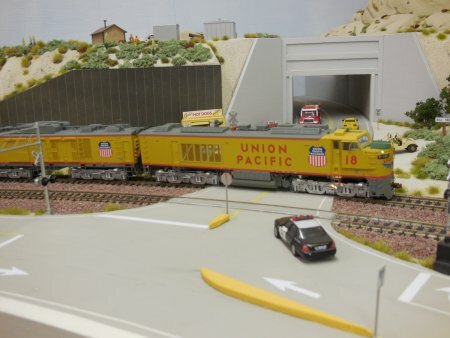 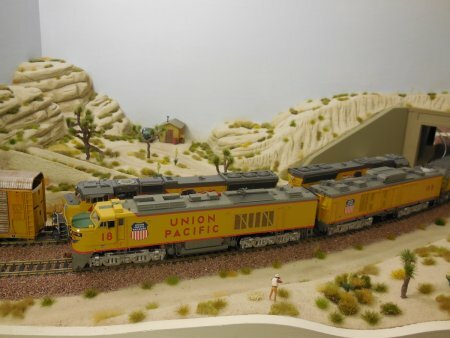 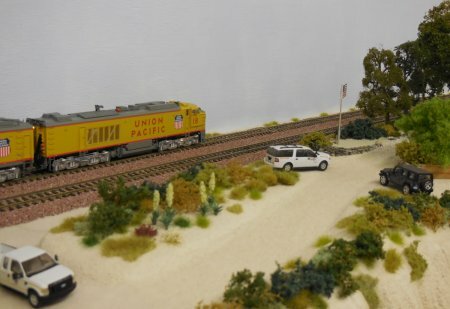 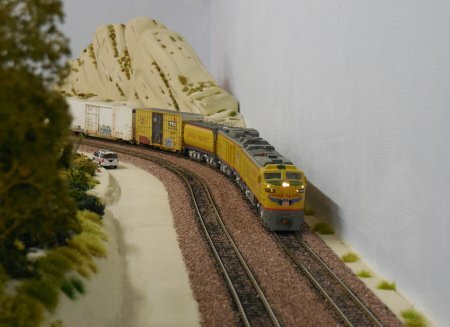 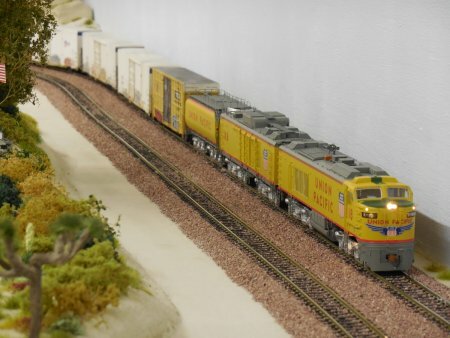 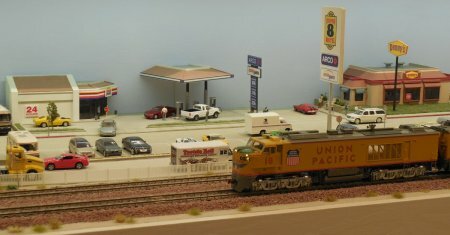 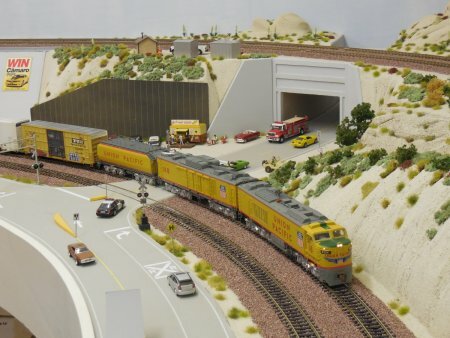 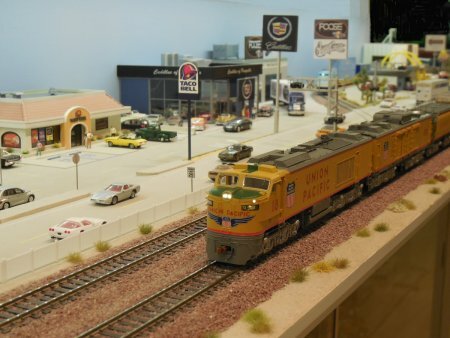 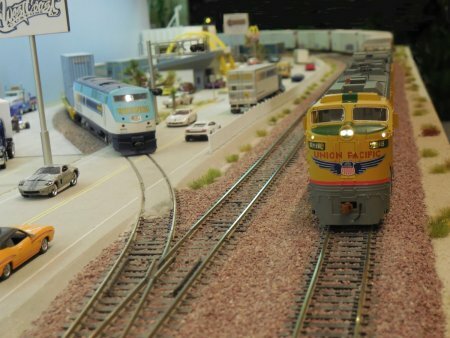 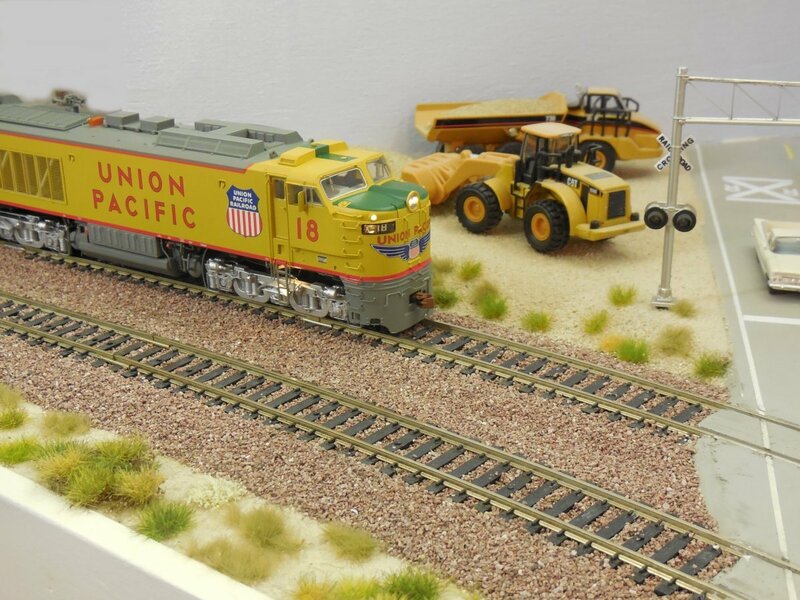 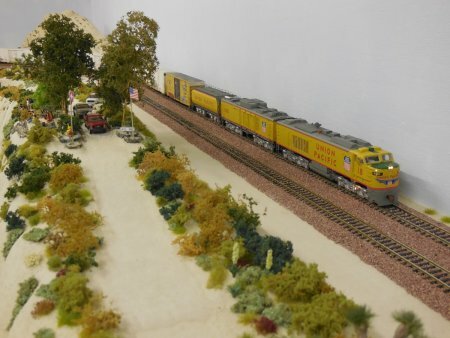 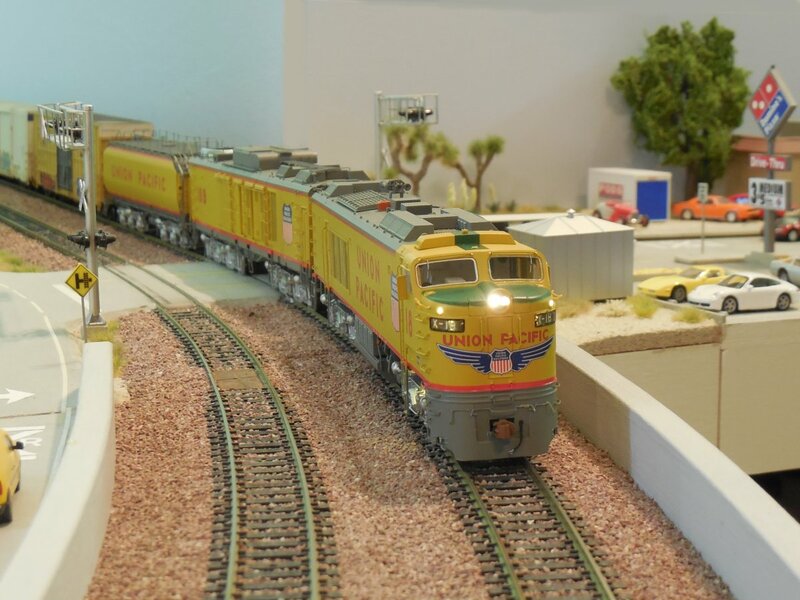 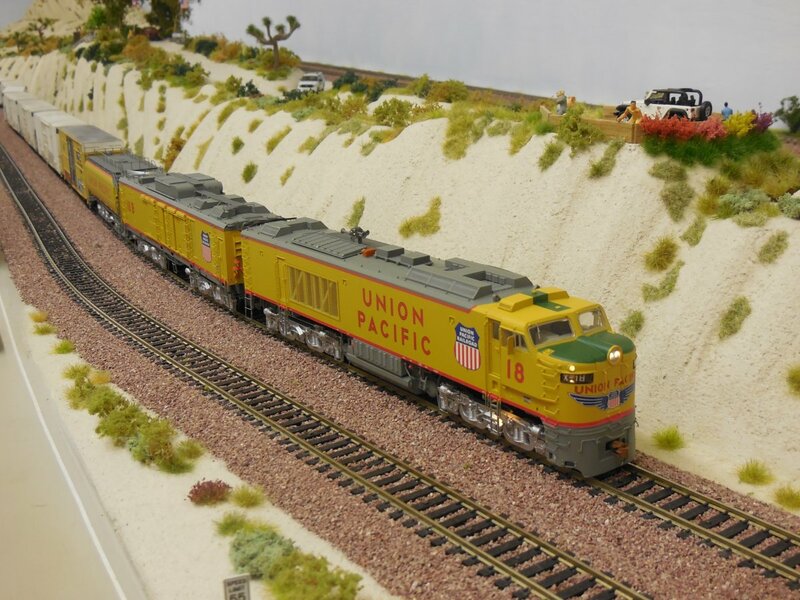 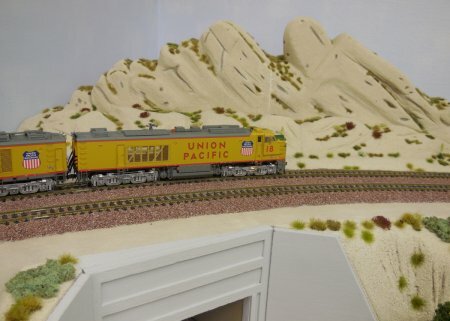 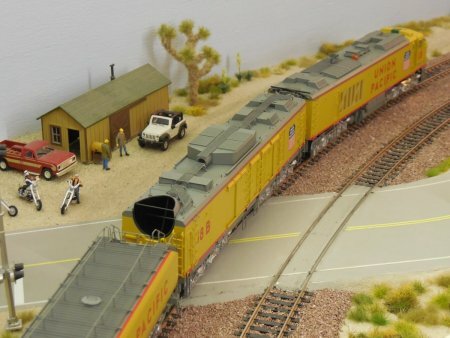 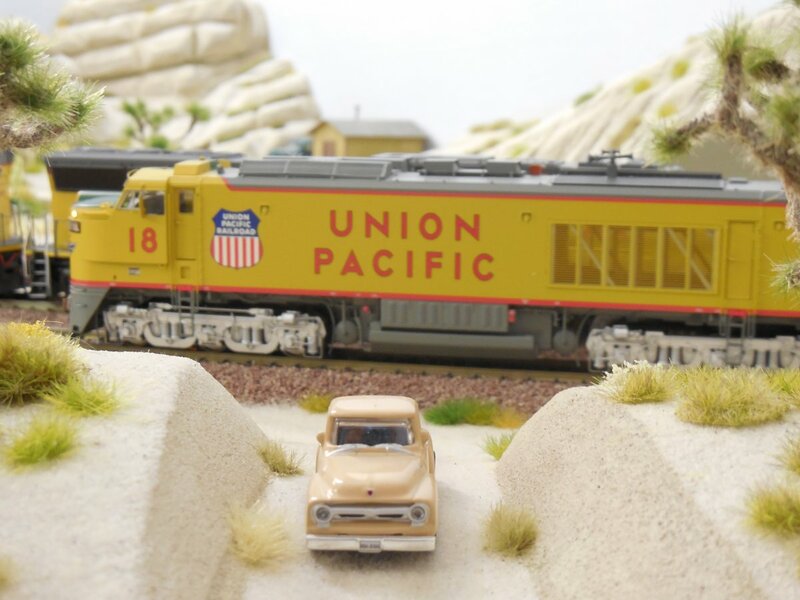 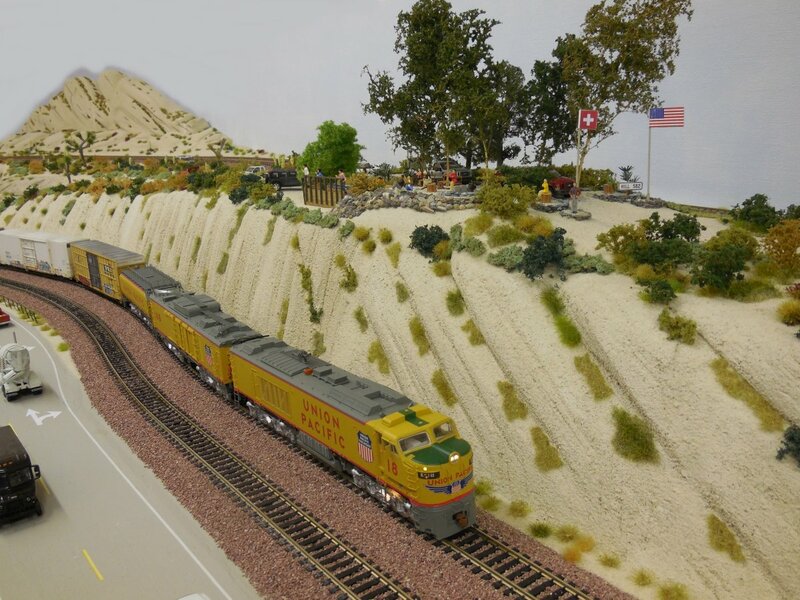 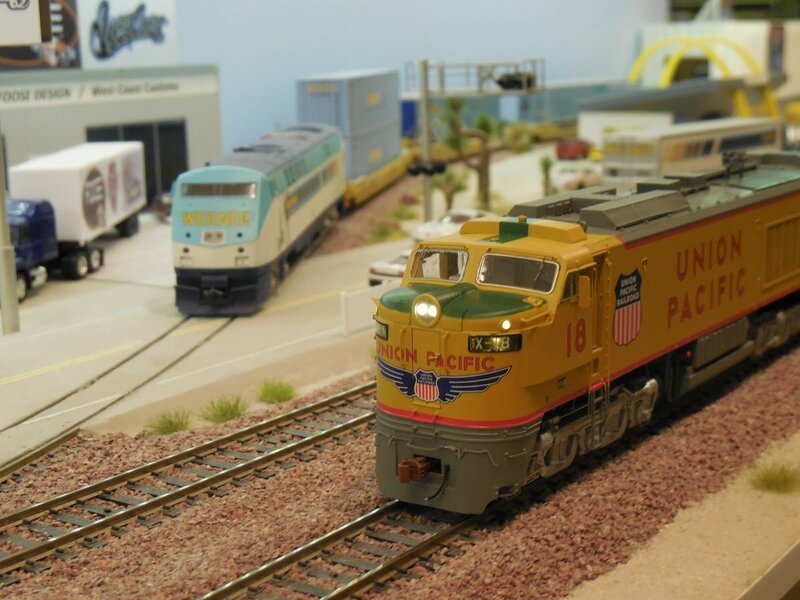 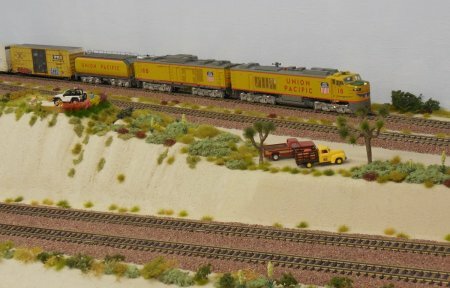 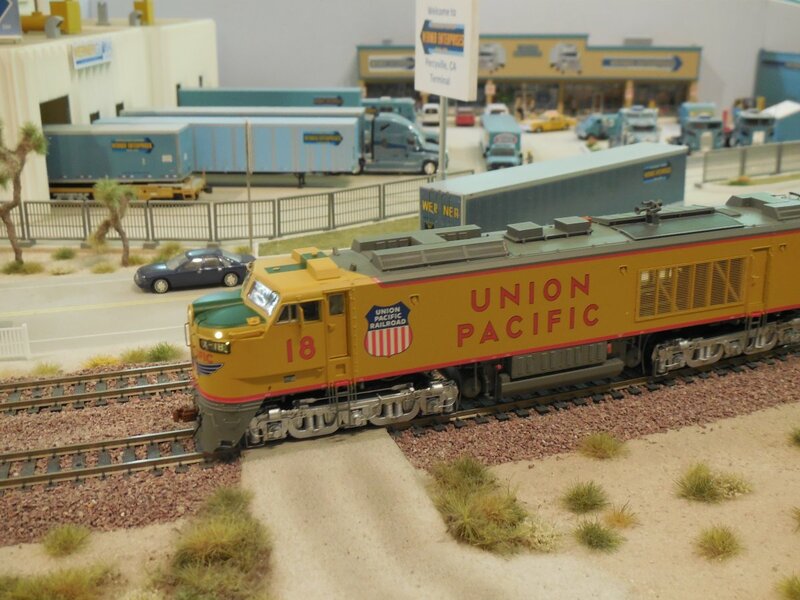 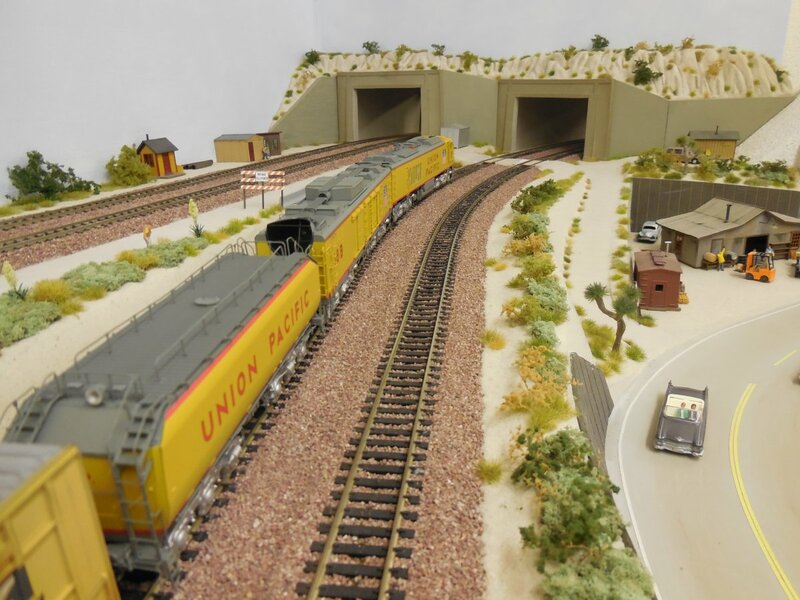 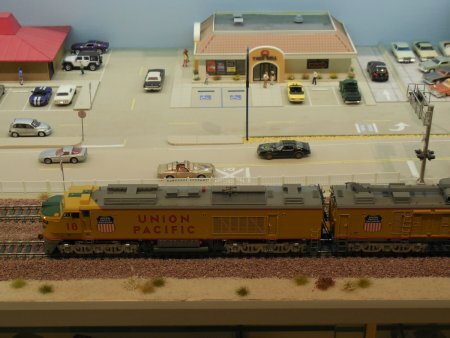 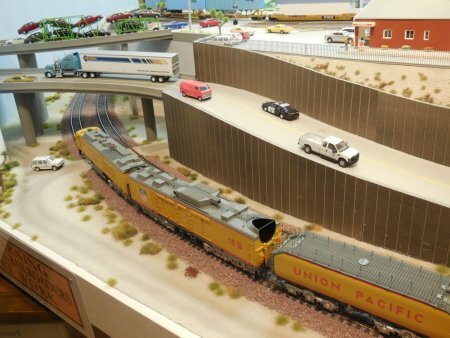 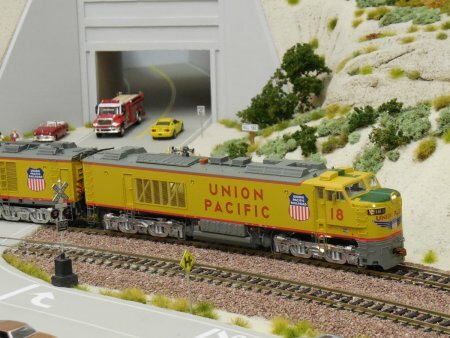 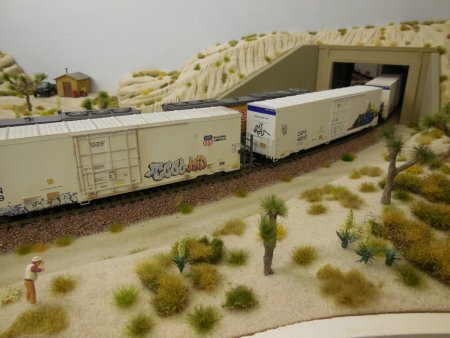 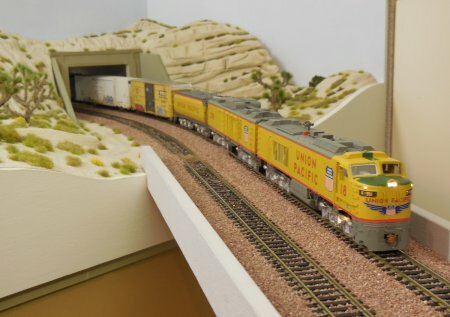 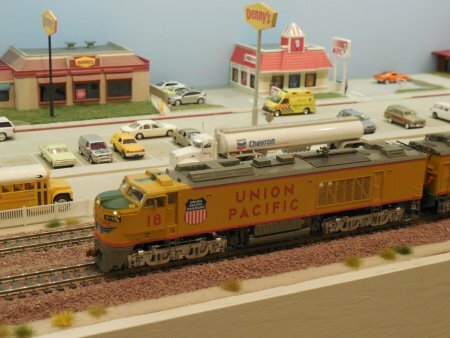 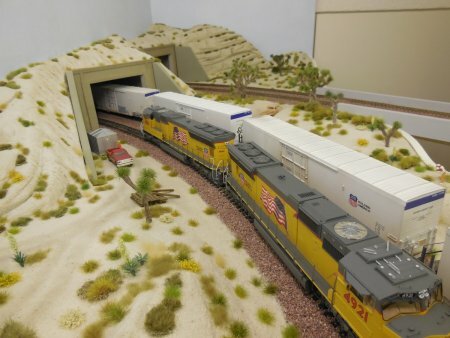 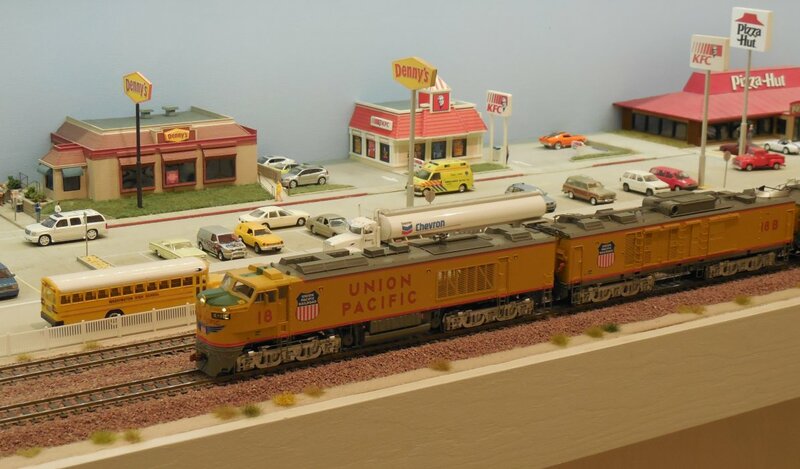 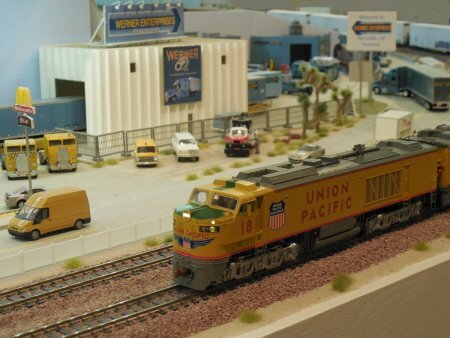 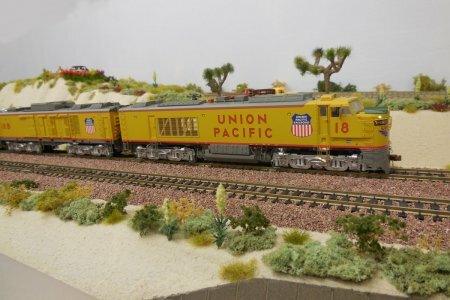 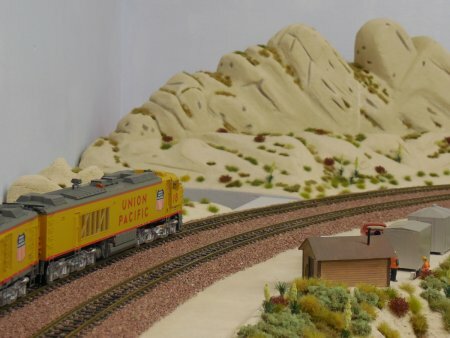 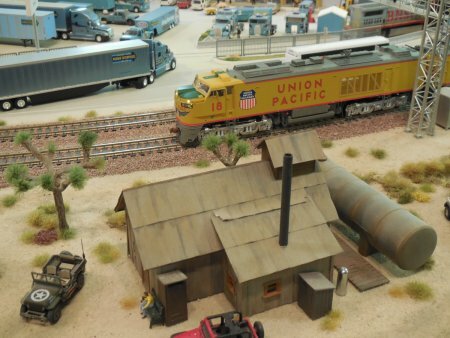 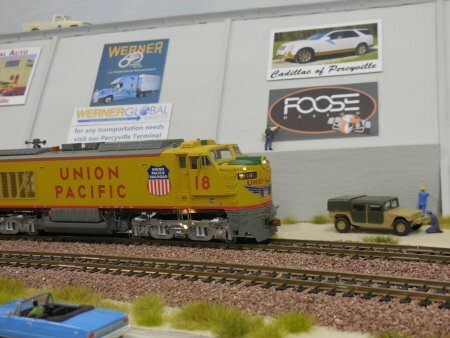 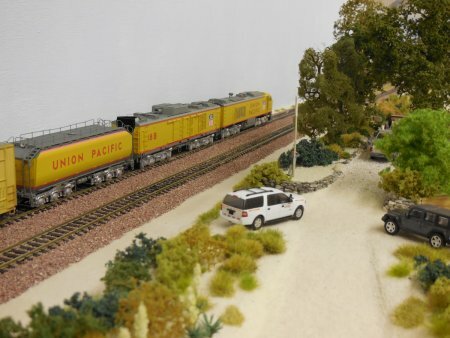 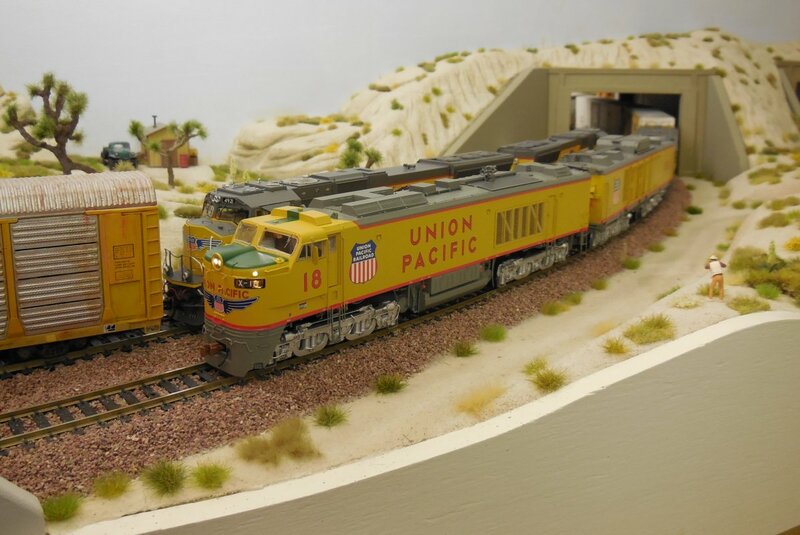 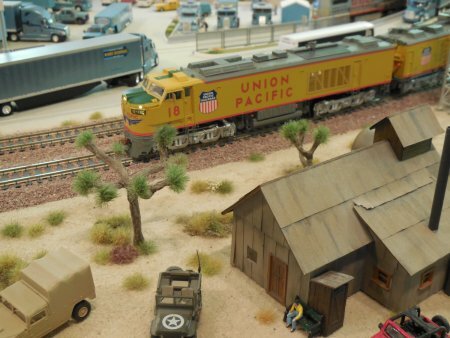 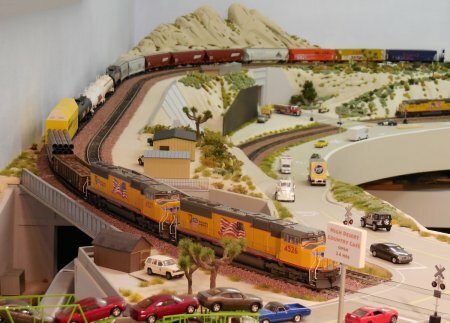 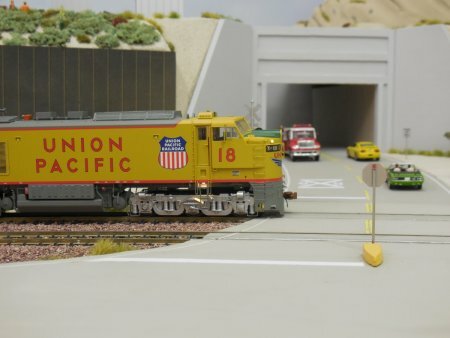 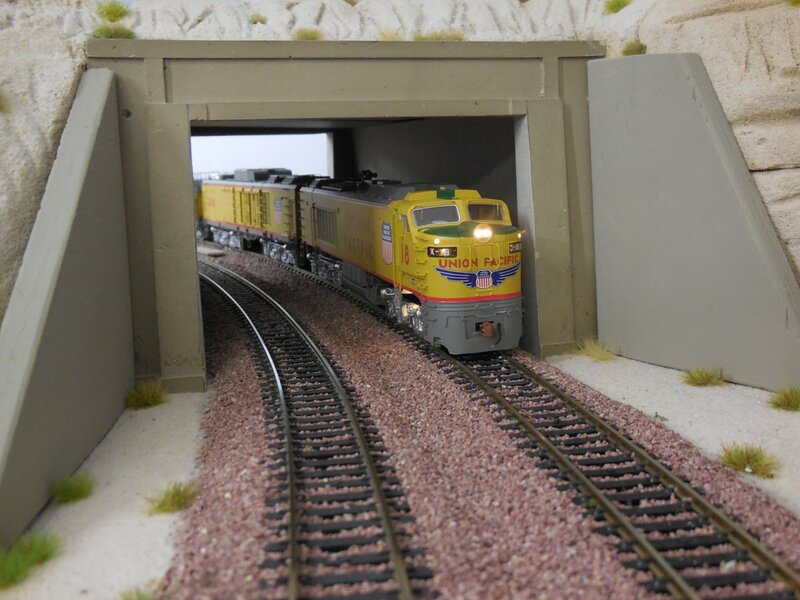 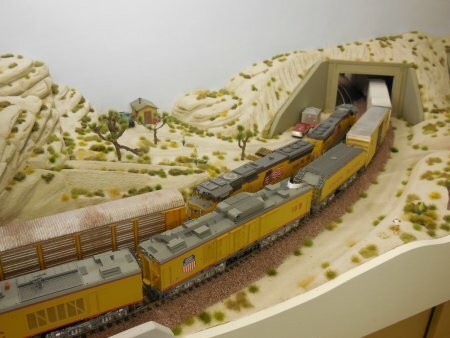 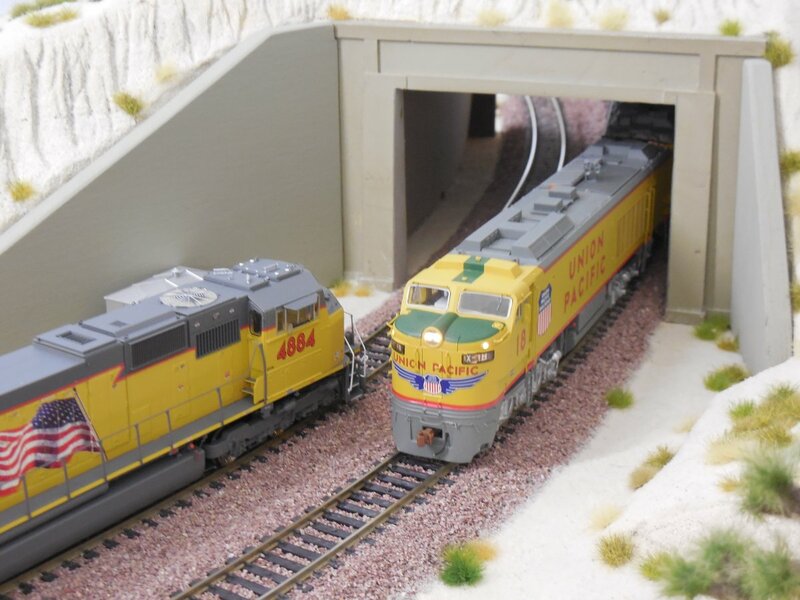 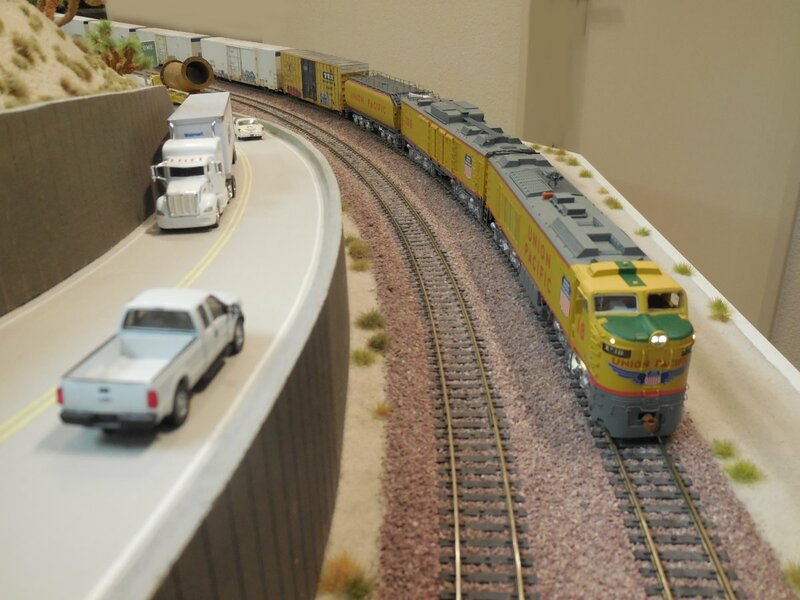 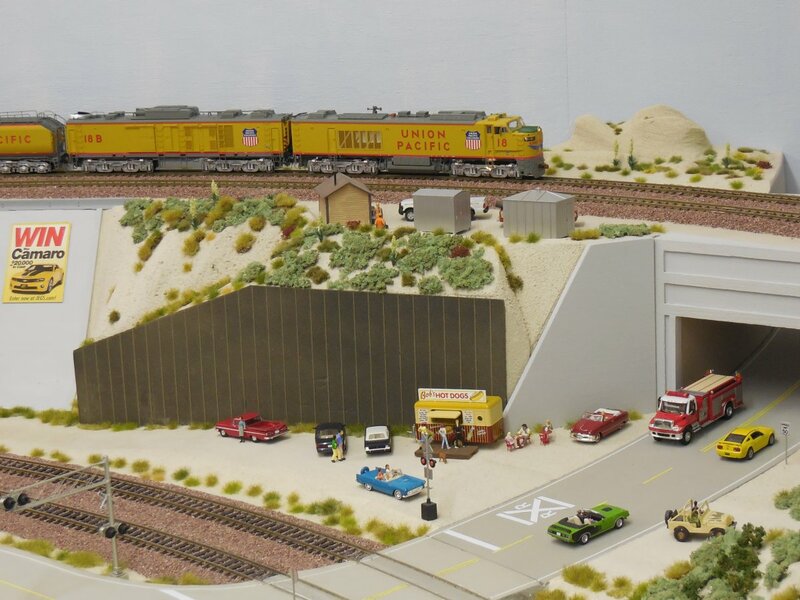 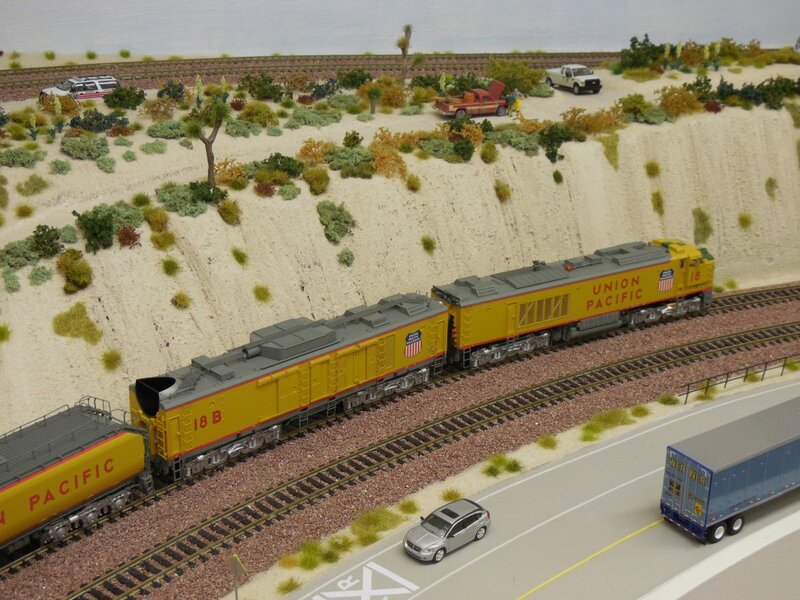 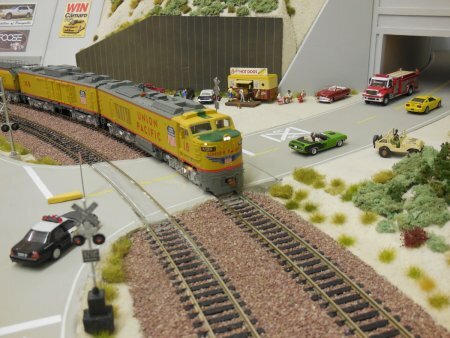 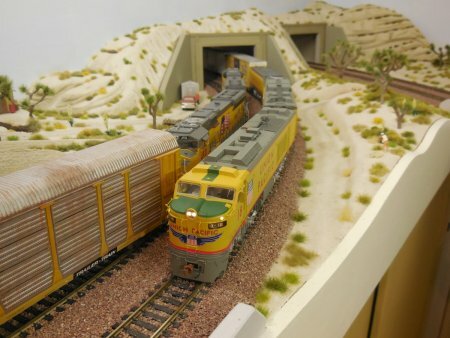 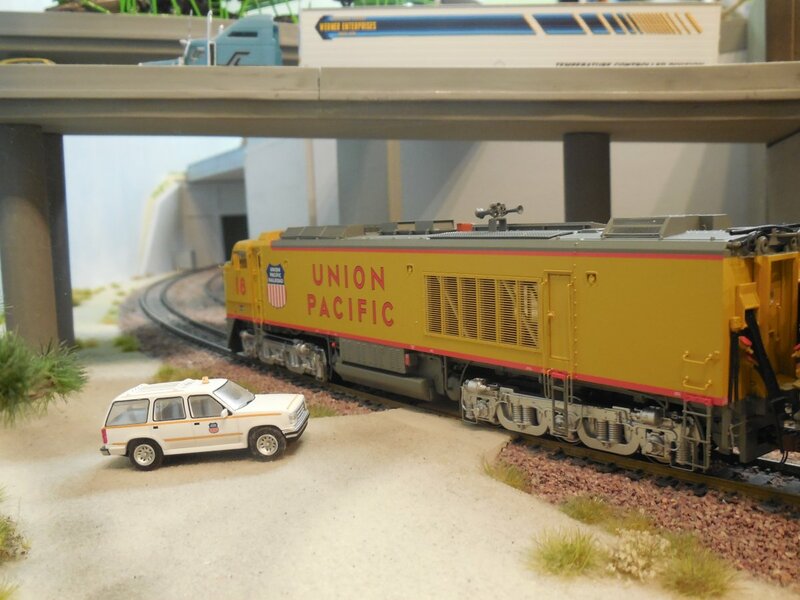 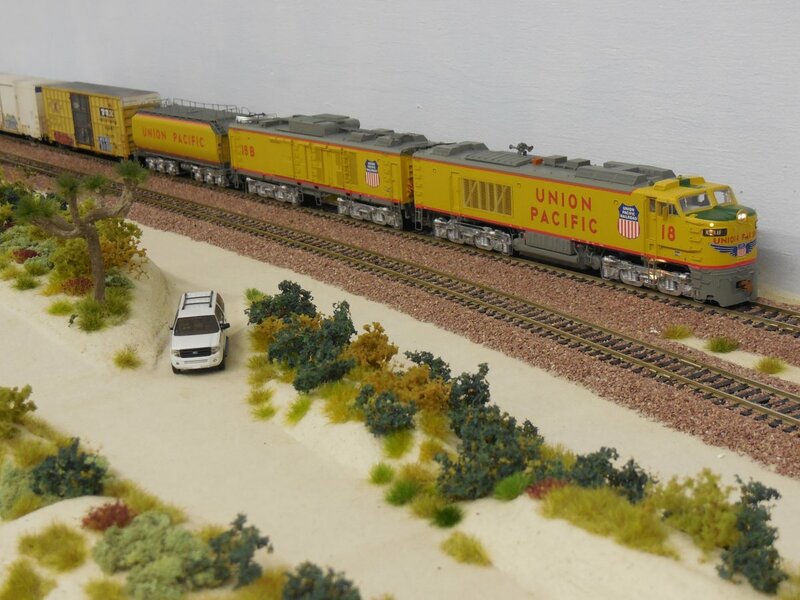 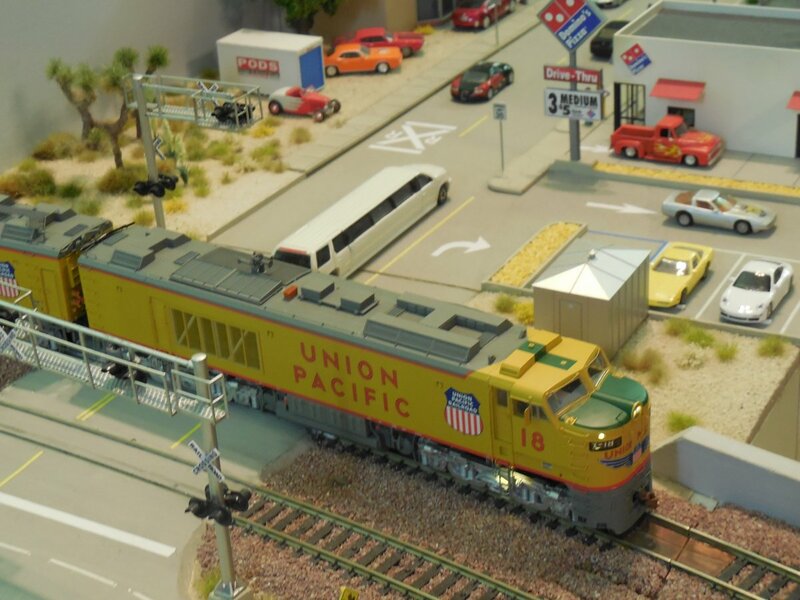 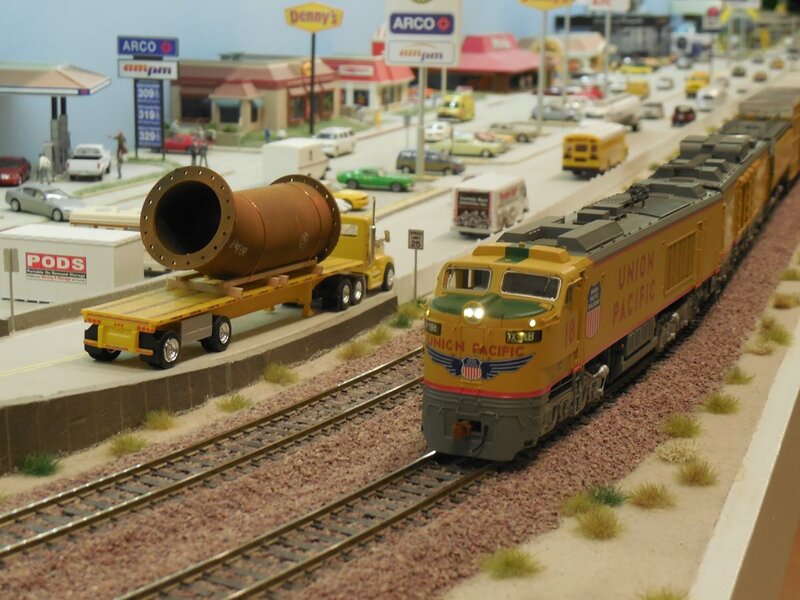 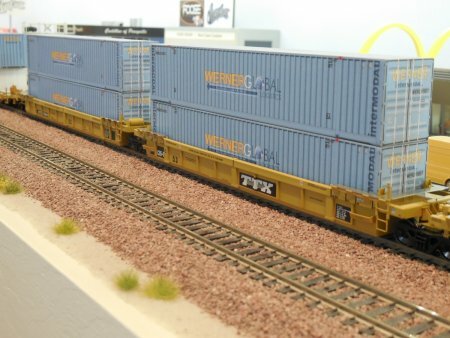 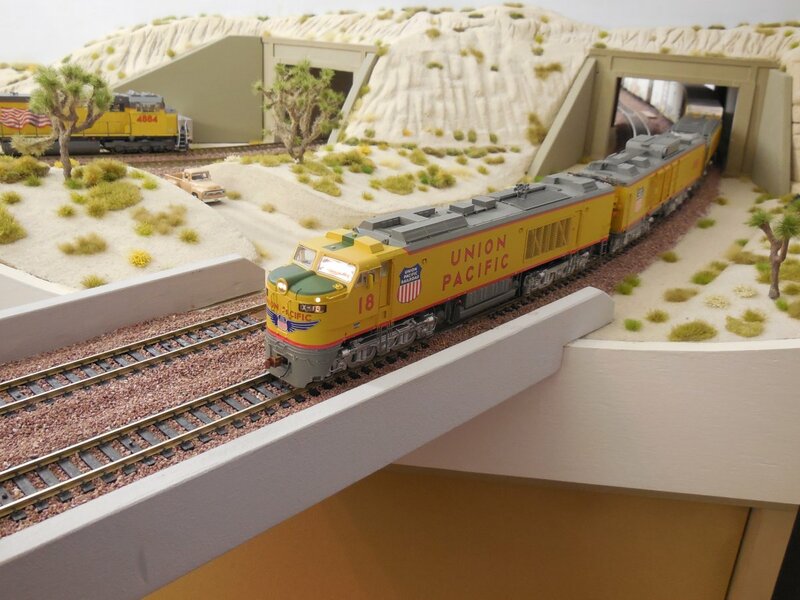 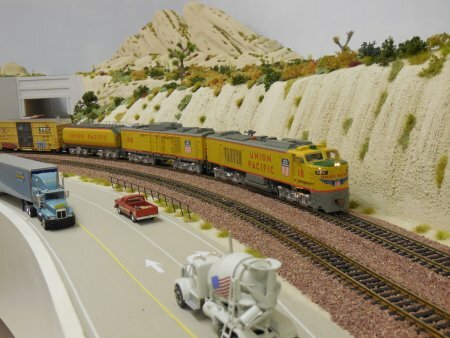 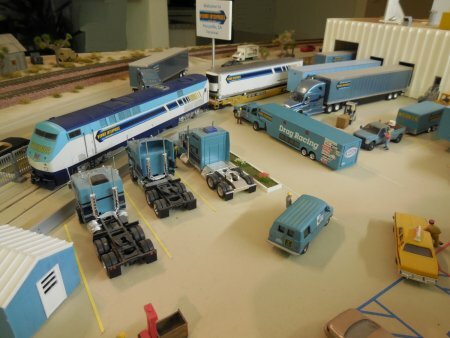 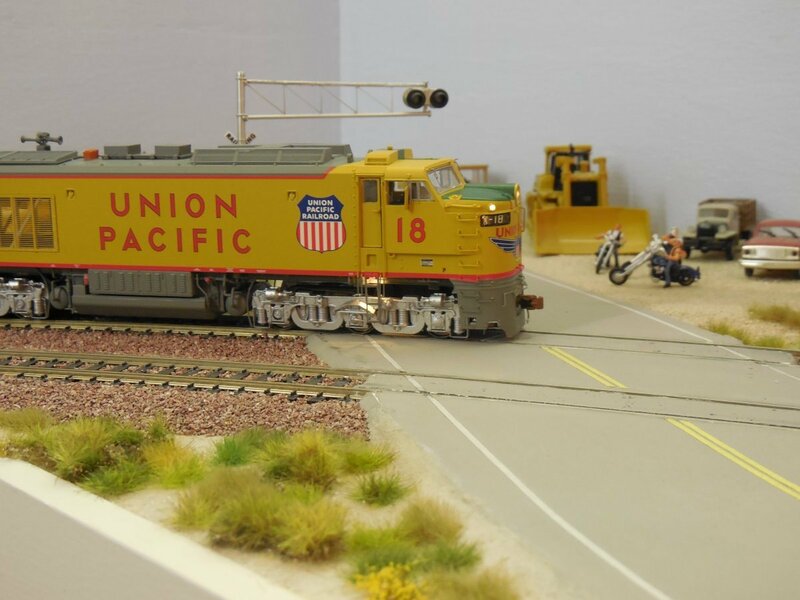 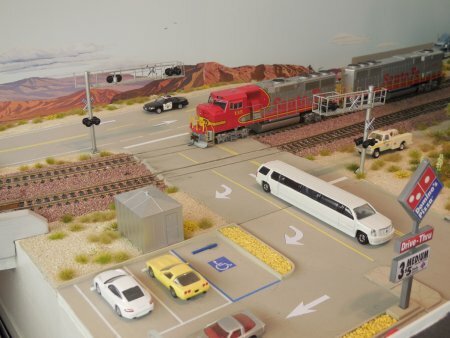 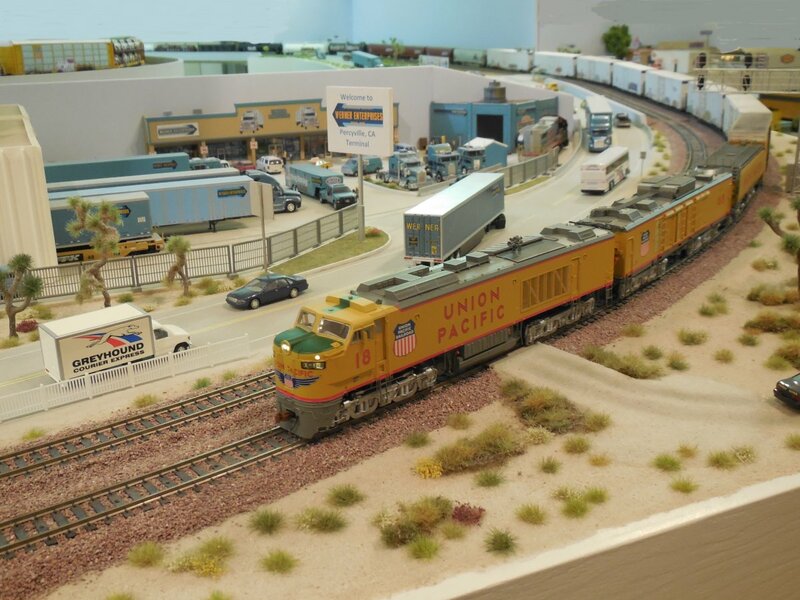 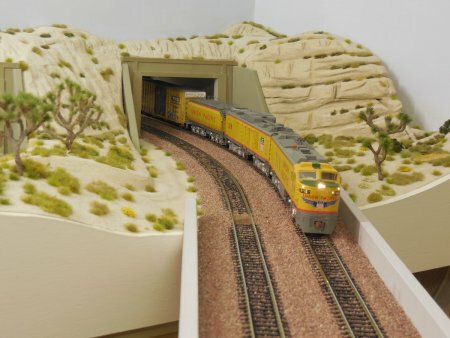 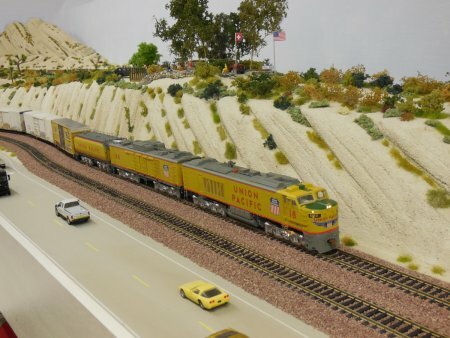 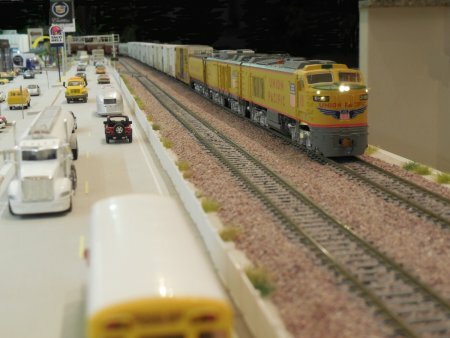 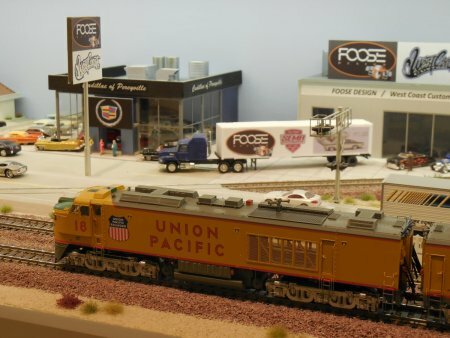 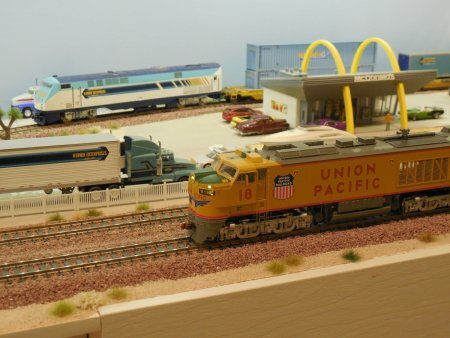 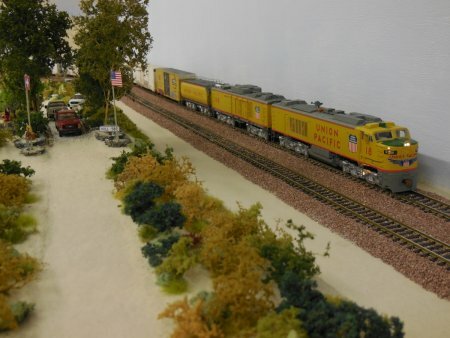 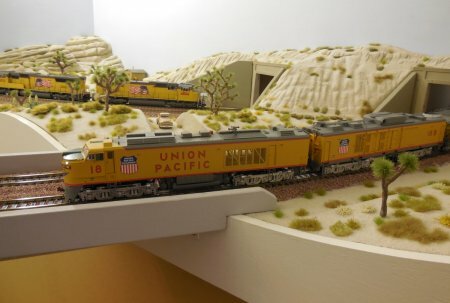 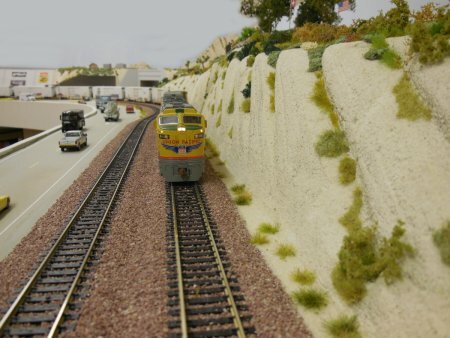 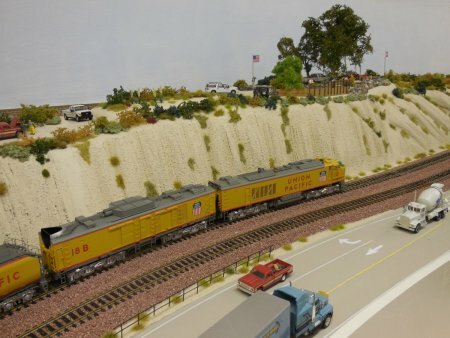 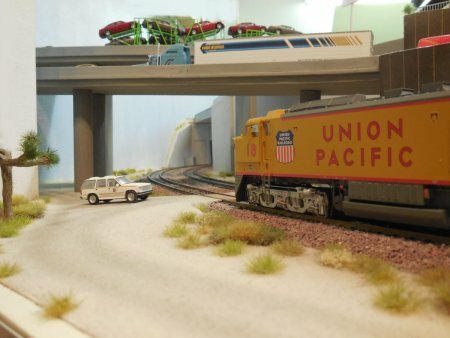 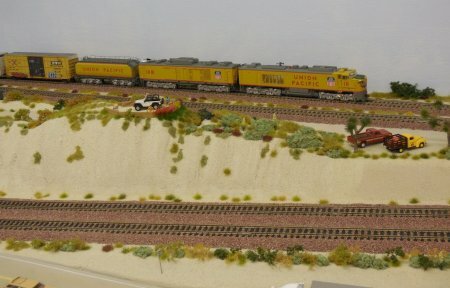 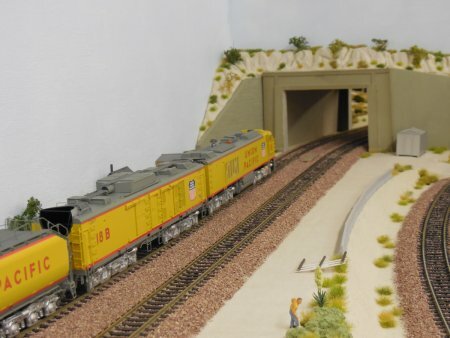 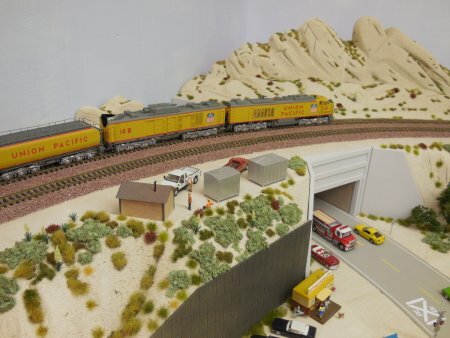 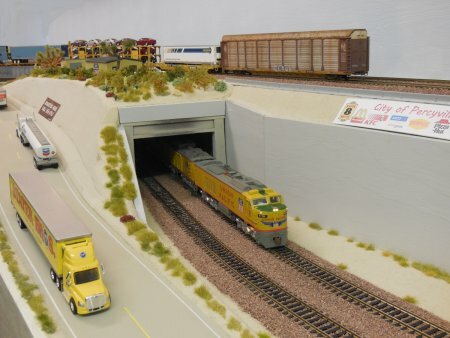 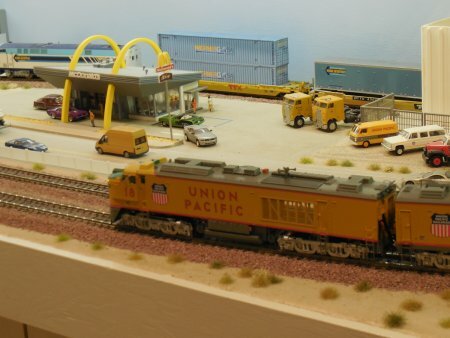 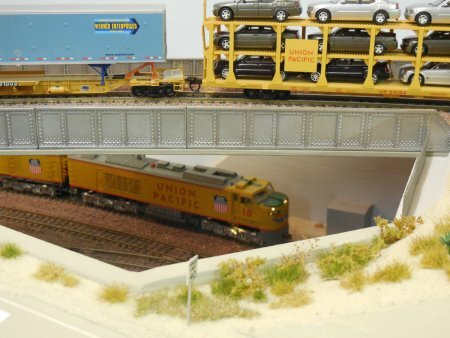 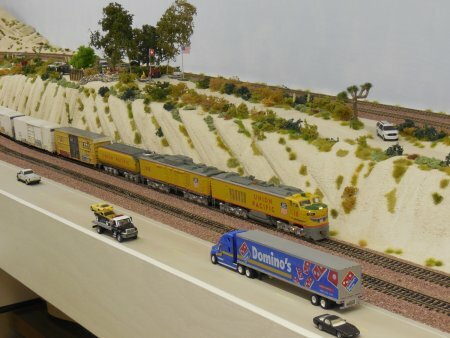 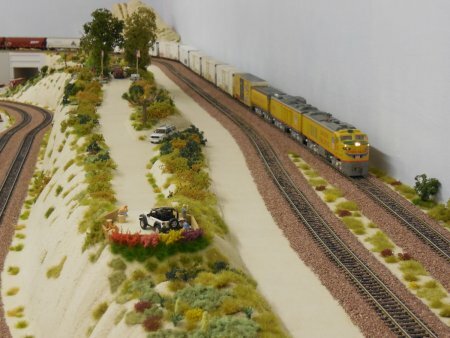 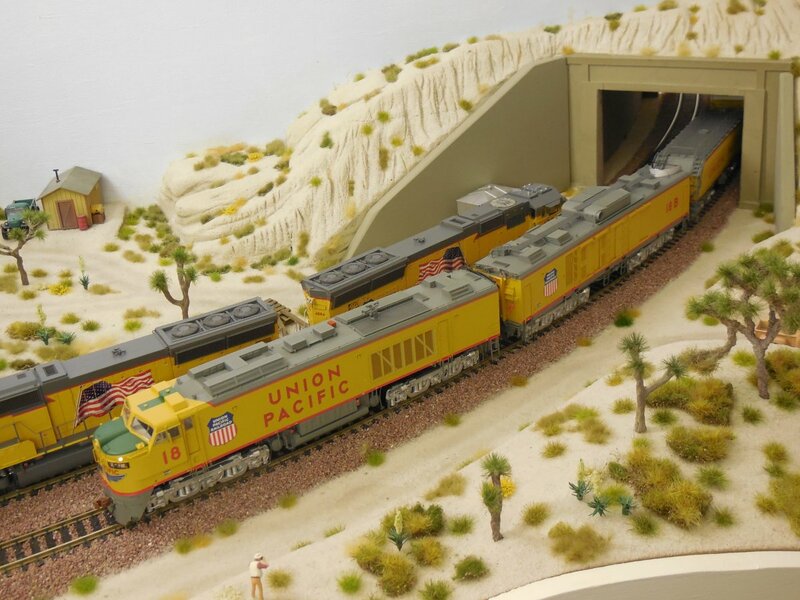 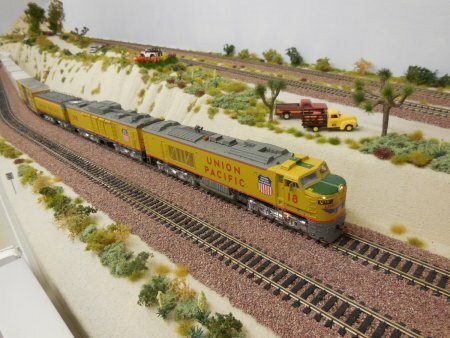 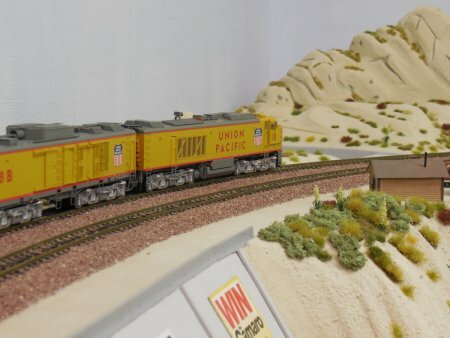 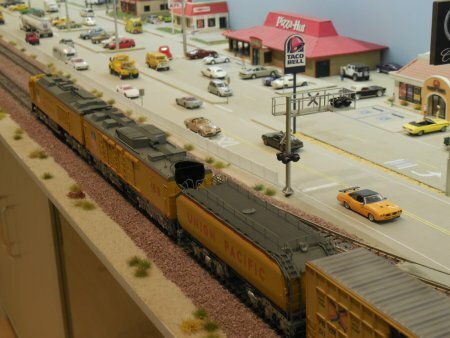 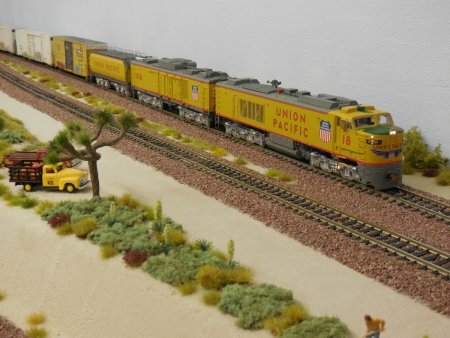 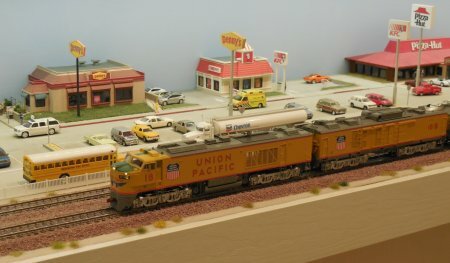 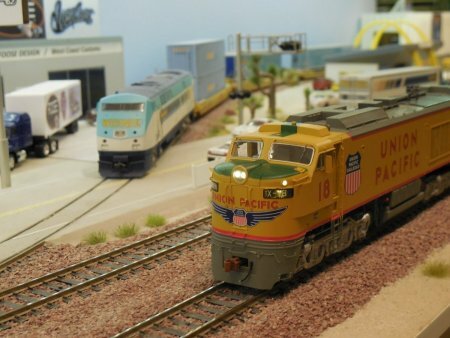 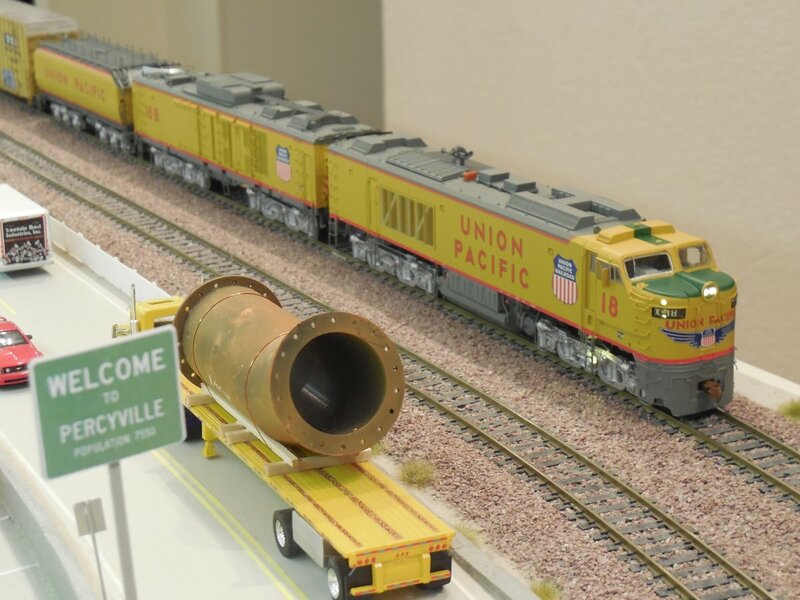 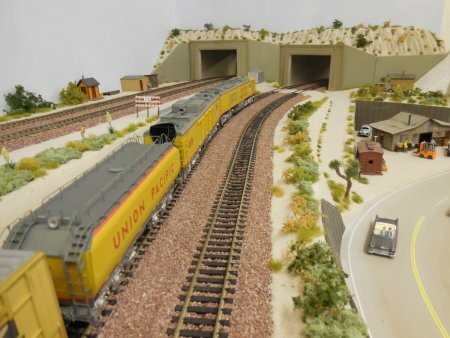 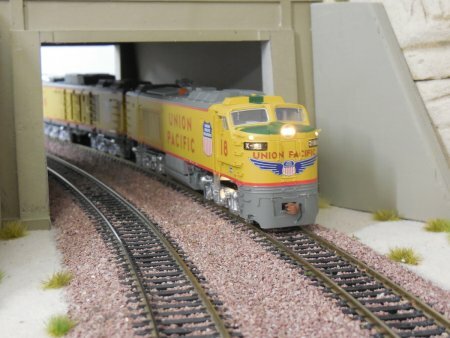 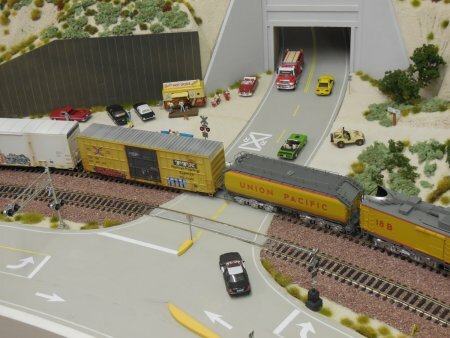 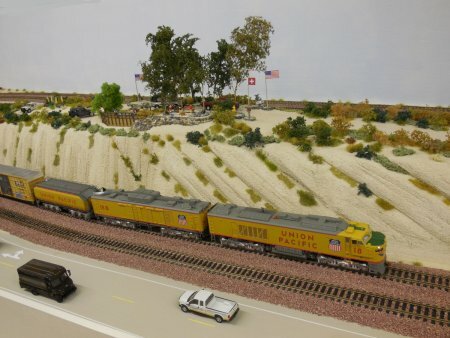 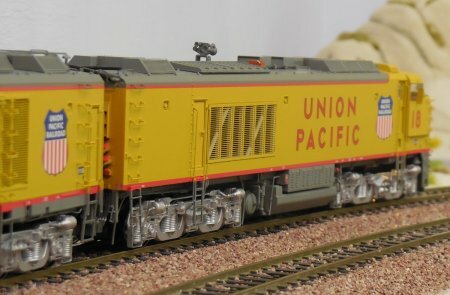 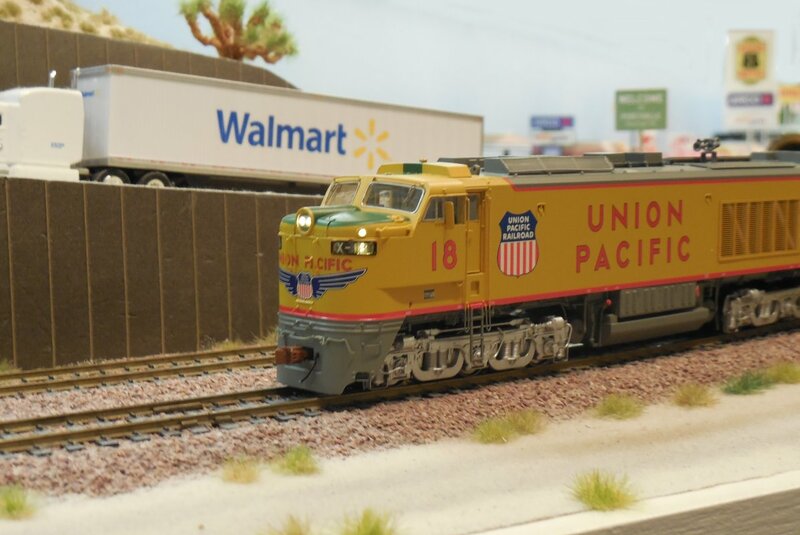 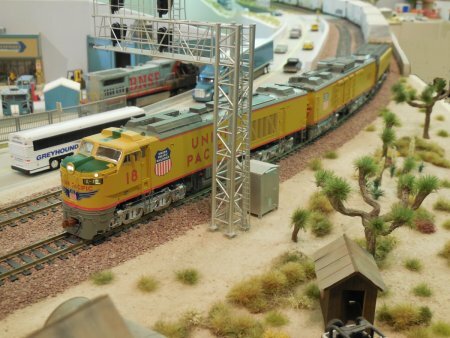 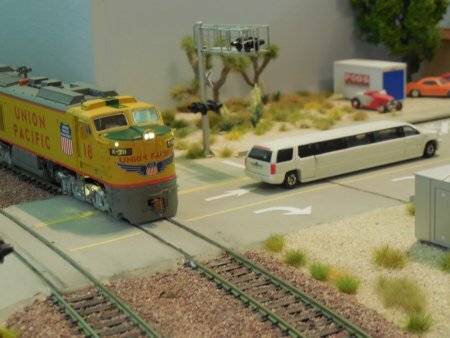 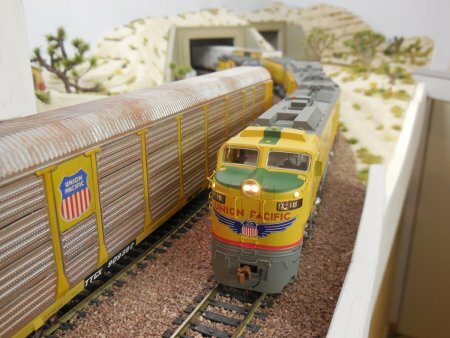 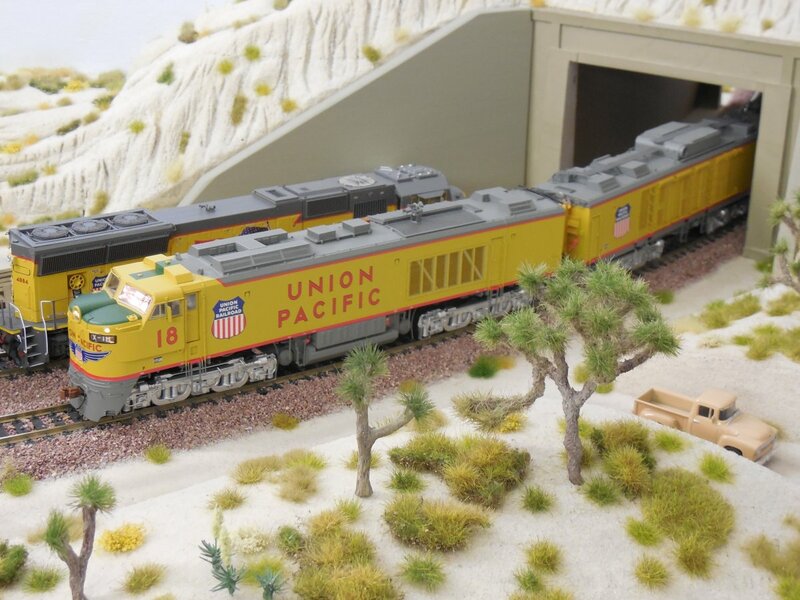 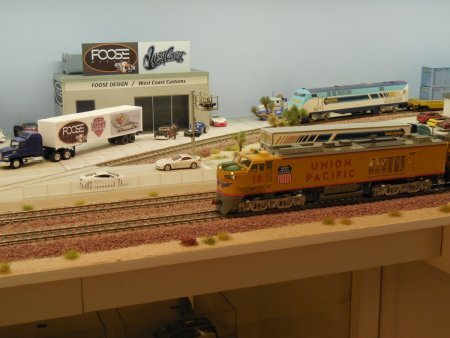 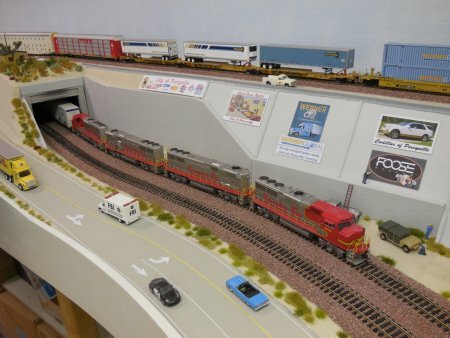 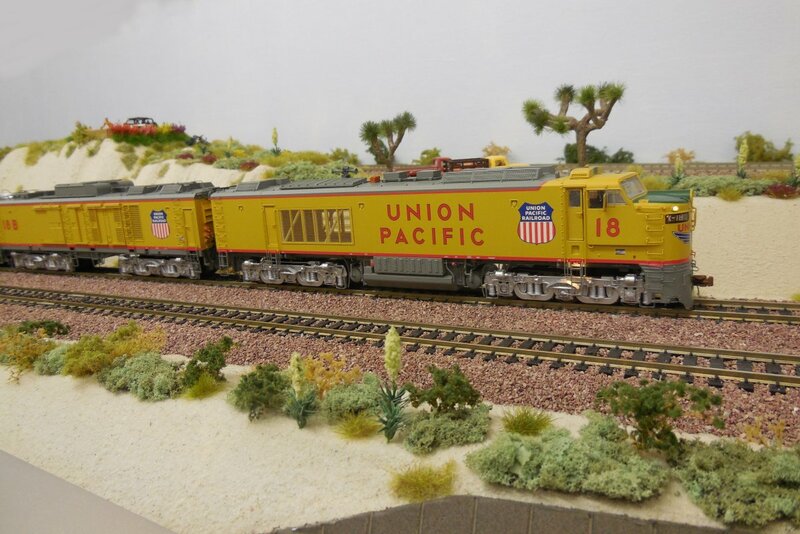 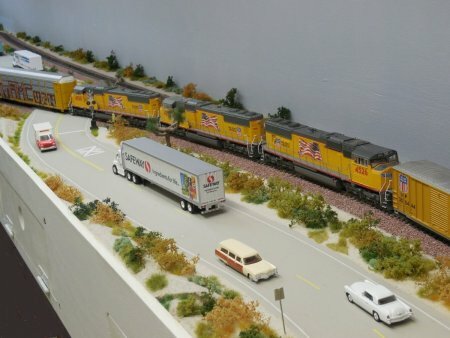 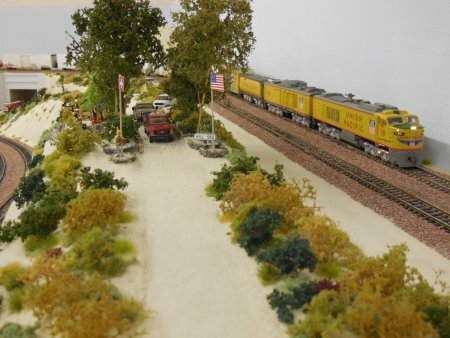 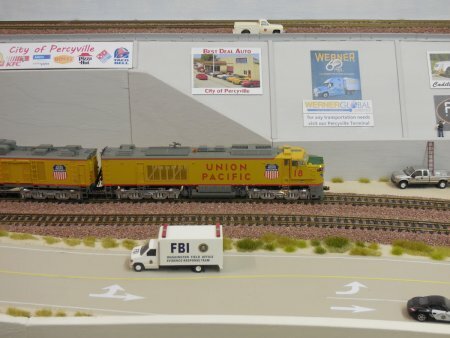 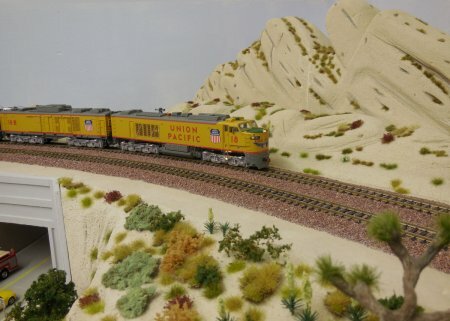 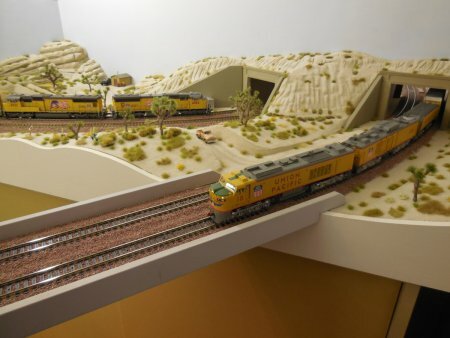 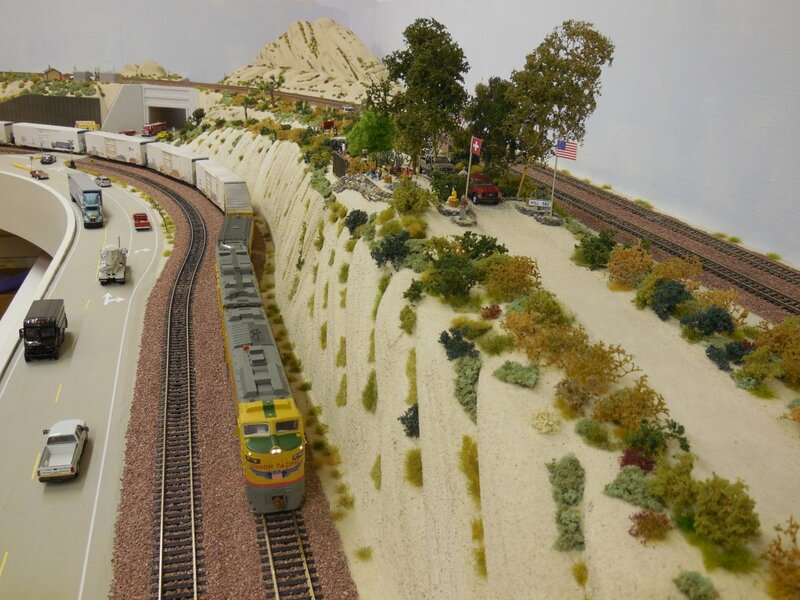 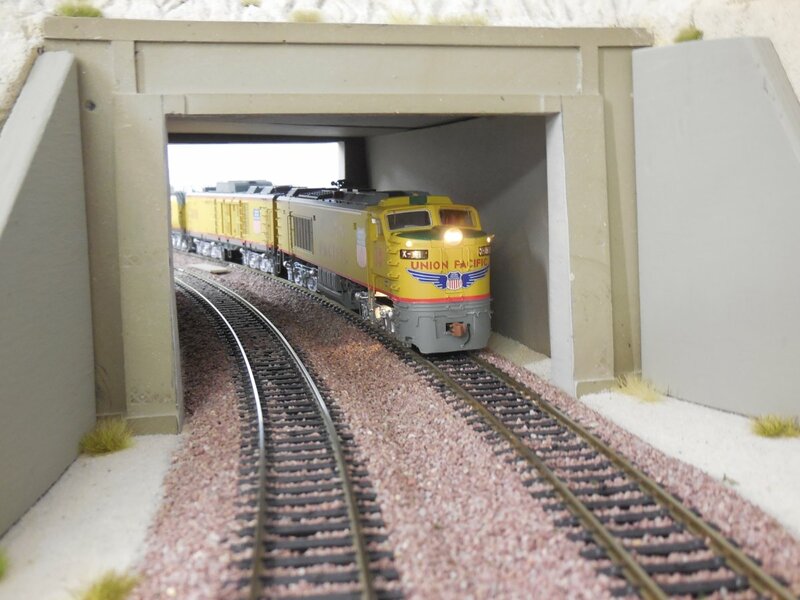 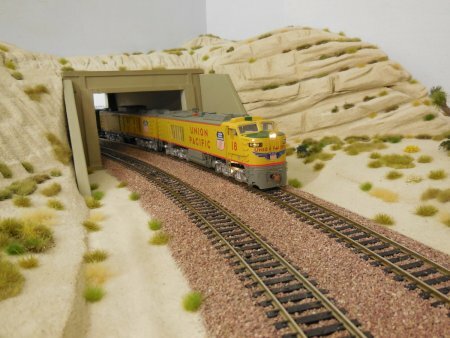 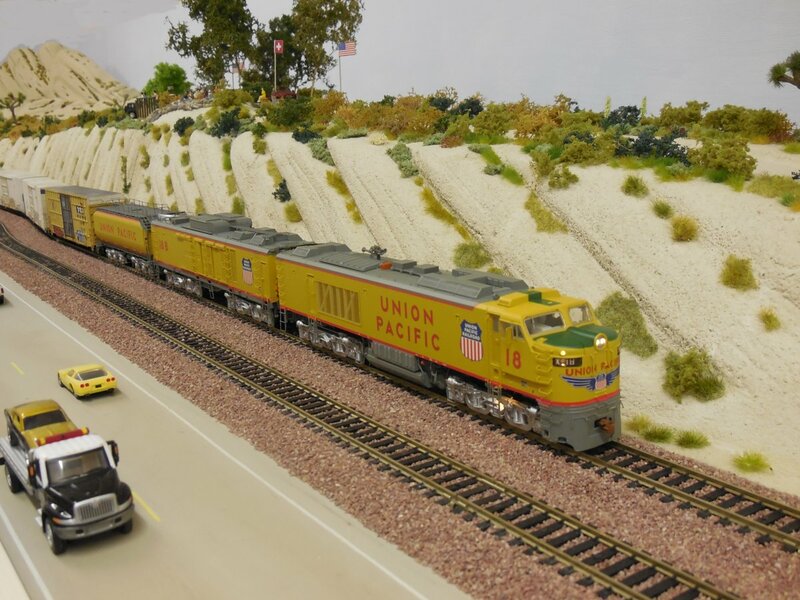 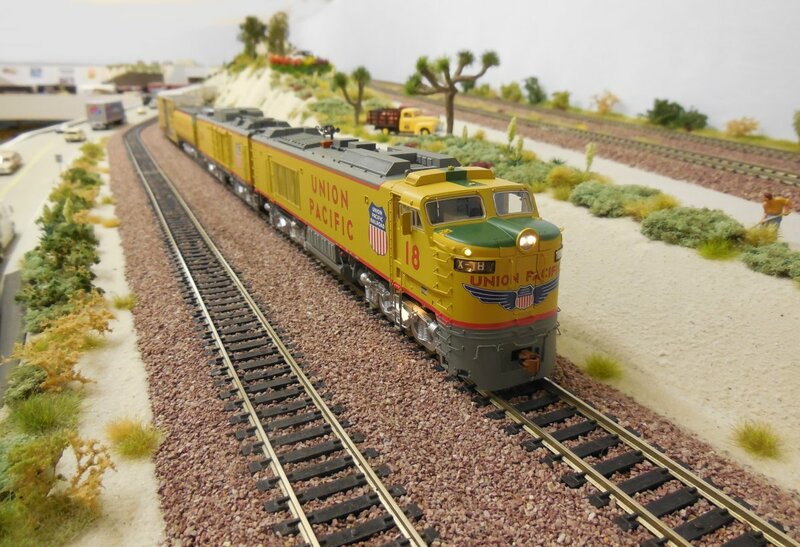 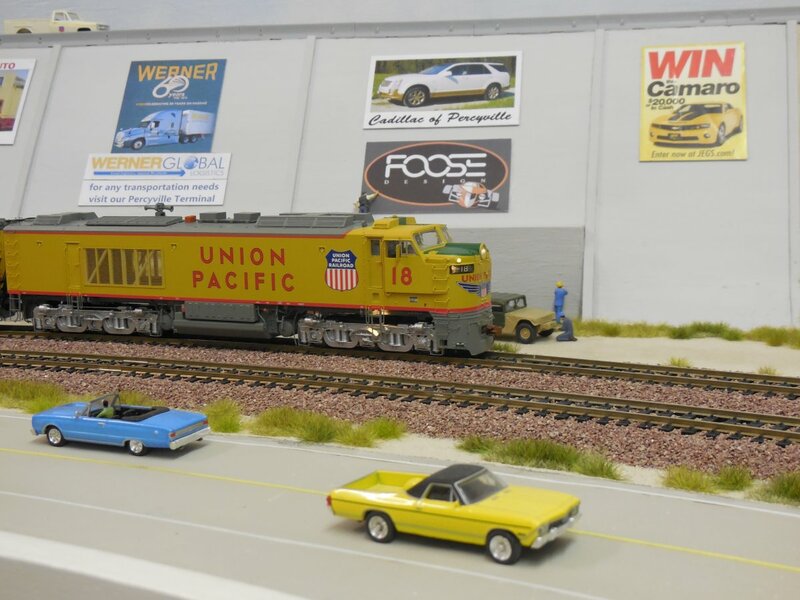 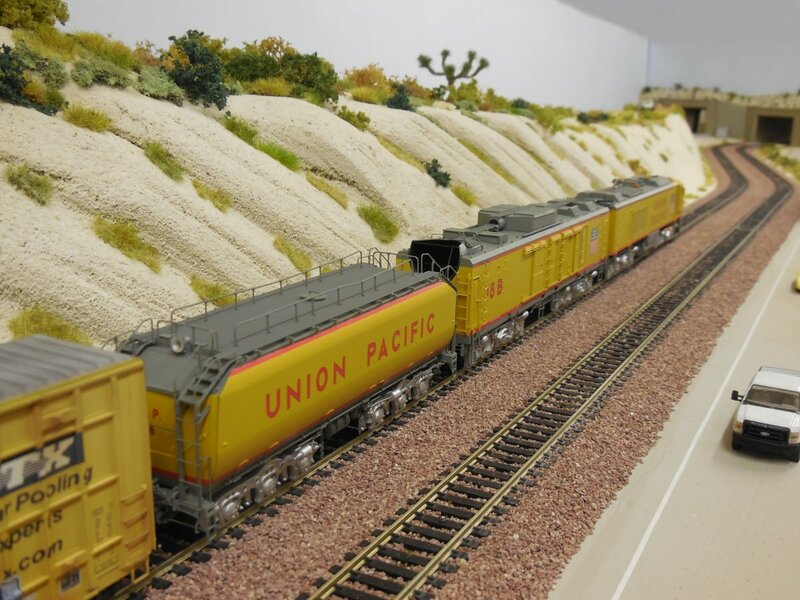 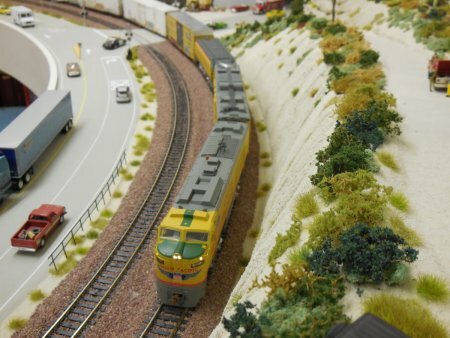 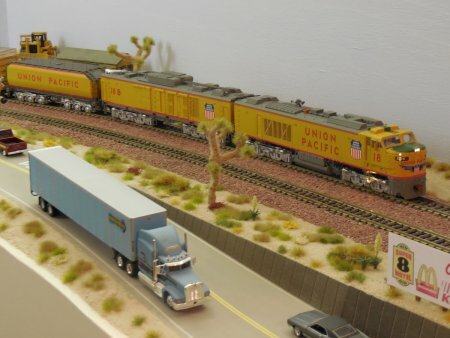 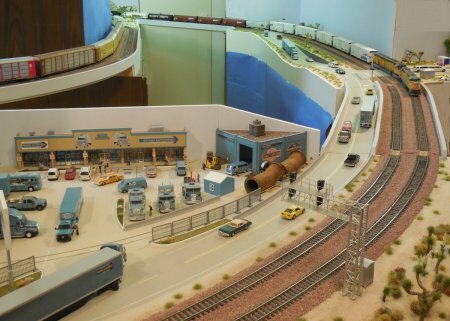 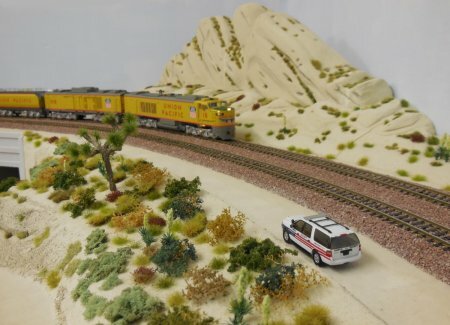 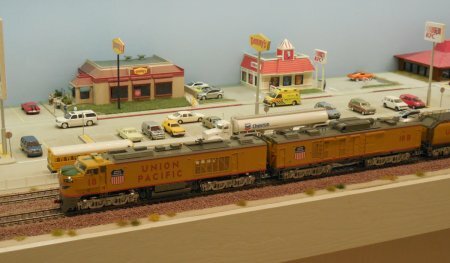 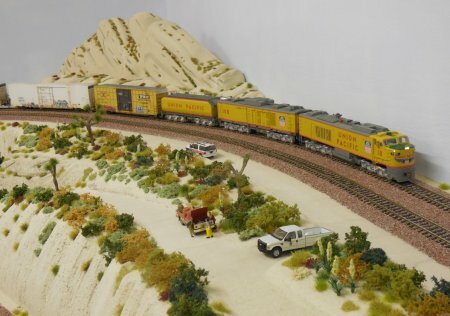 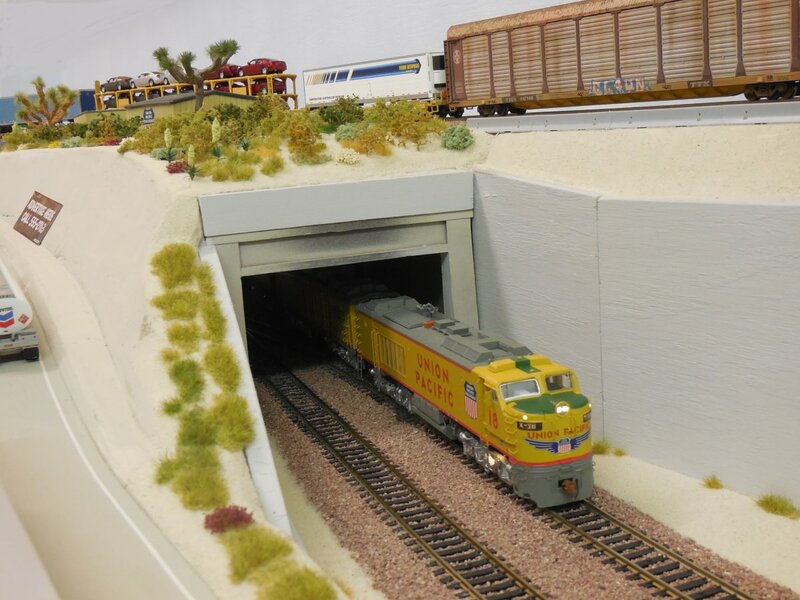 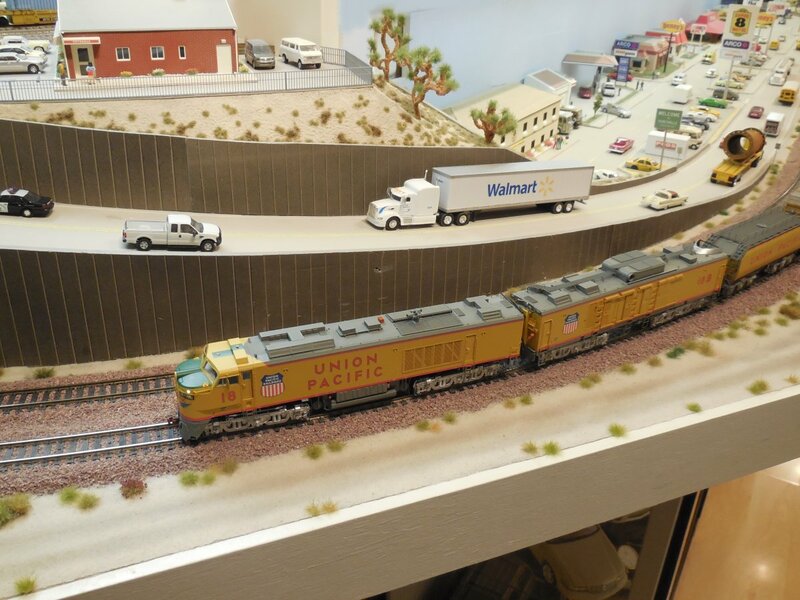 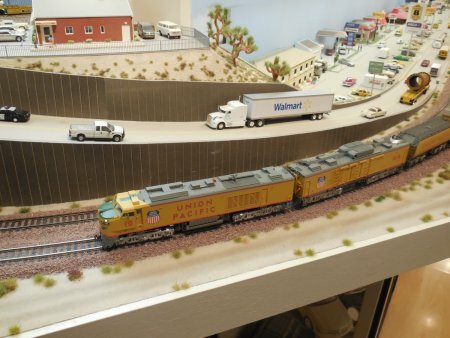 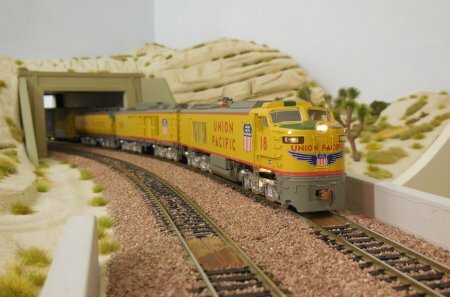 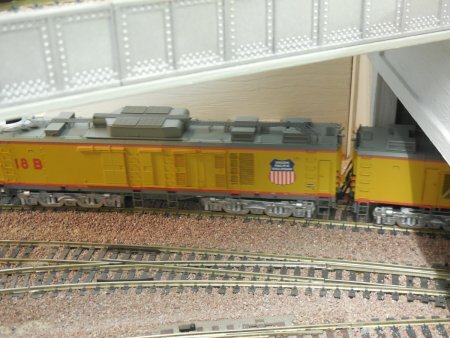 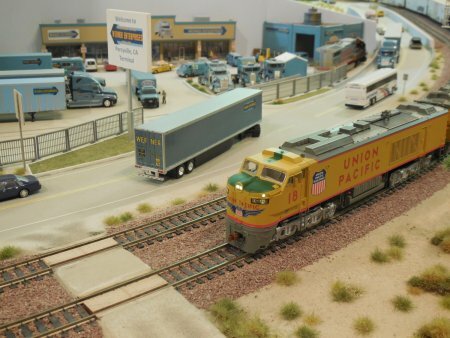 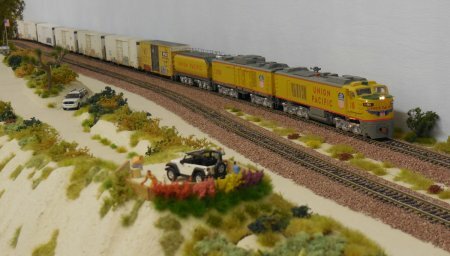 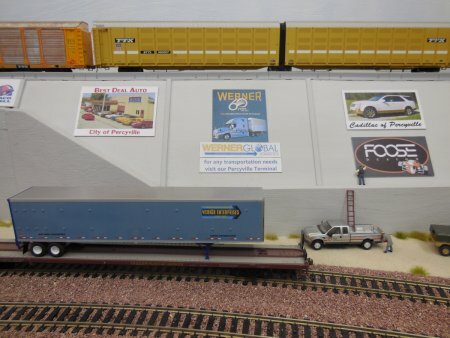 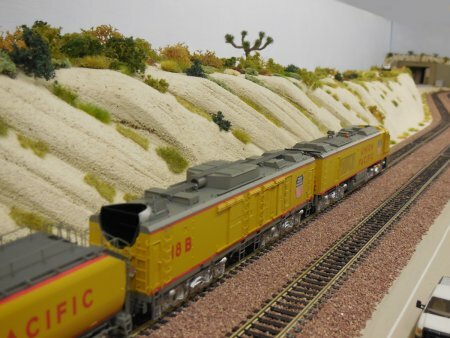 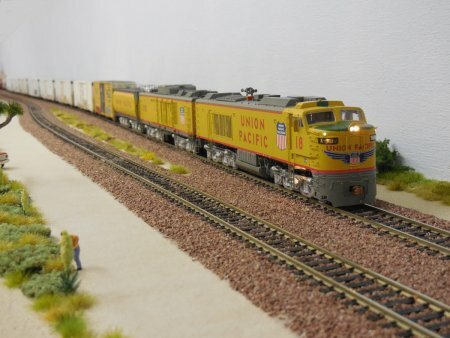 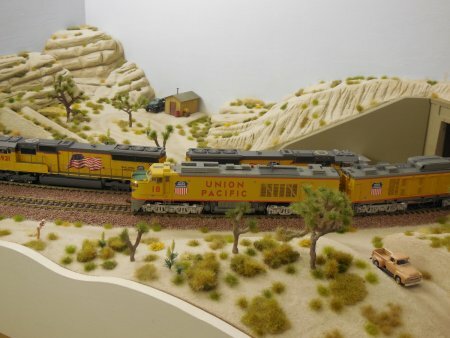 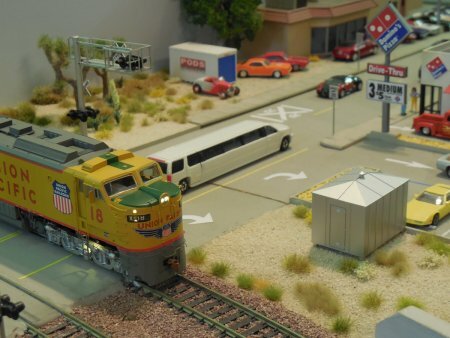 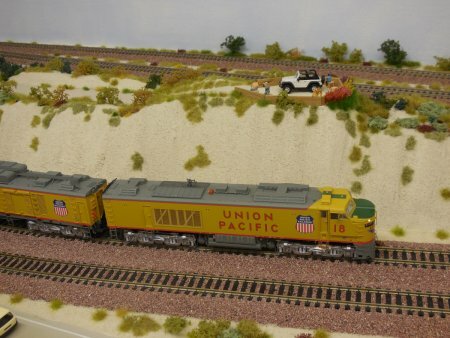 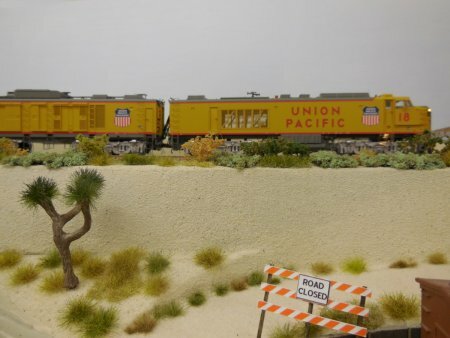 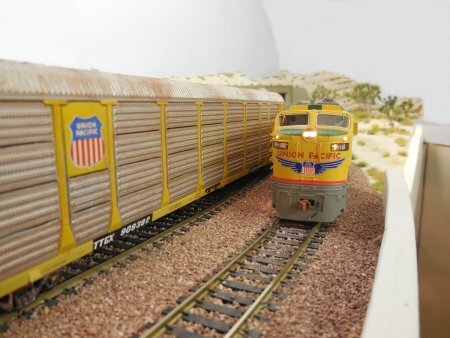 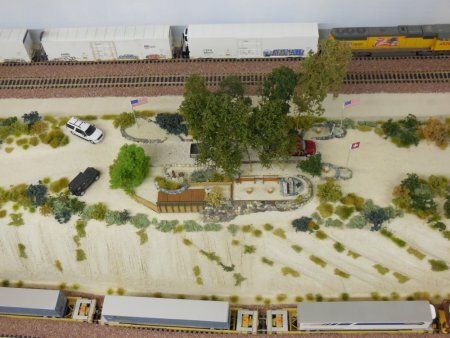 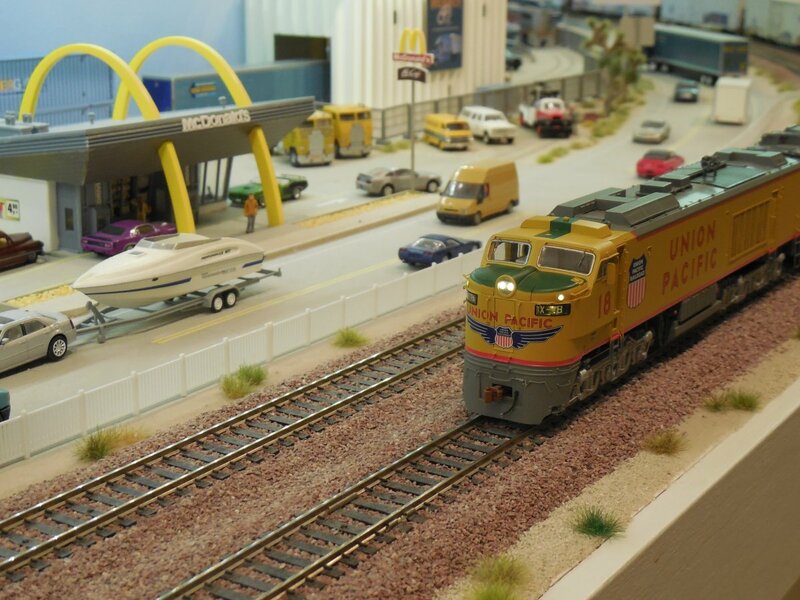 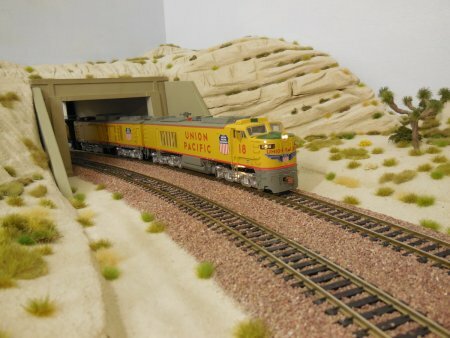 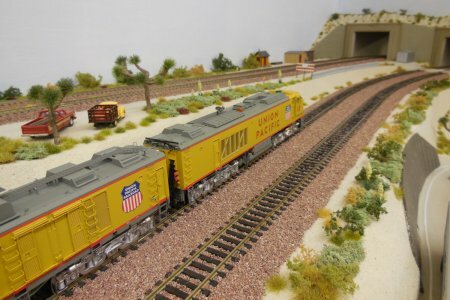 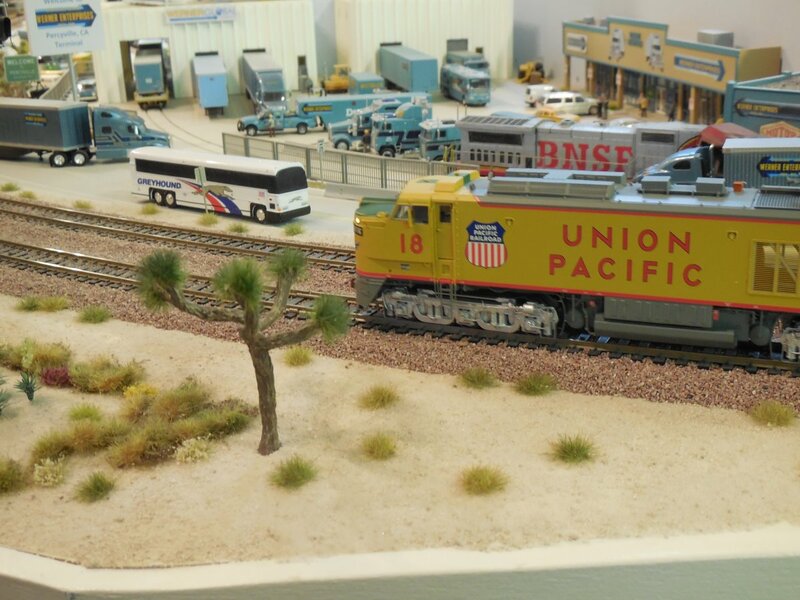 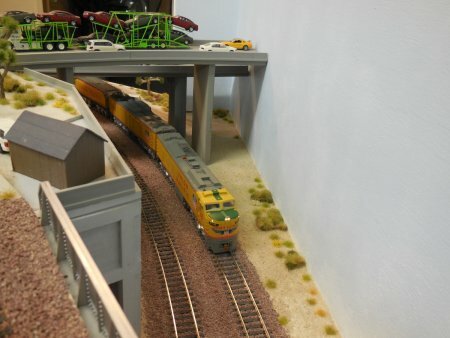 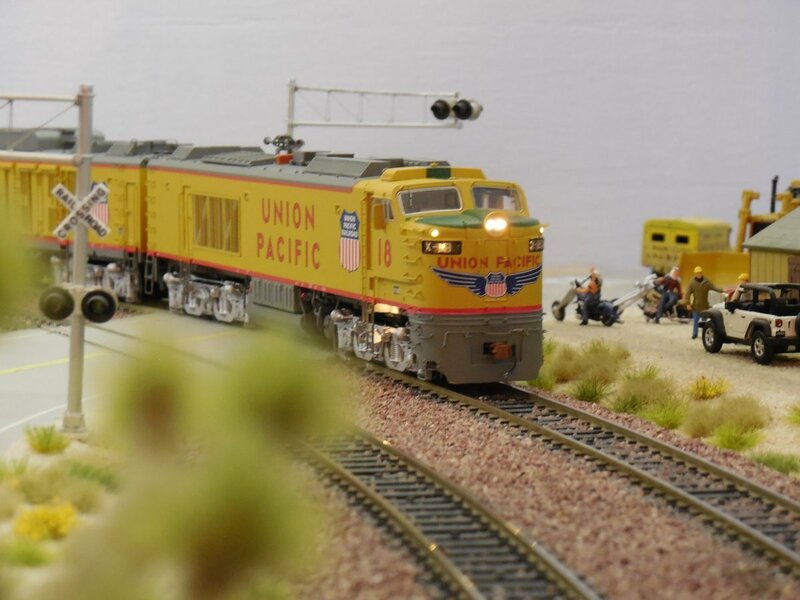 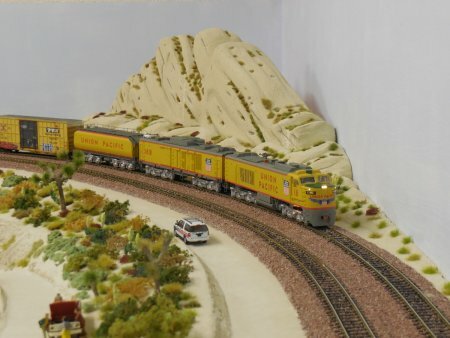 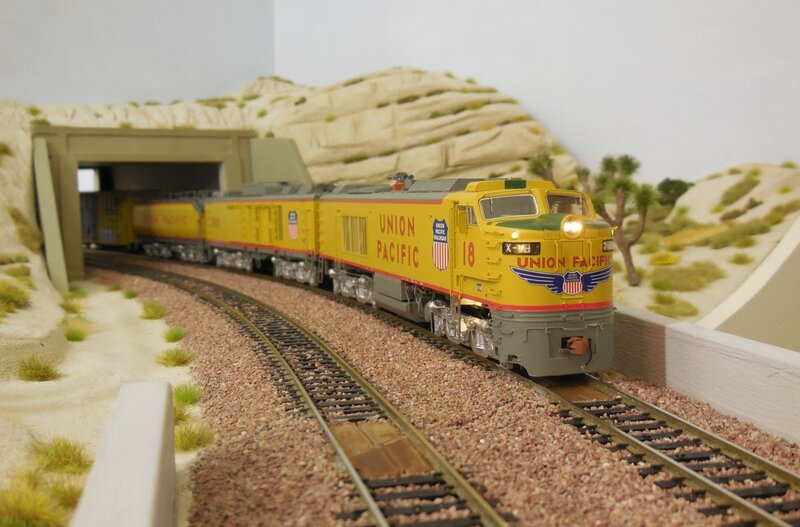 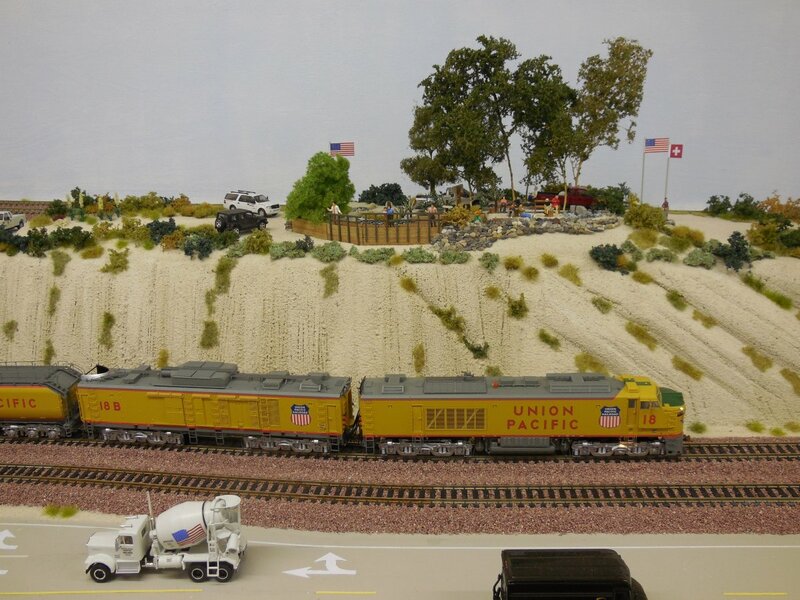 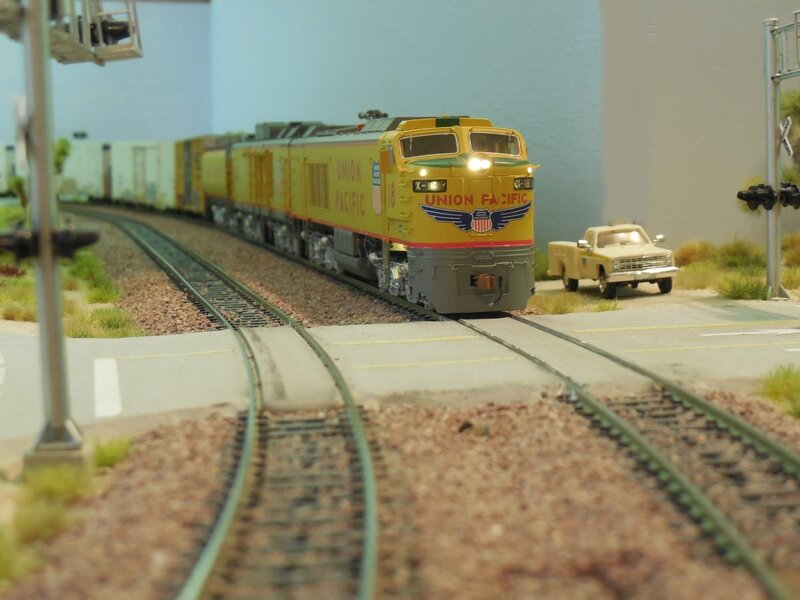 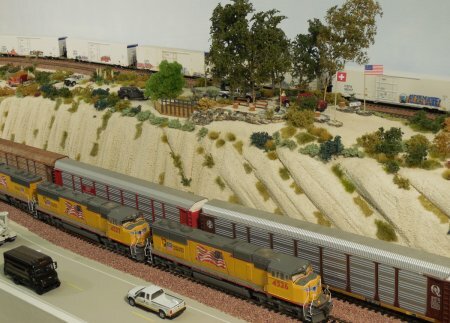 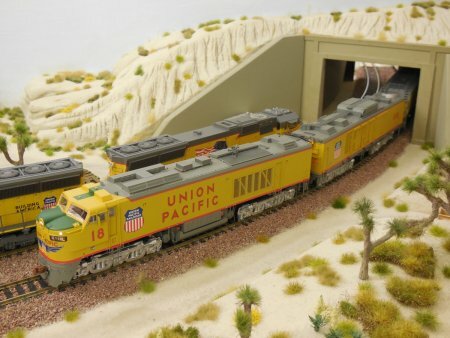 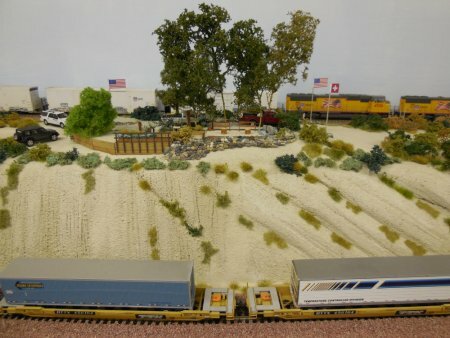 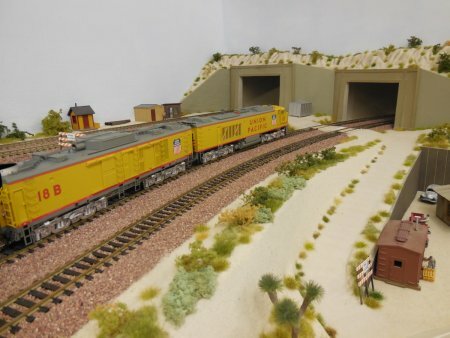 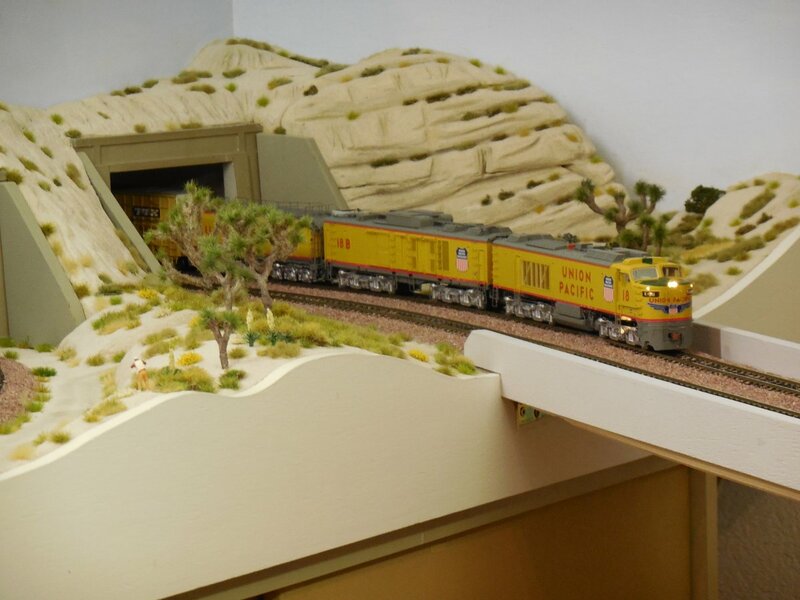 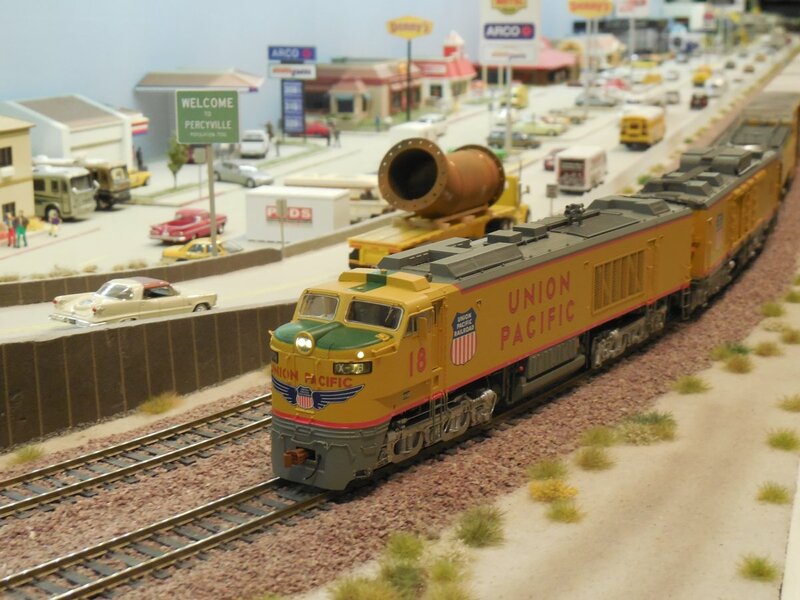 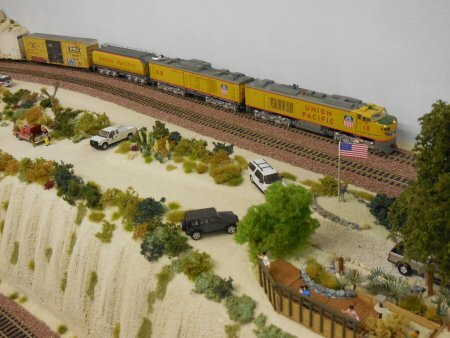 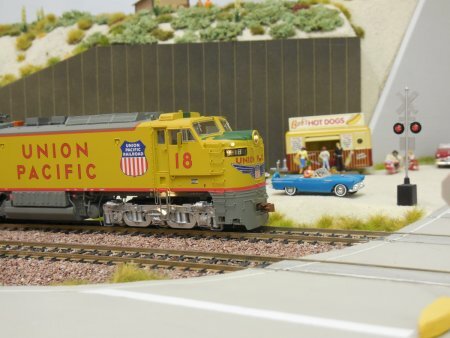 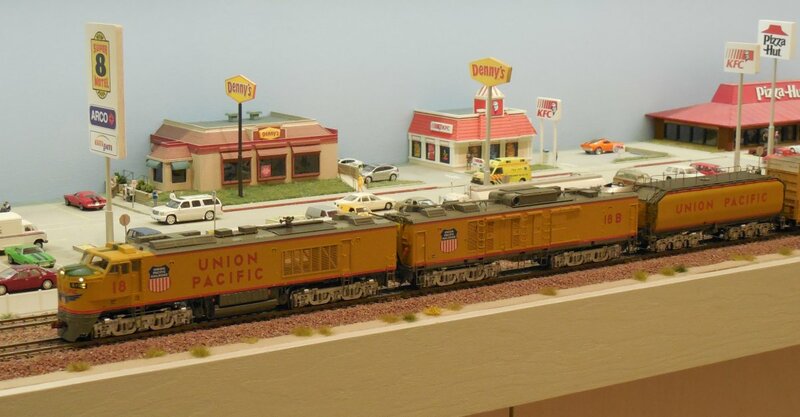 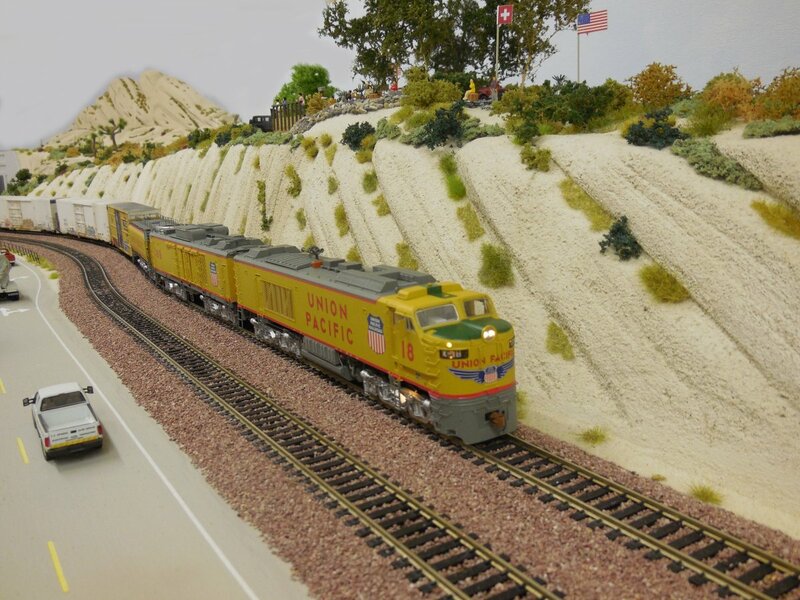 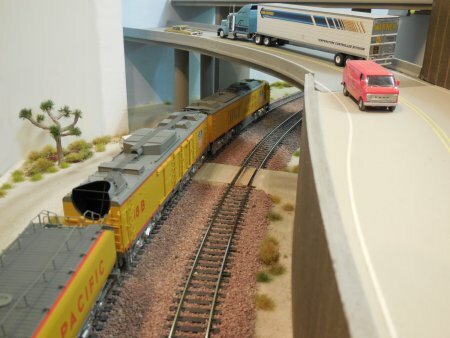 As Scale Trains released their beautiful HO Big Blow, it got a chance to visit a beautiful layout ! 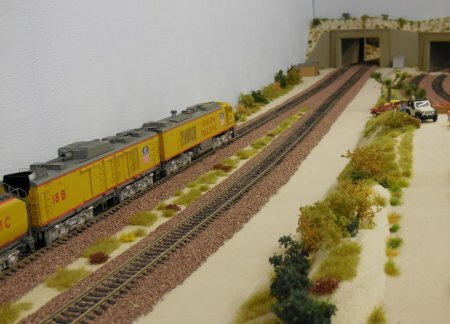 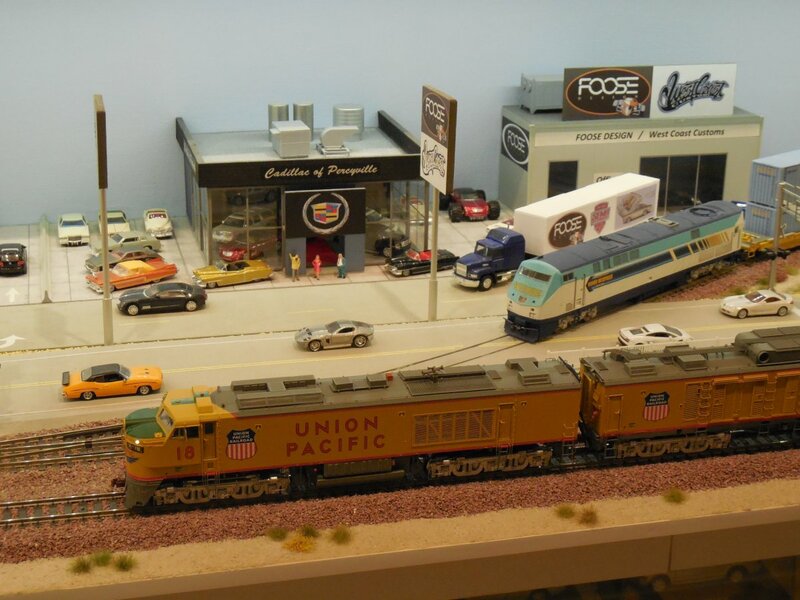 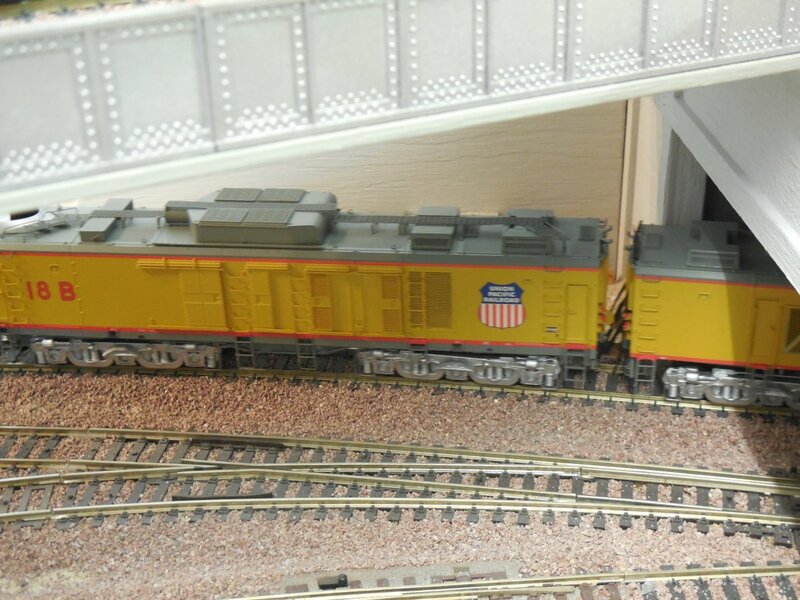 Even my layout is a modern time setting, this excellent model got a chance to come alive in scale. 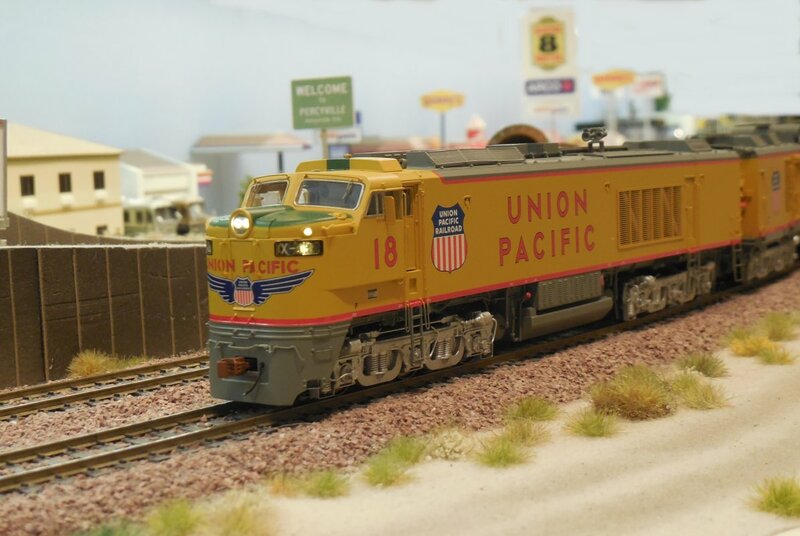 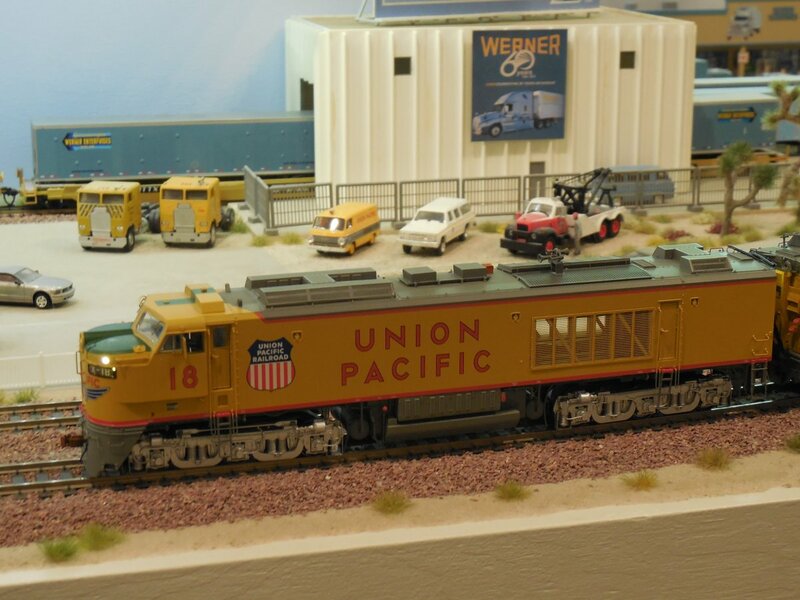 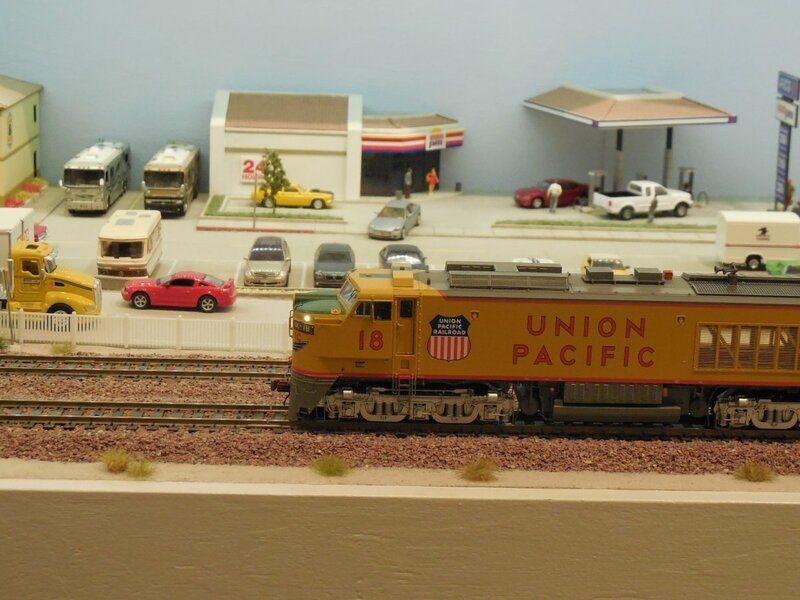 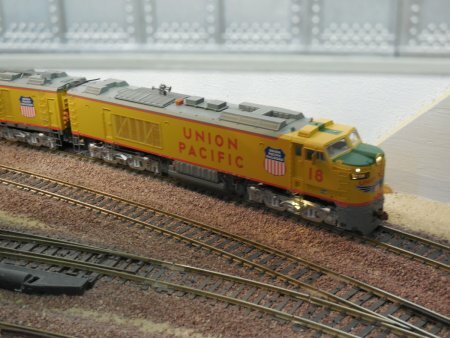 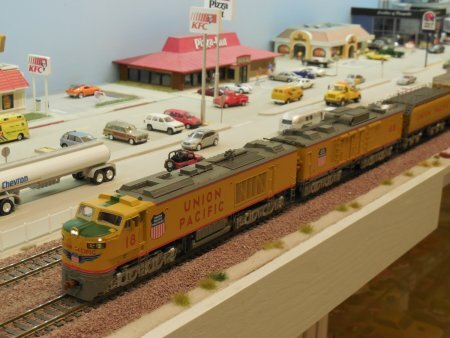 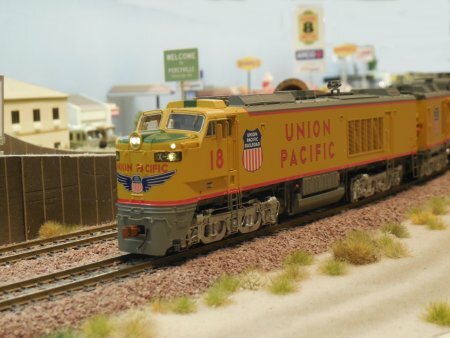 In other words, # 18 (currently on display at Illinois Railway Museum in Union, IL) has been rebuilt and went back into service just for my layout. 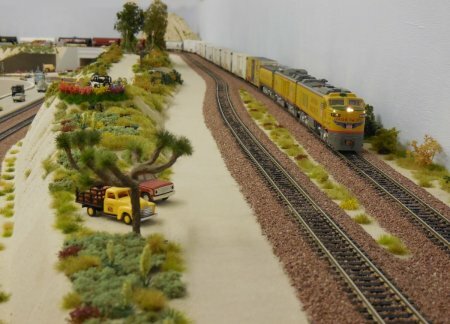 Of course, I am aware, it is just a fantasy, but never the less, it looks great. 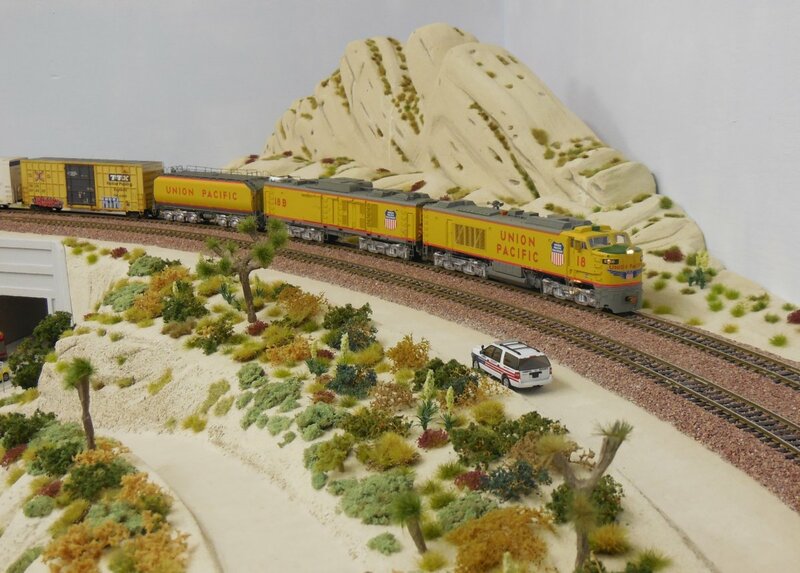 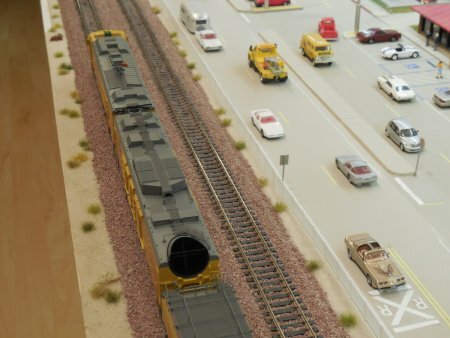 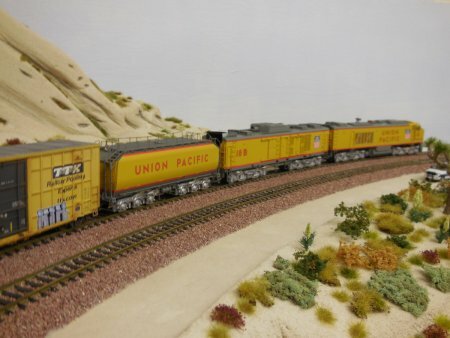 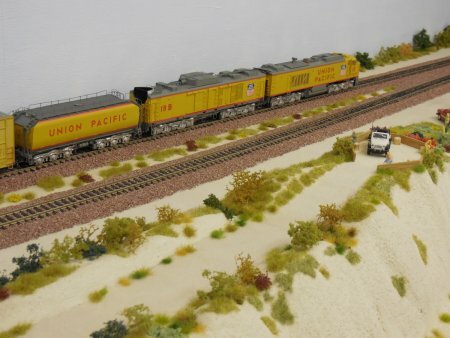 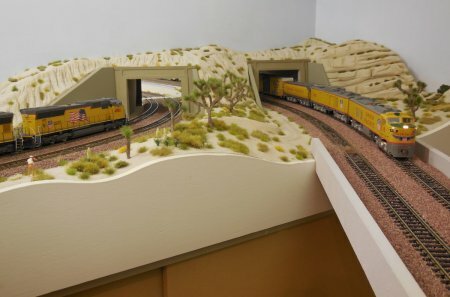 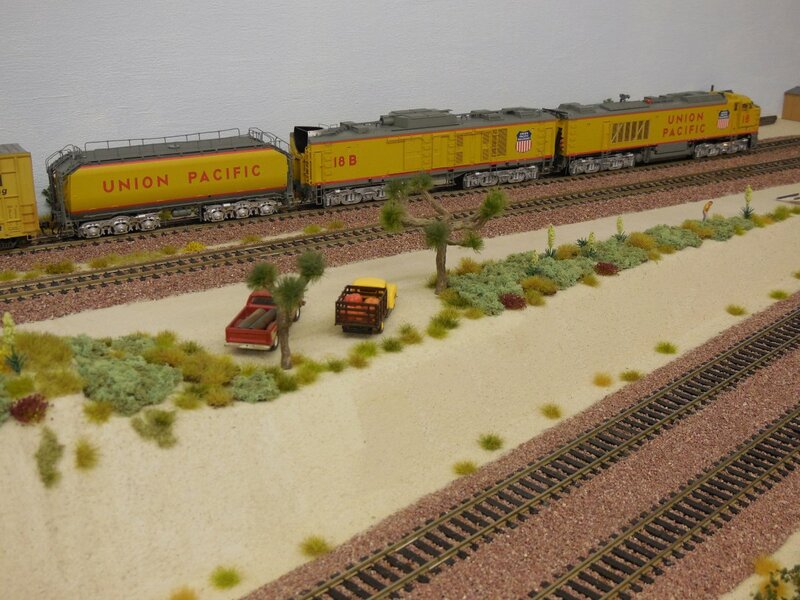 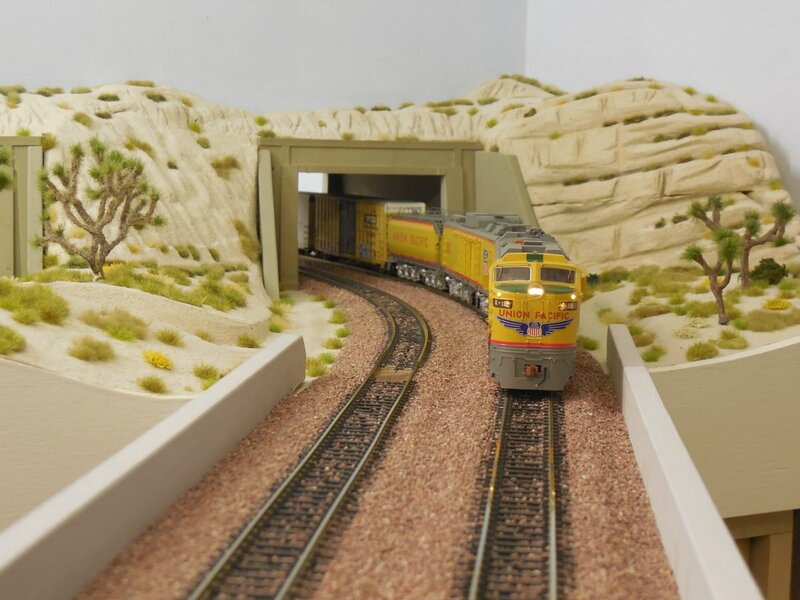 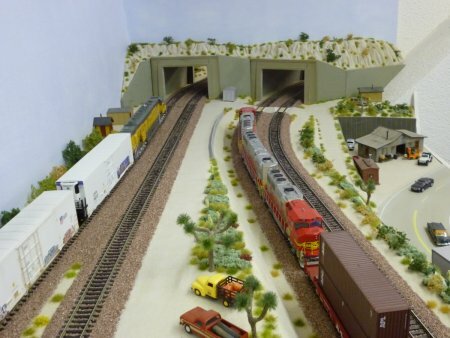 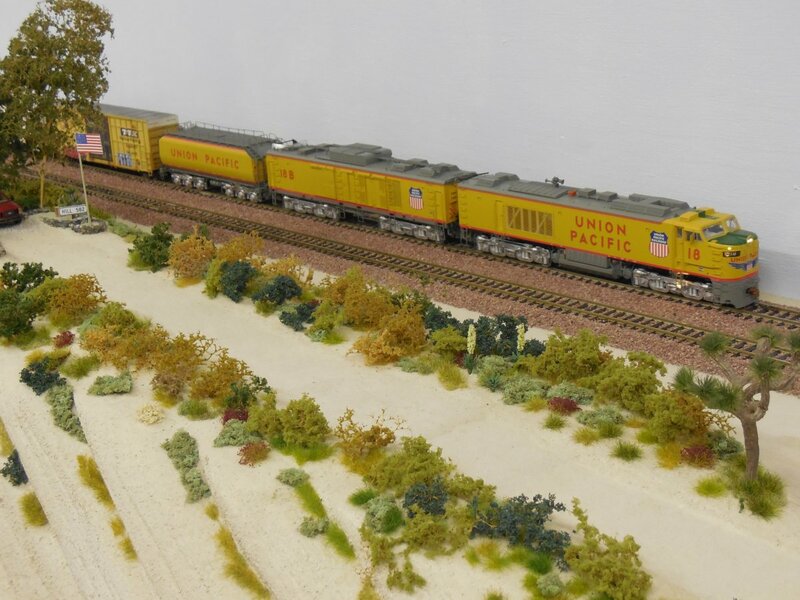 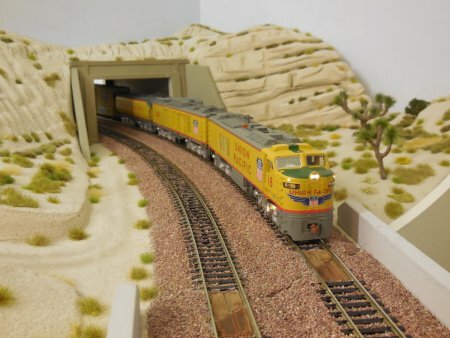 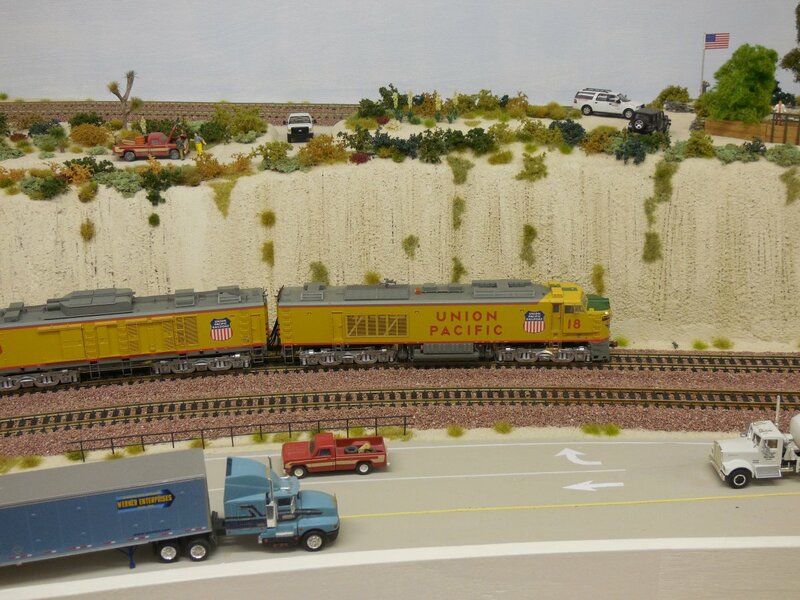 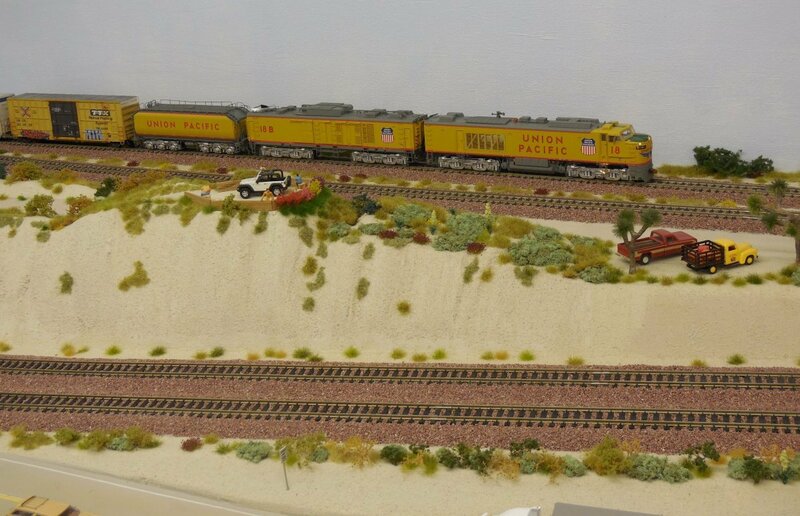 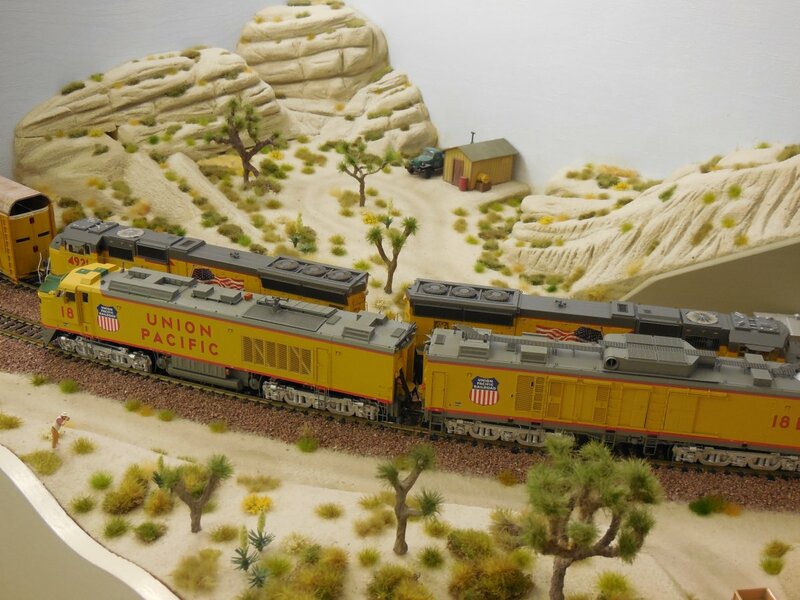 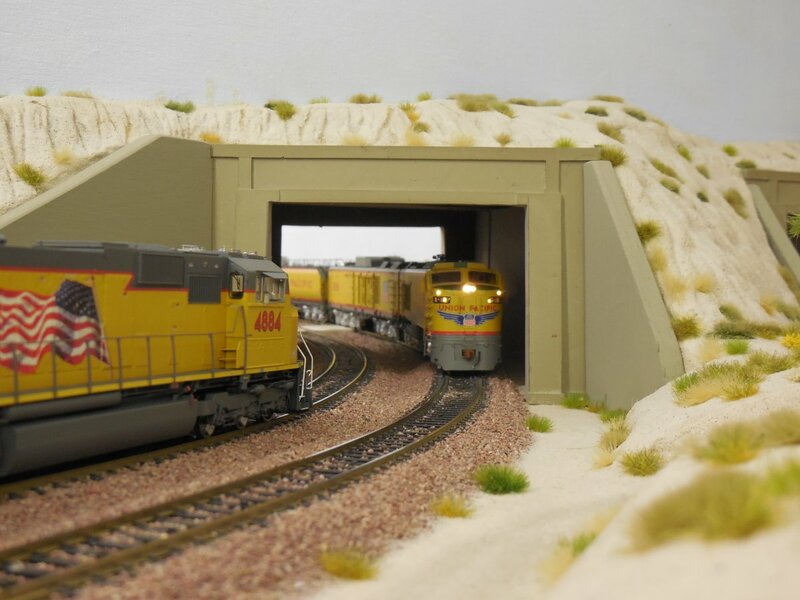 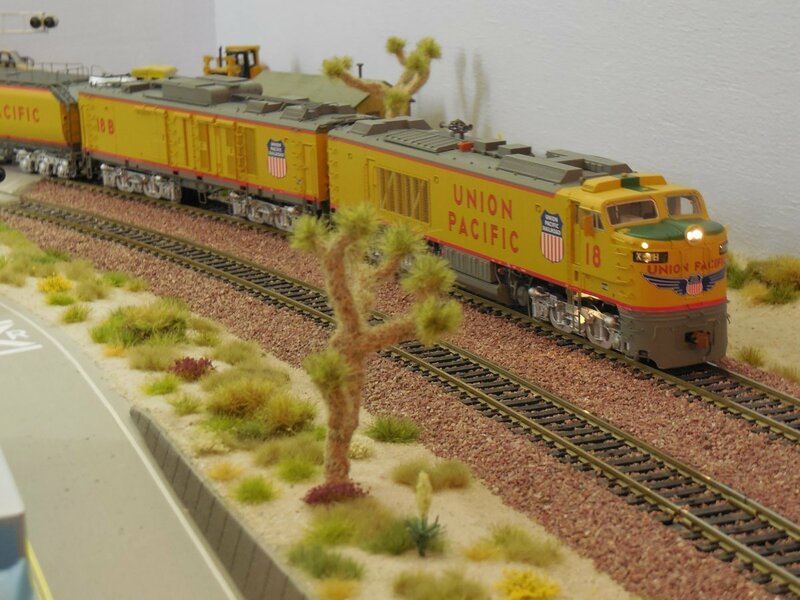 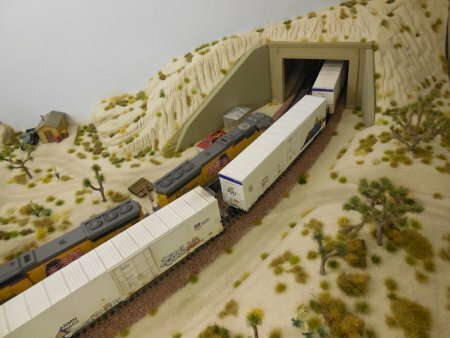 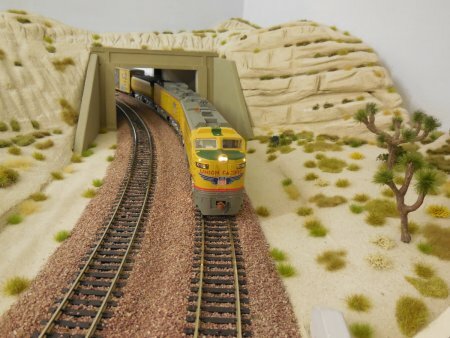 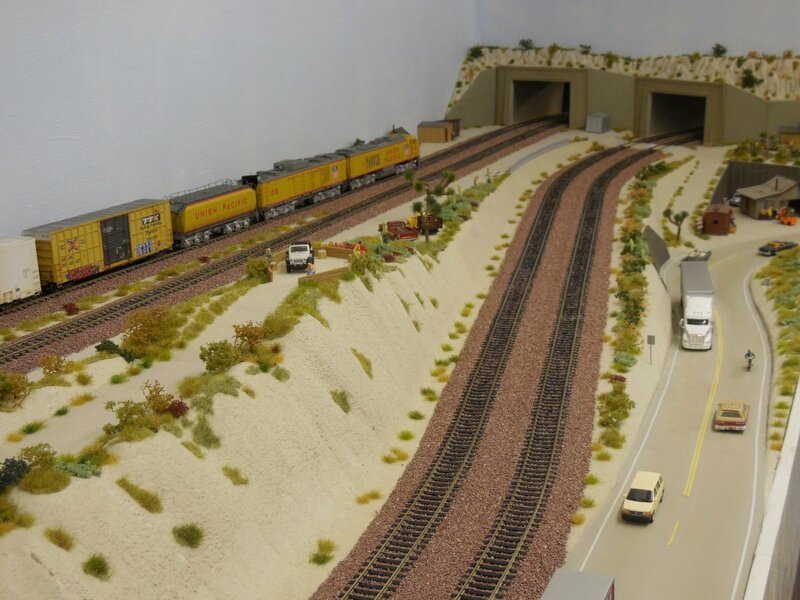 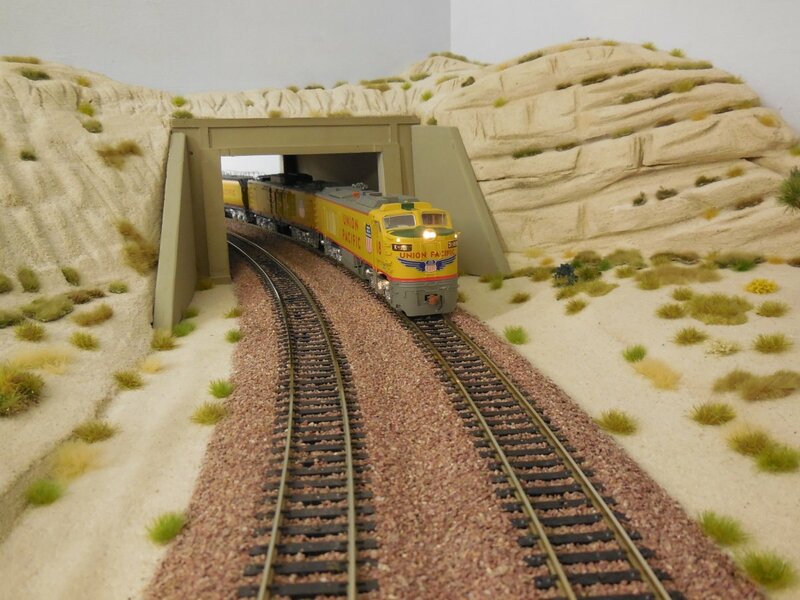 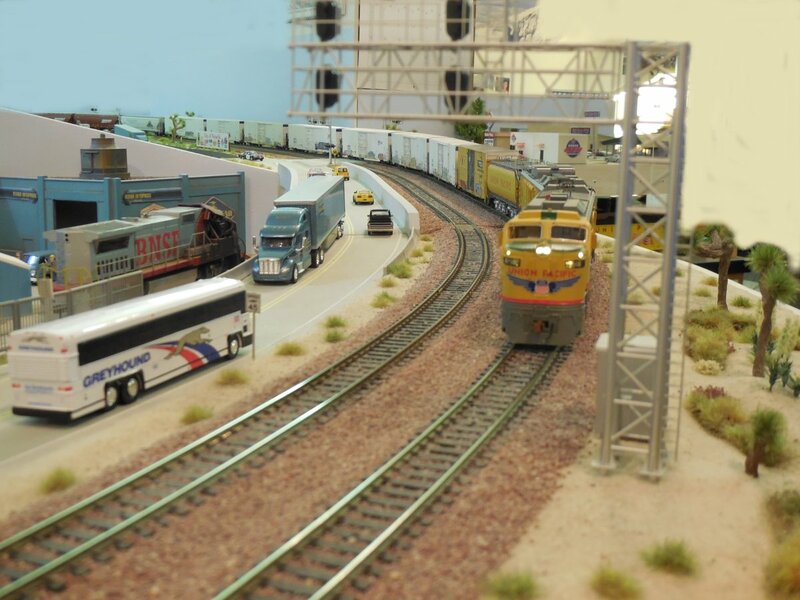 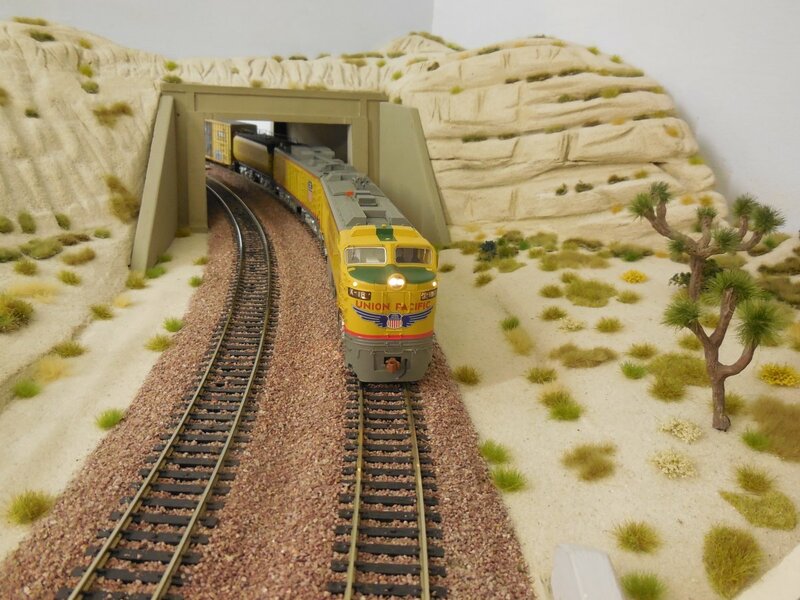 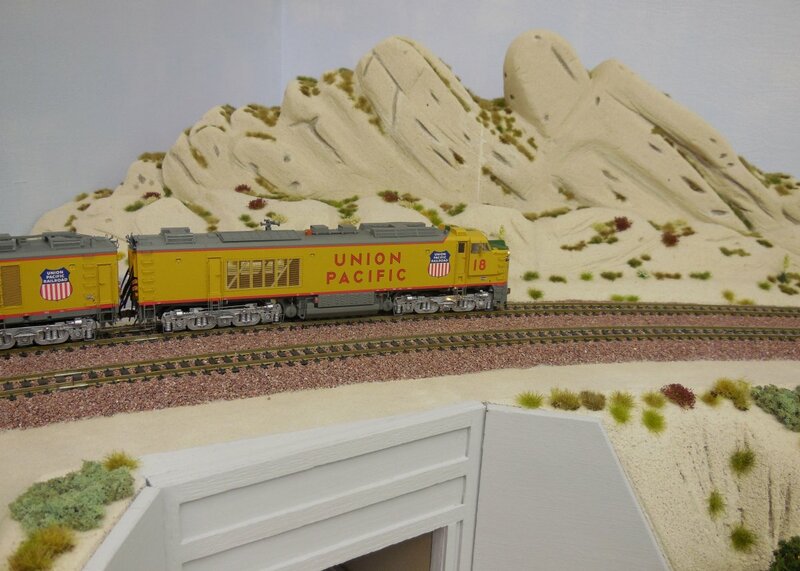 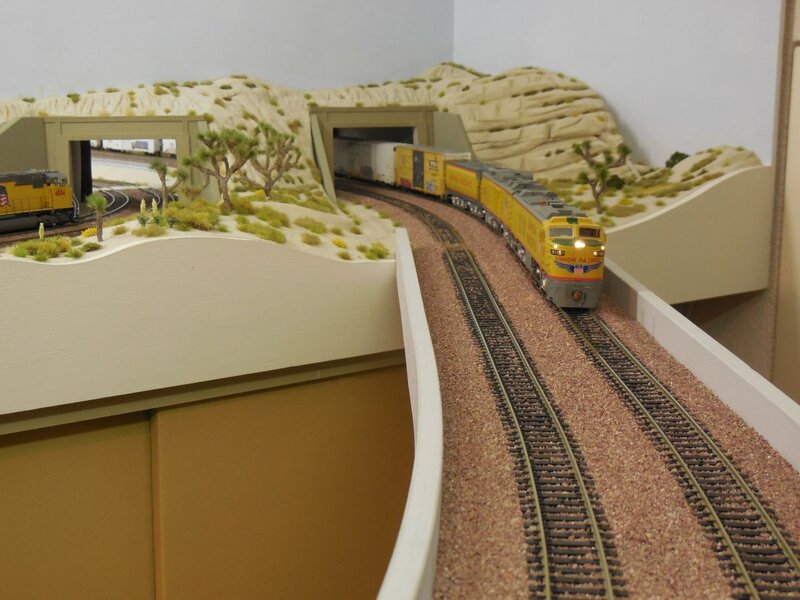 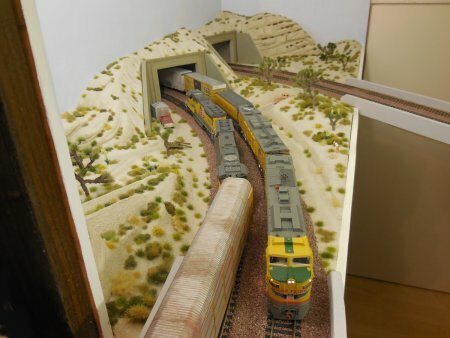 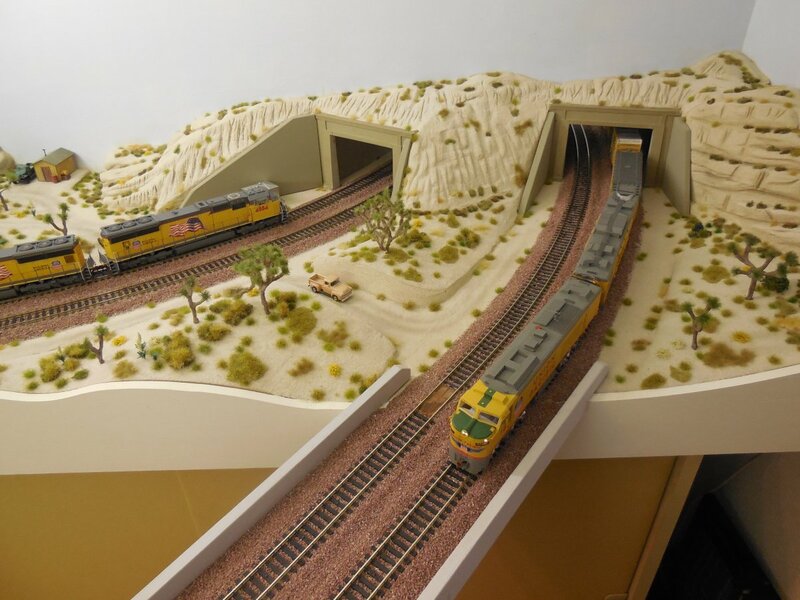 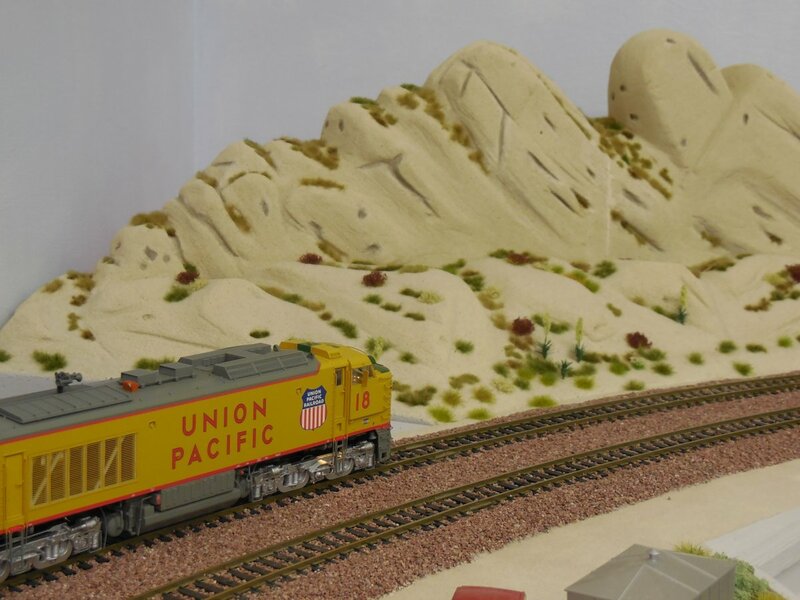 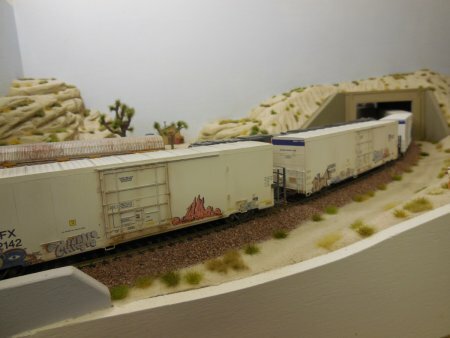 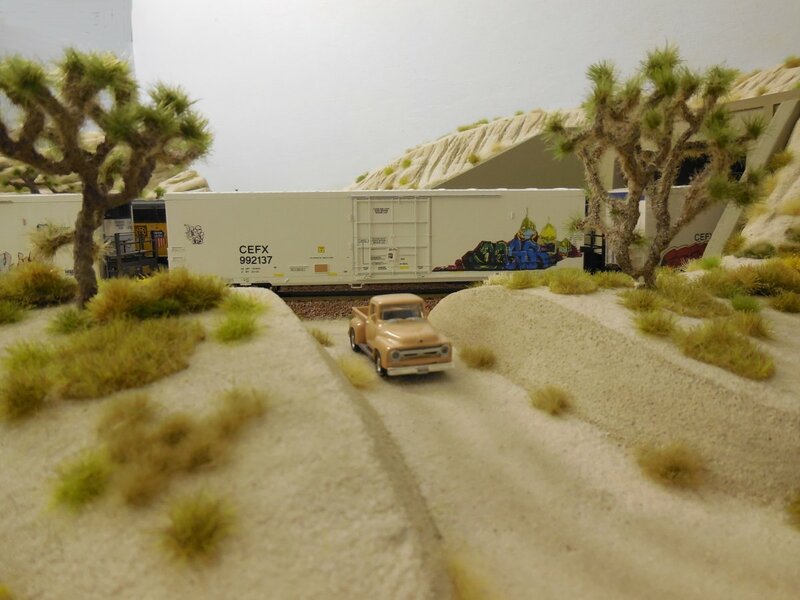 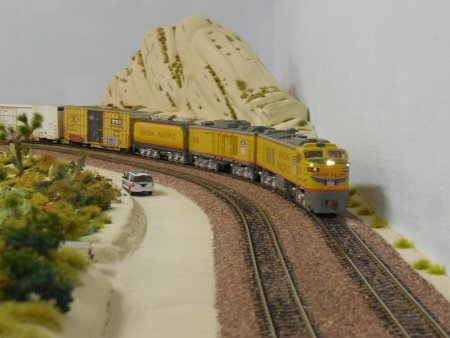 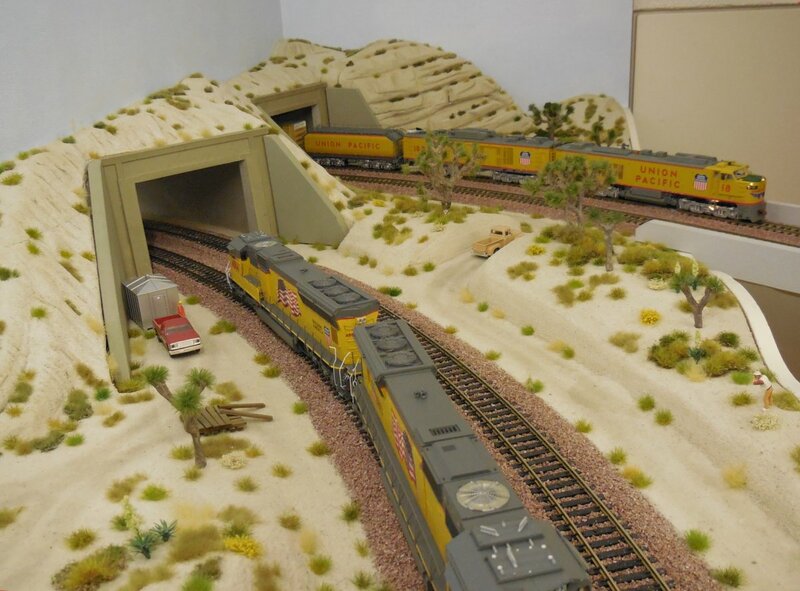 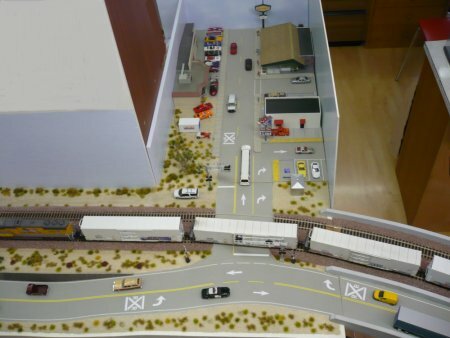 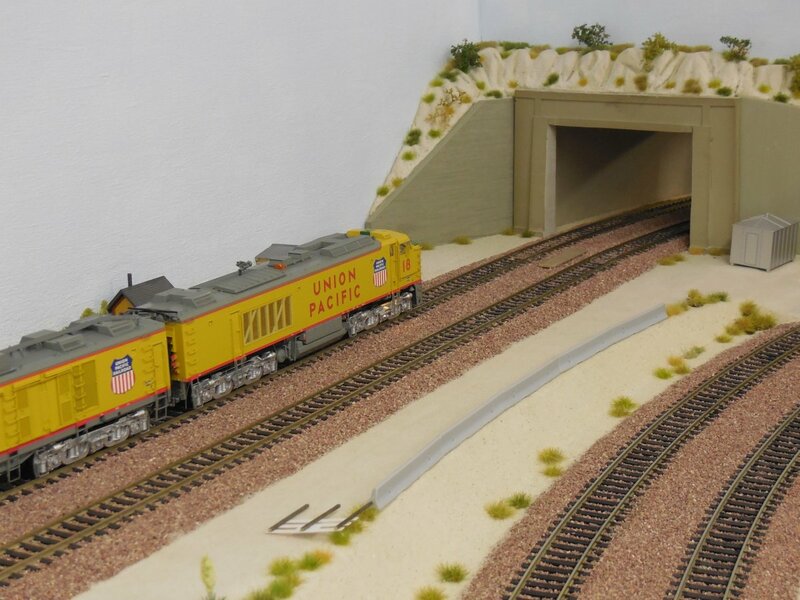 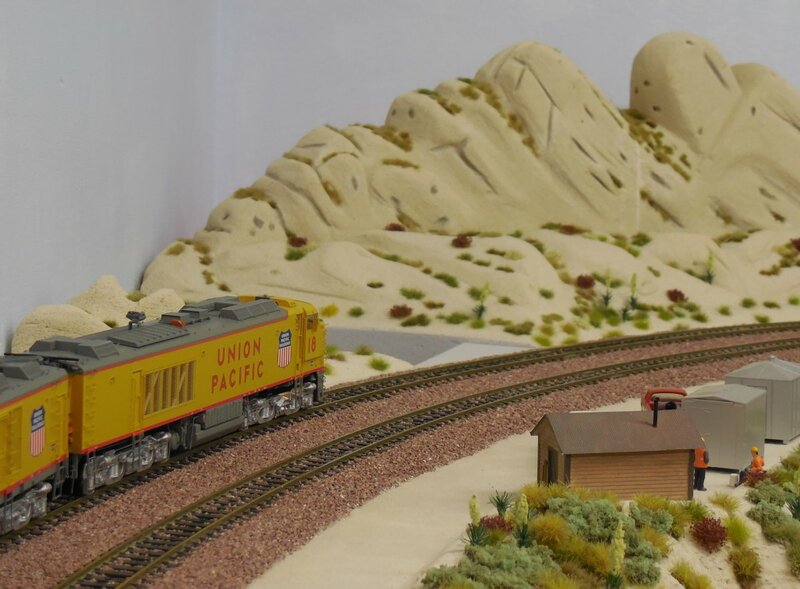 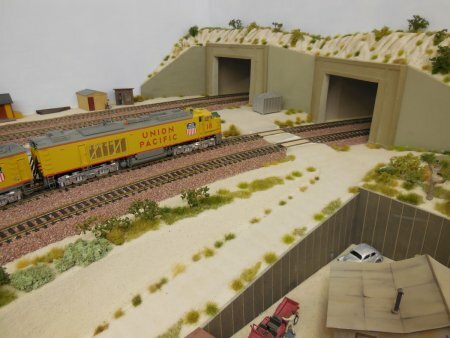 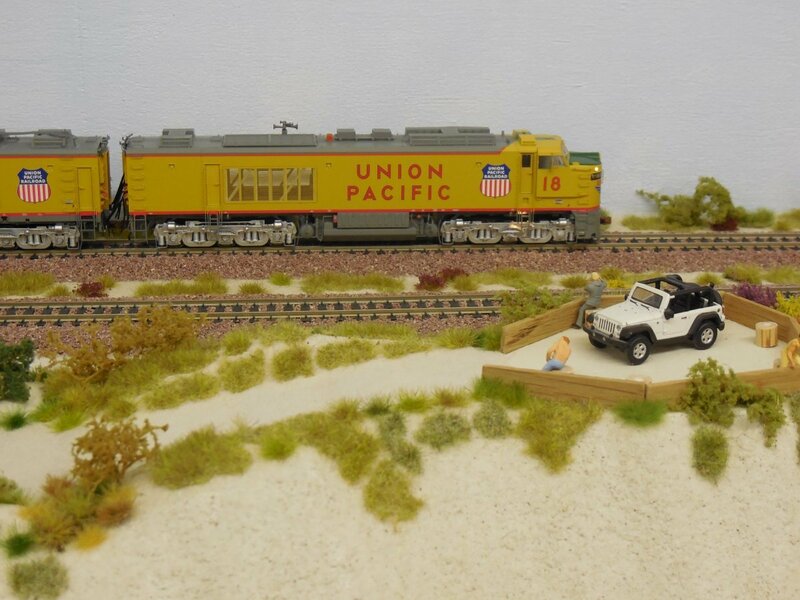 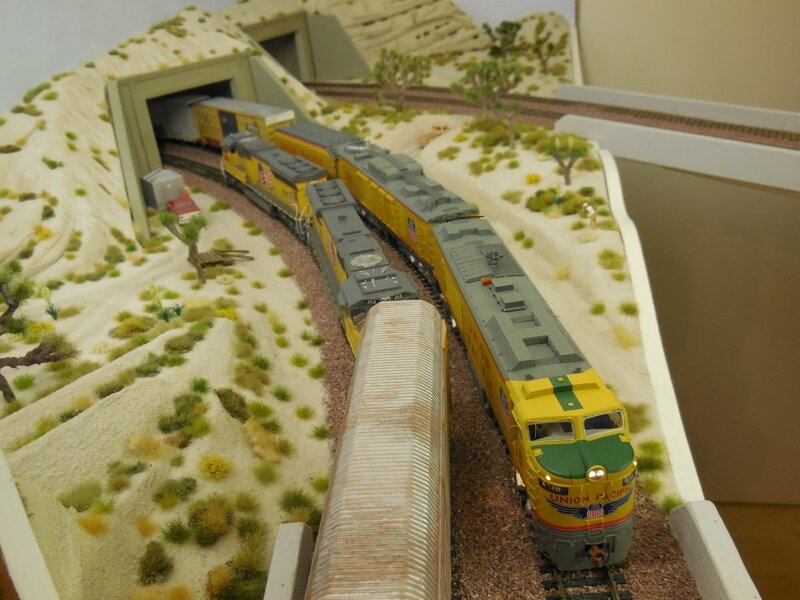 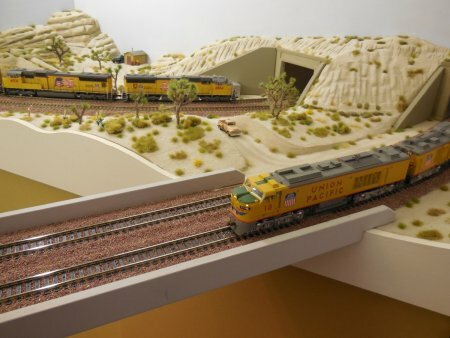 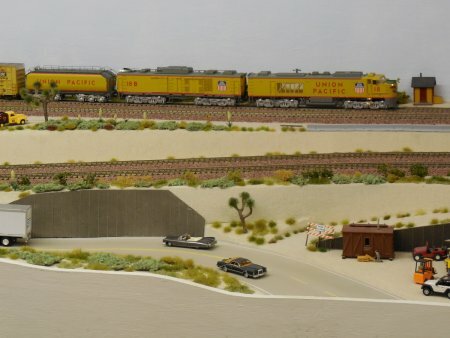 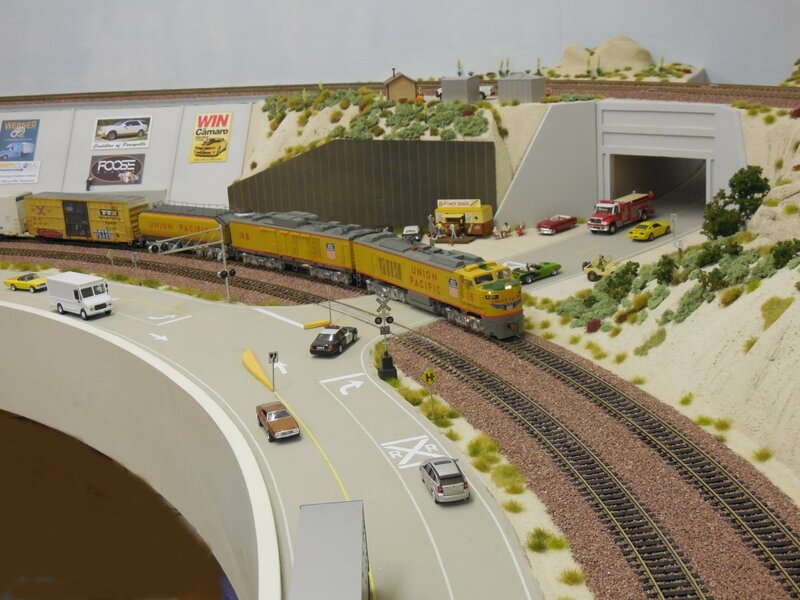 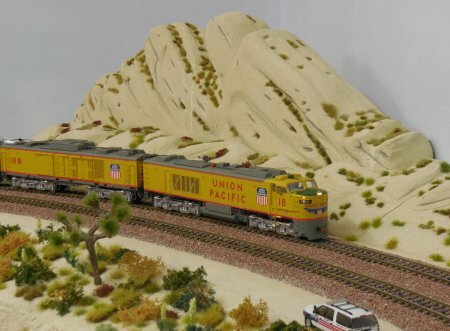 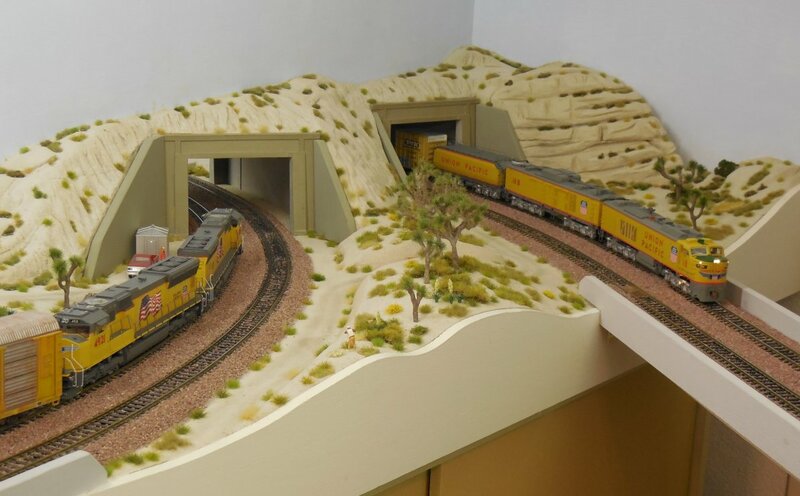 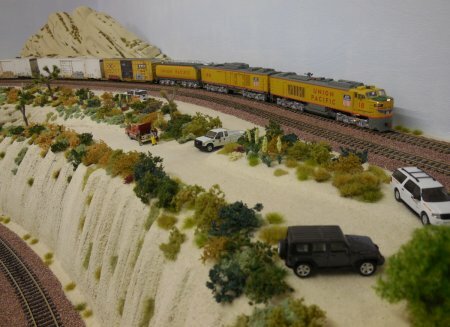 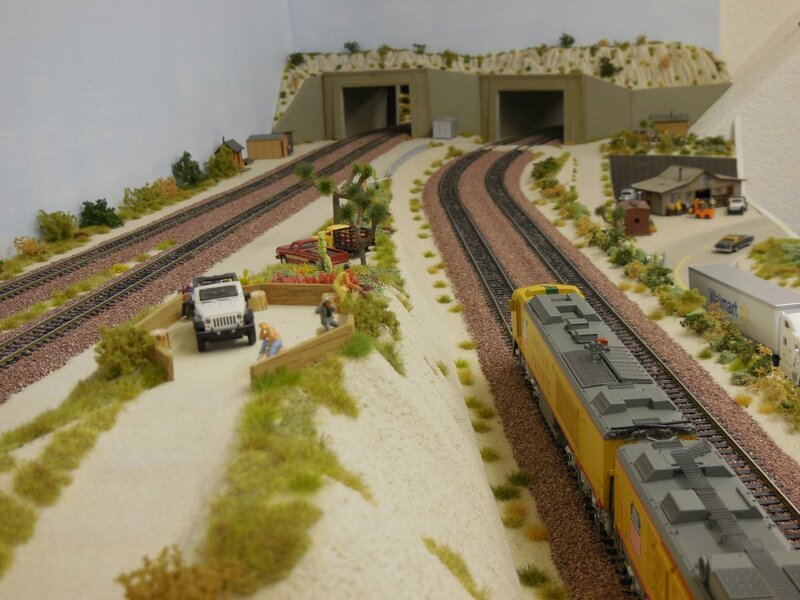 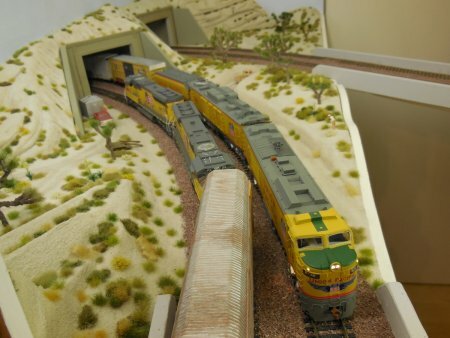 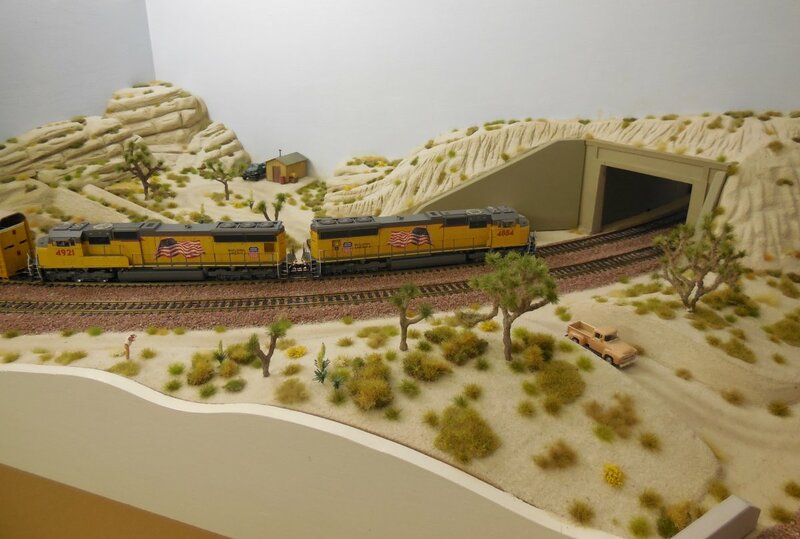 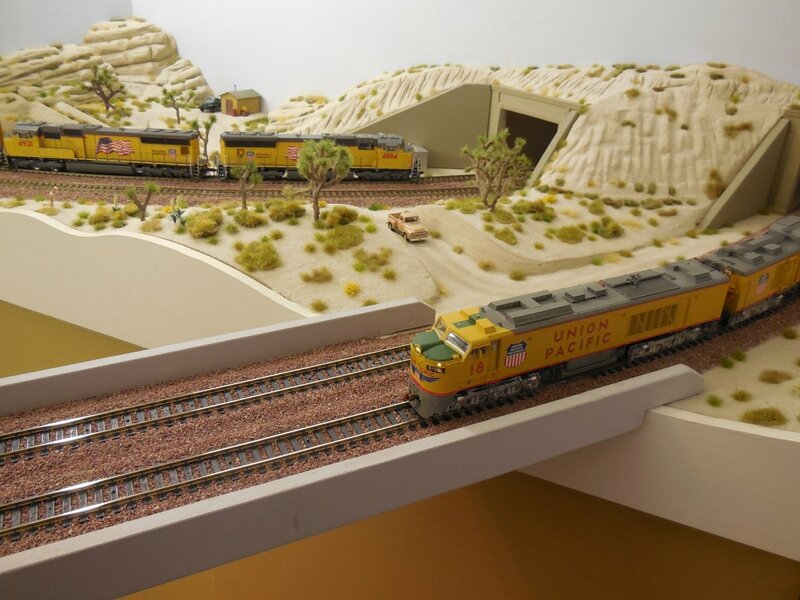 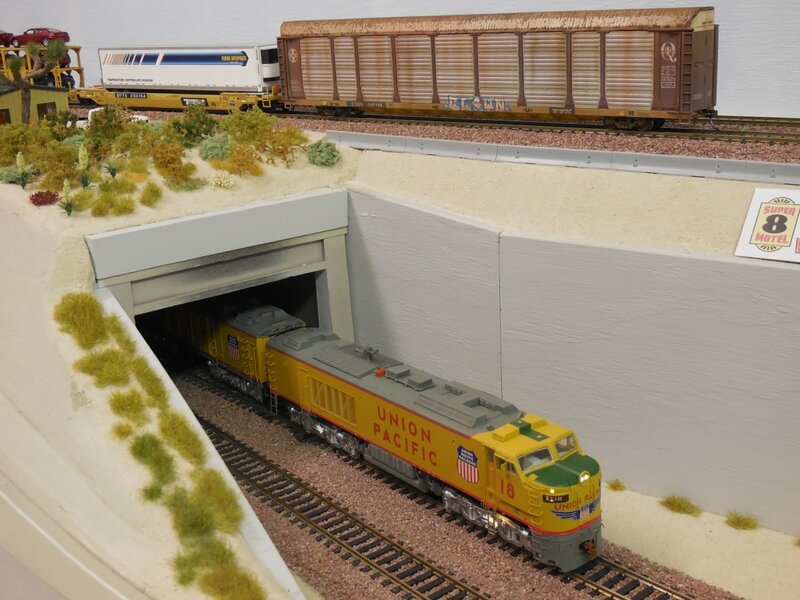 To present this outstanding model on my layout it gives me a chance to show the differnet places of my desert layout. 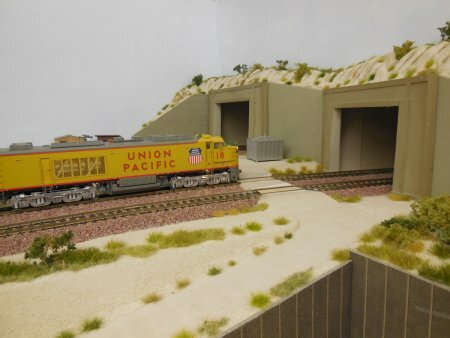 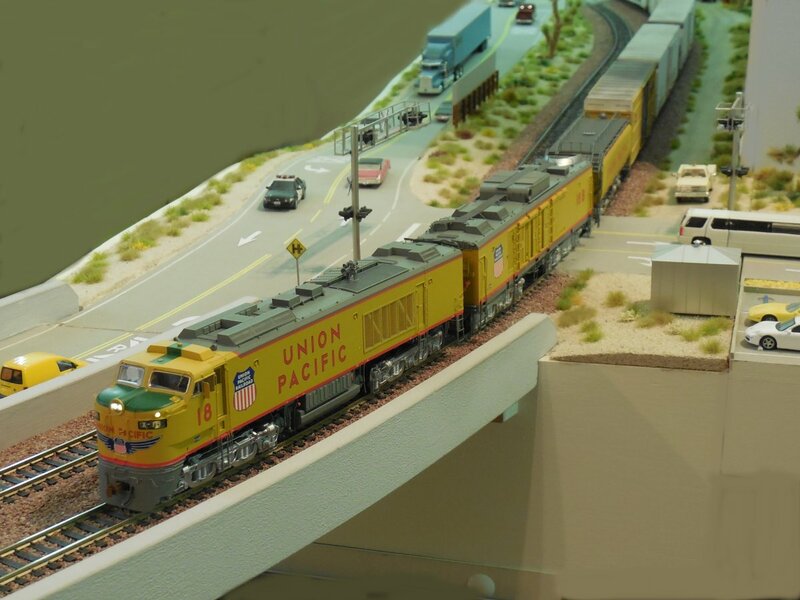 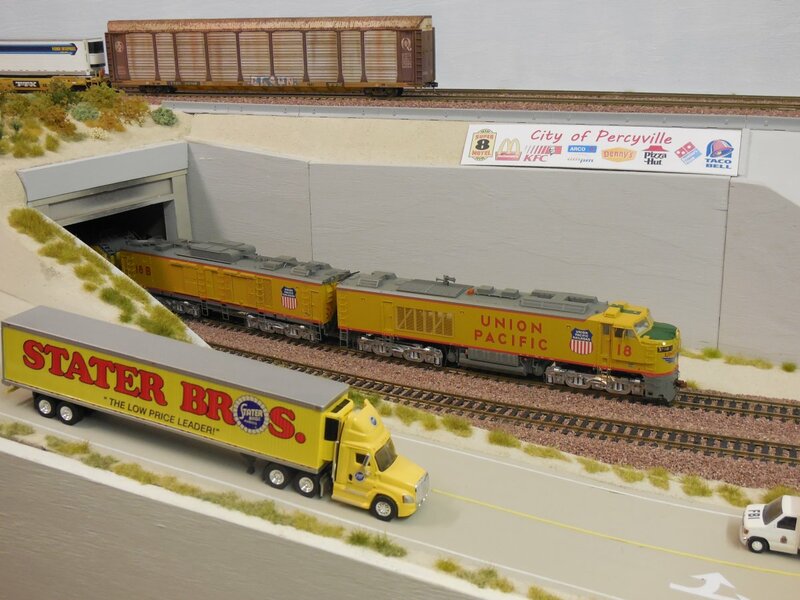 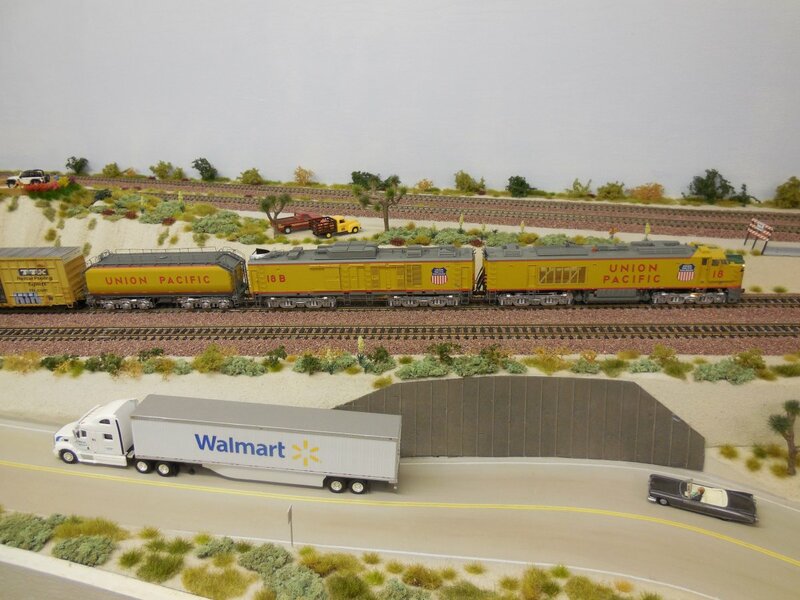 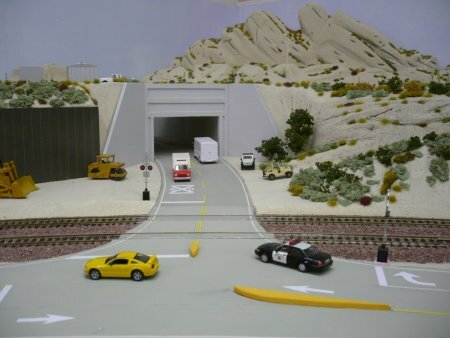 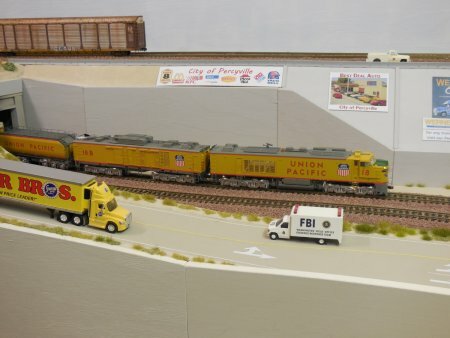 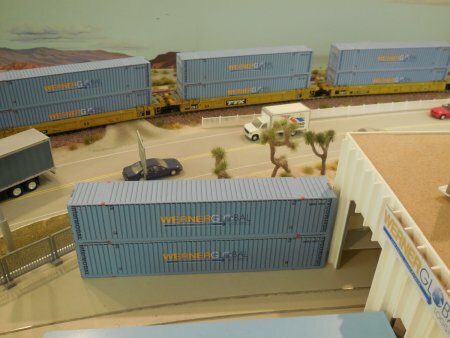 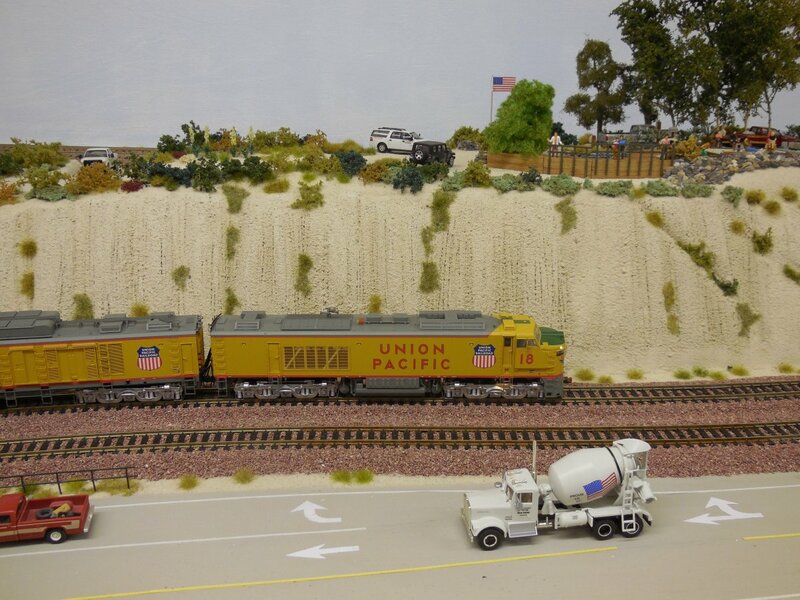 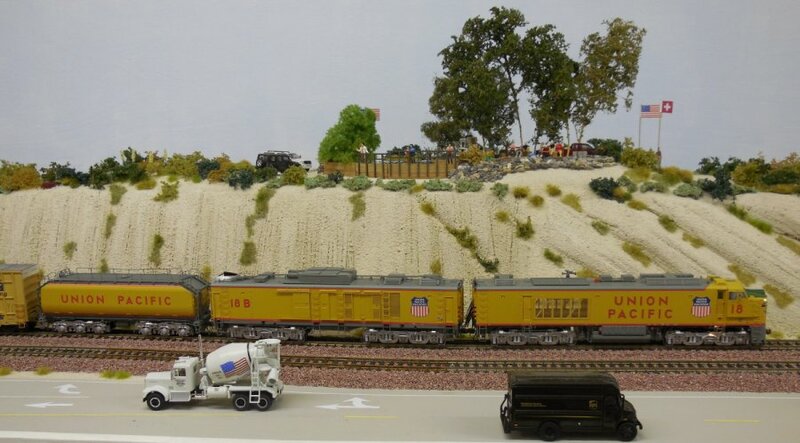 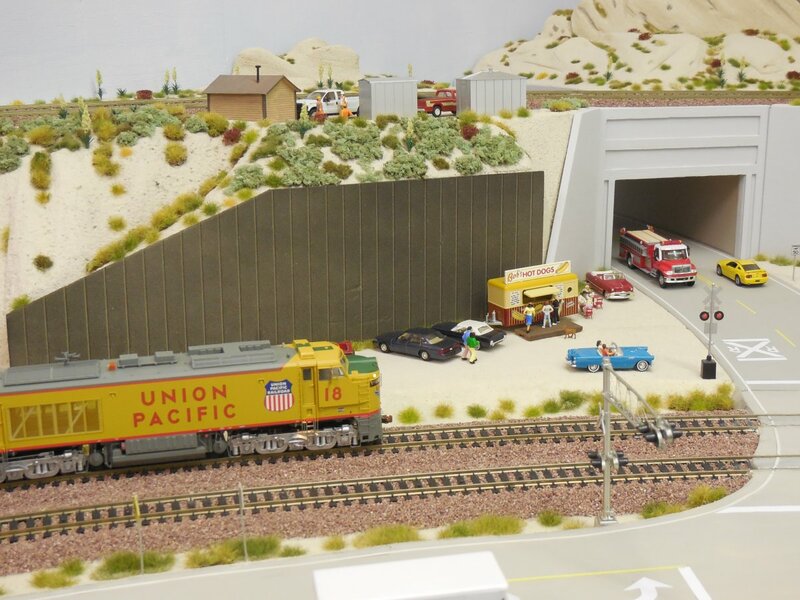 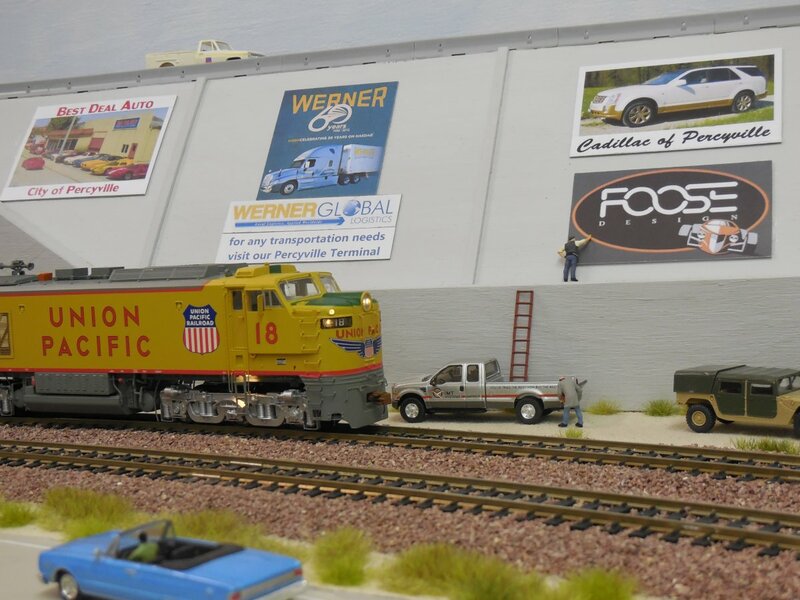 We start at the Mormon Rocks, pass Hill 582, WSI, Tunnel area (West and East side), Percyville Extension, Werner Enterprises Terminal, the City of Percyville, the Flyover and return to Cajon Pass on the lower level. Scale Trains Museum Quality Big Blow # 18 with DCC and Sound is a real master piece - congratulations. 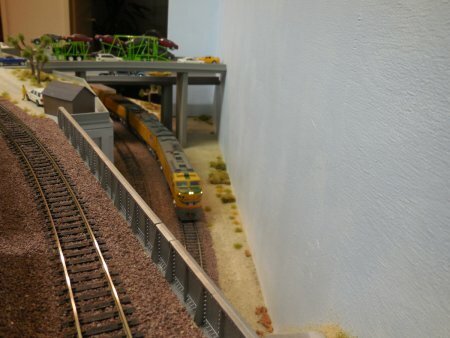 My layout is standard DC, so I put up the voltage until the sound started. Now, I increased the voltage just a little bit until the model started to creep (very slow). 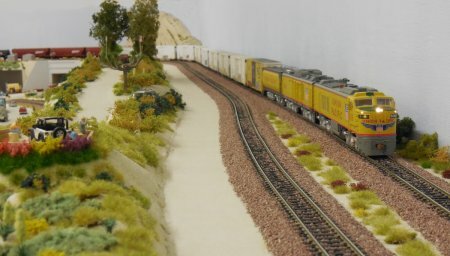 Therefore, I just let it move slowly over the whole layout and I took pictures while it was moving. 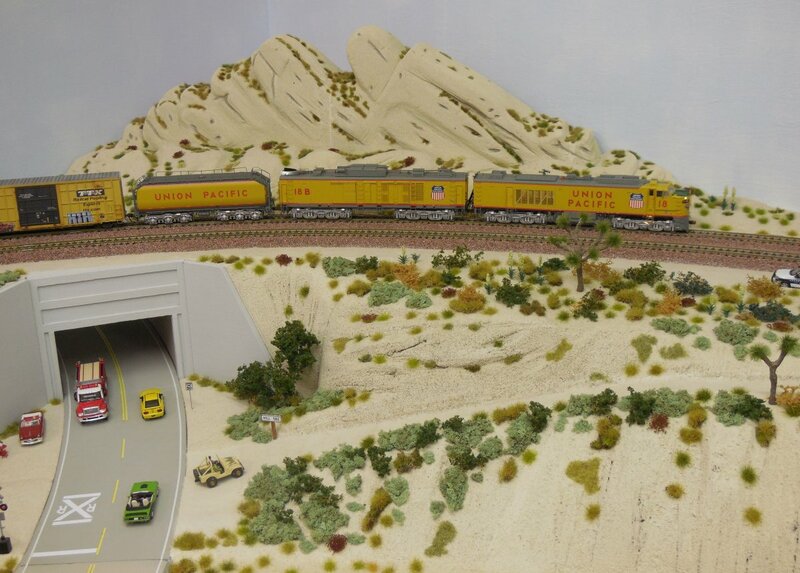 We start our journey near Highway 138 and the Mormon Rocks. 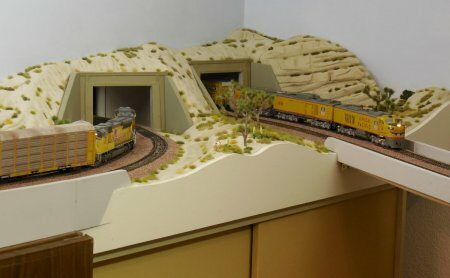 My scale Rocks were made as seen on a photo taken several years ago. The UP Turbine will reach Hill 582. 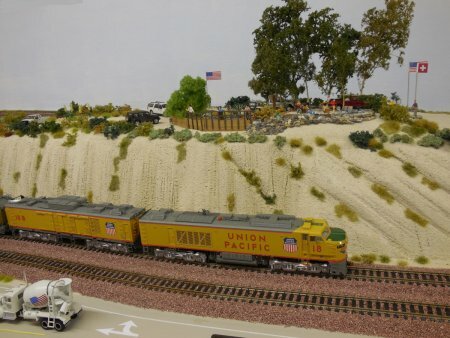 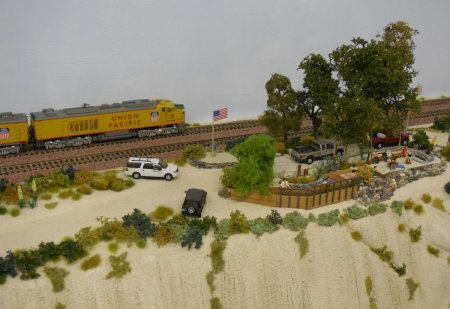 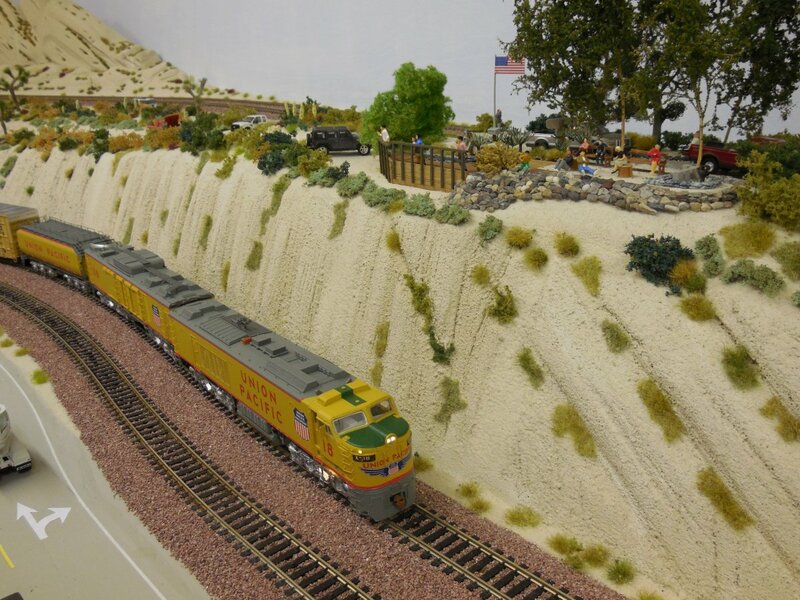 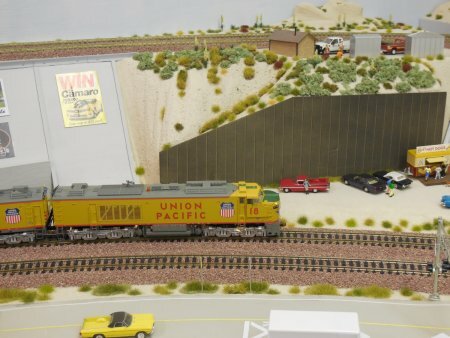 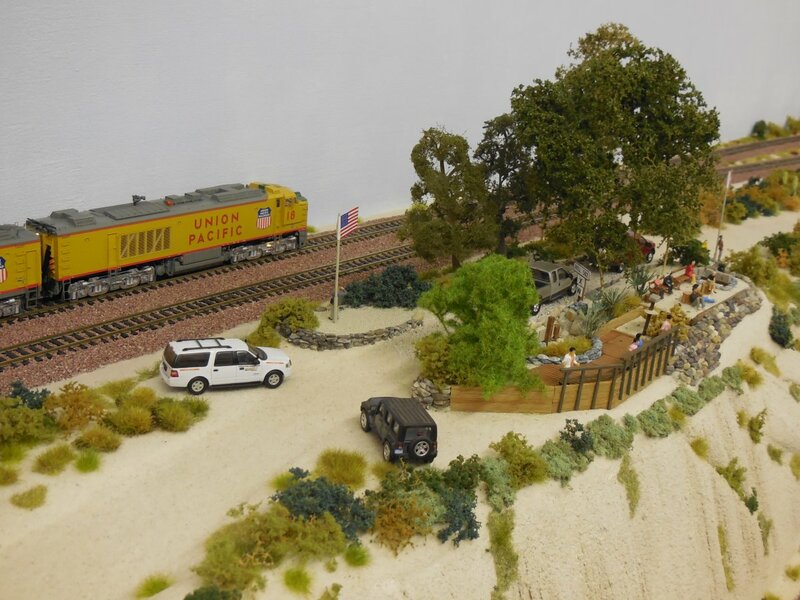 Hill 582 is a fantastic Railfan's lookout in Cajon Pass. In real life, it is located between the former tunnel area and Silverwood at Milpost 58.2. 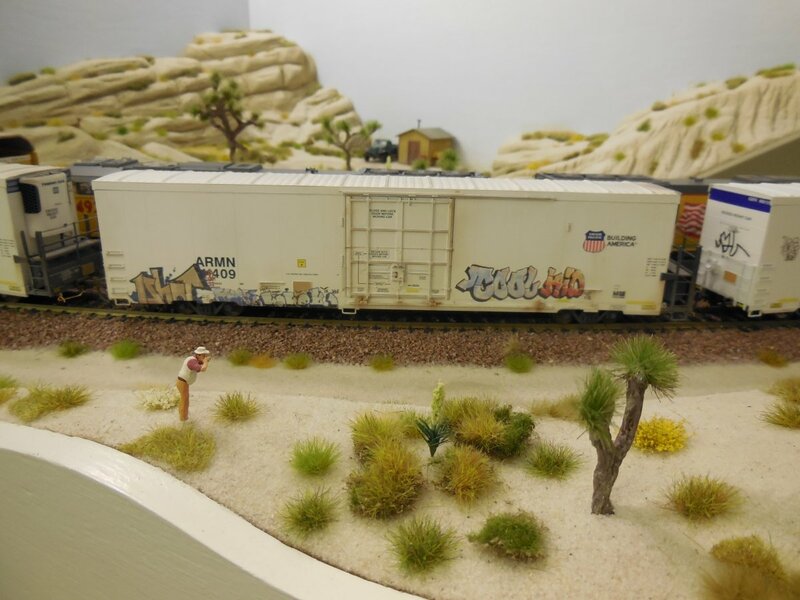 My scale version reflects the year 2015 with additional railings along the East side. 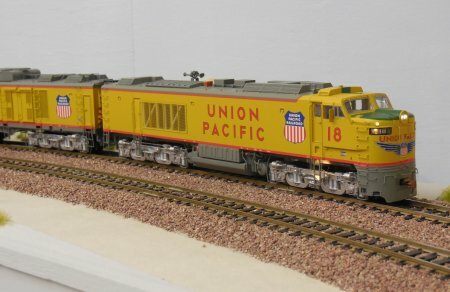 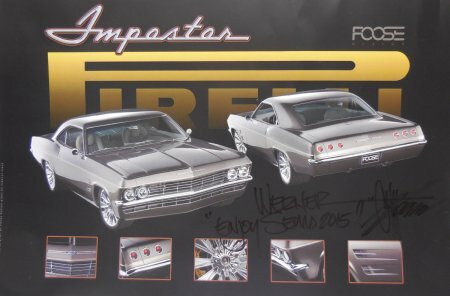 I was trying to re-create my model to get an authentic look. 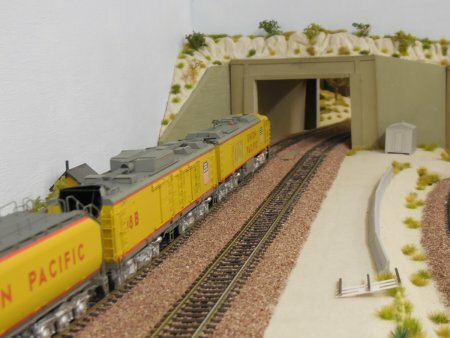 There is a difference because in real Cajon, Hill 582 is 90 ° to the tracks but my version is parallel because of space limitations. 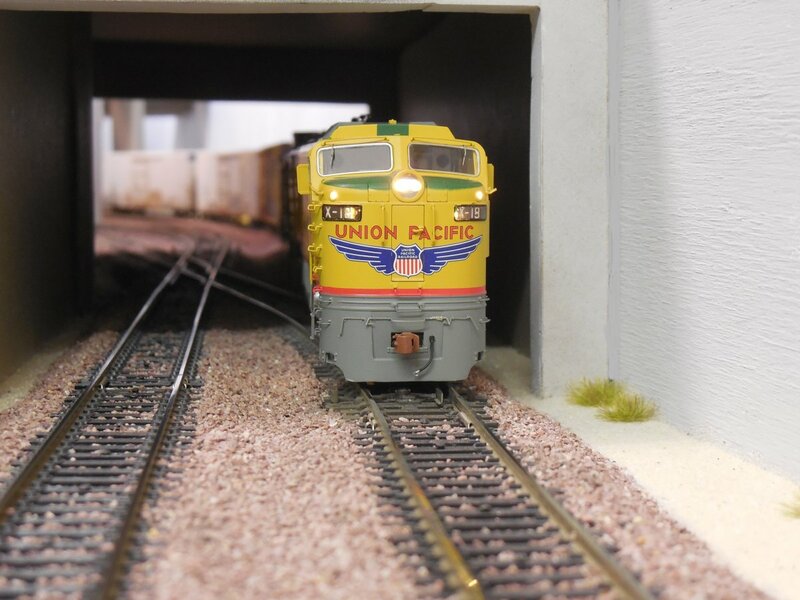 The UP Gas Turbine is going thru Tunnel 2 to the East side. 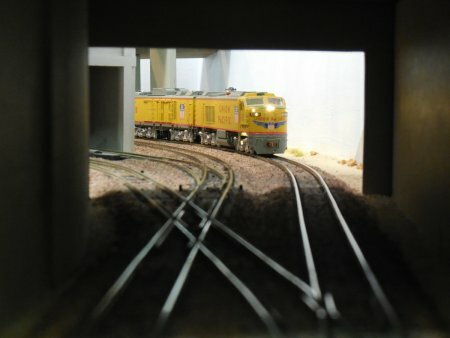 We are on the upper level passing Tunnel 2 going from Office 2 to Office 1. After passing the bridge, the turbine reached the next part of the layout and is crossing Route 66. 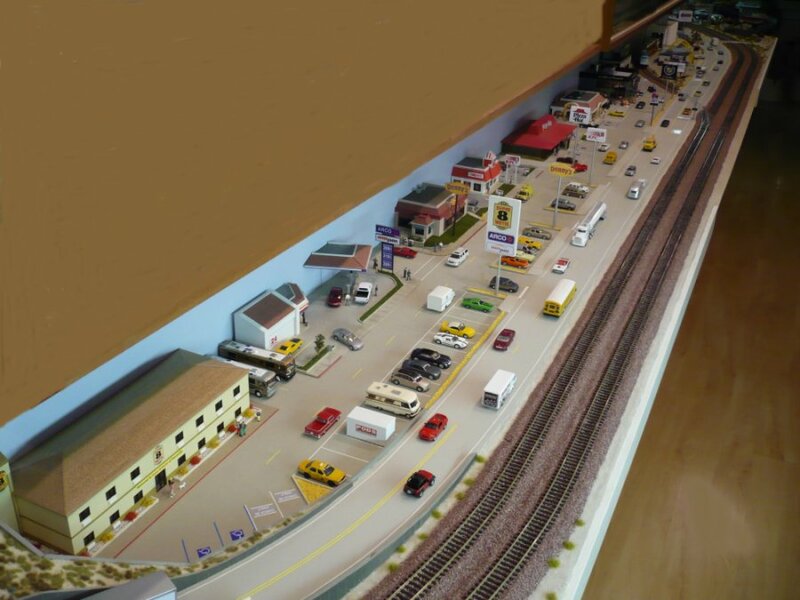 On this part of my layout, we will soon pass the Percyville Extension. 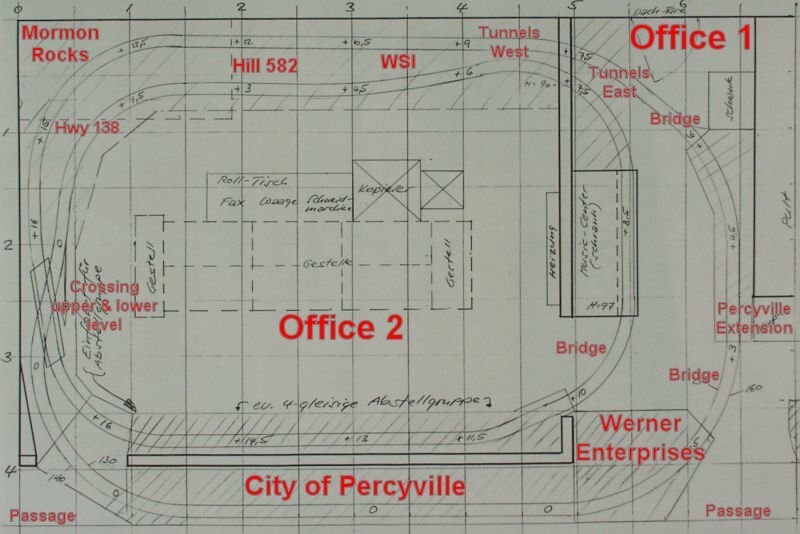 After the combined street / railroad bridge, we will reach the Percyville Terminal of Werner Enterprises. 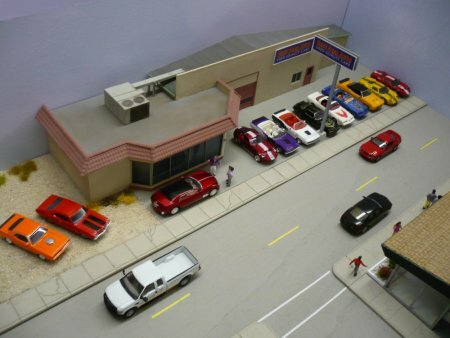 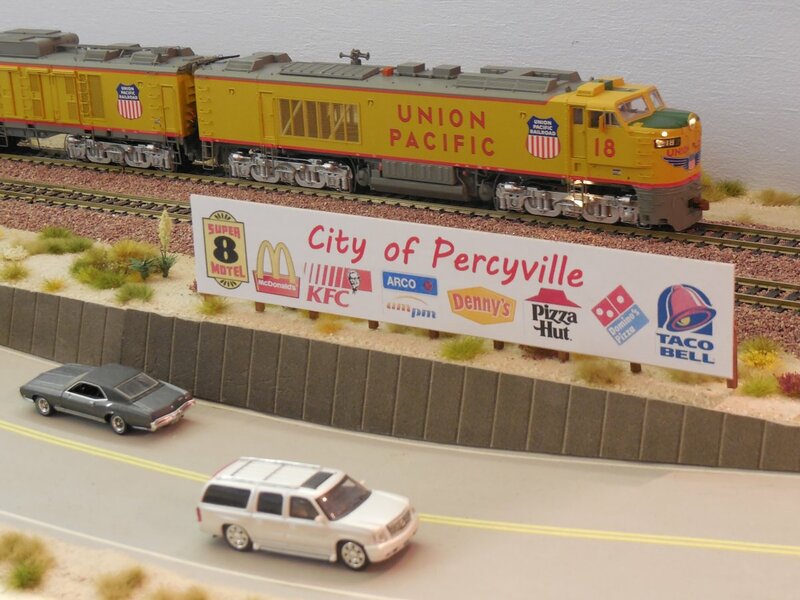 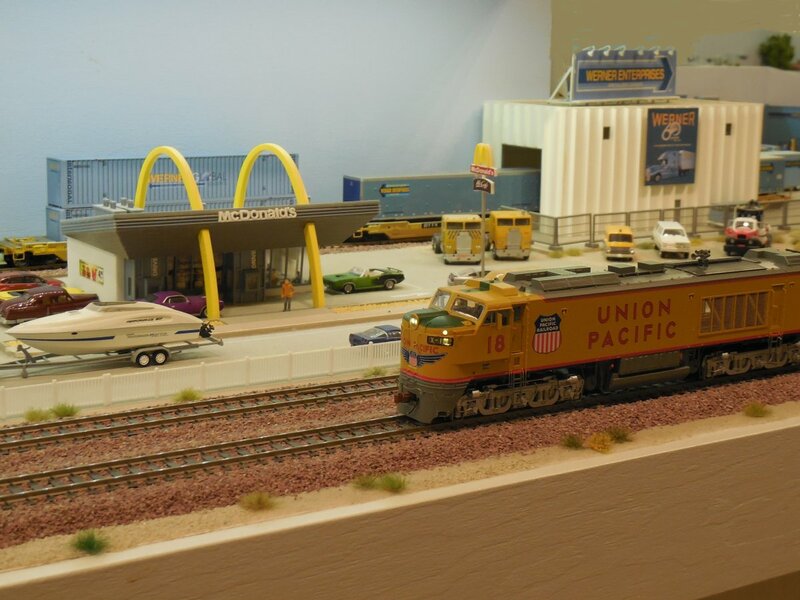 The City of Percyville starts with the Mc Donald's Restaurant, just next to Werner Enterprises at the East end. 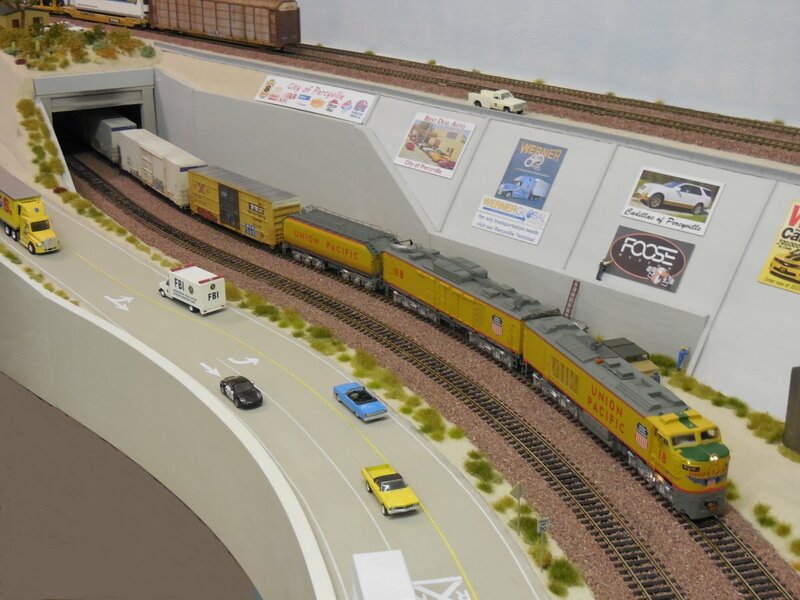 The curve of the West End is leading from the Passage into Office 2 and the Turbine is passing under the two road bridges toward the Flyover. We are finally back to Cajon Pass, but this time on the lower level. 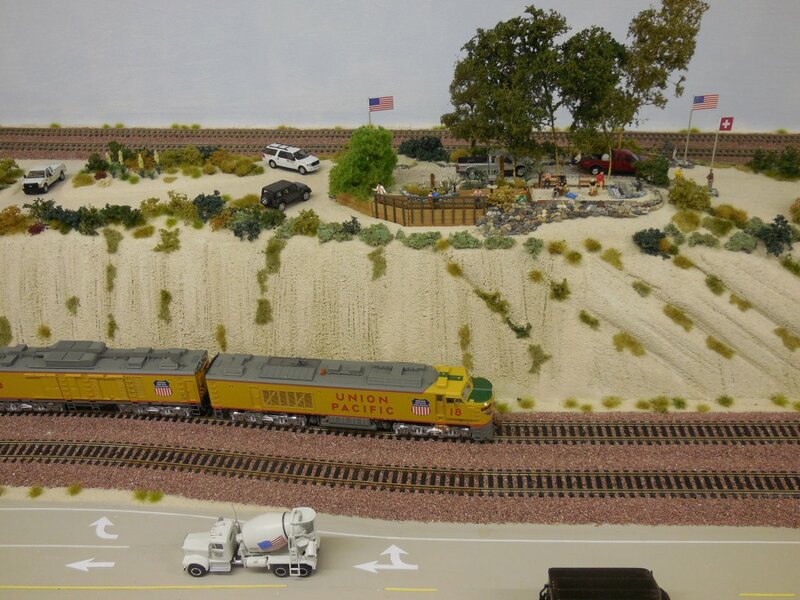 From the Flyover, we reach Highway 138 and the Mormon Rocks. 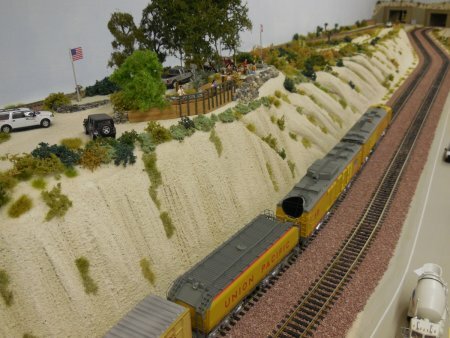 We did finally reach Hill 582 on the lower track. After passing WSI (West Summit Island), the Turbine will reach the West side of Tunnel 1 on the lower level. 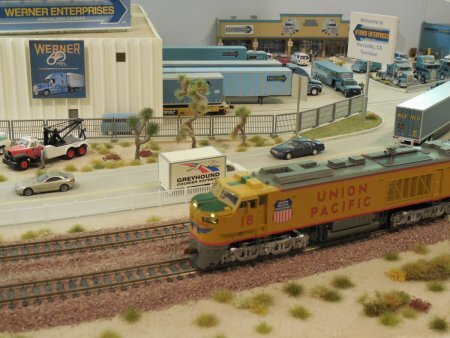 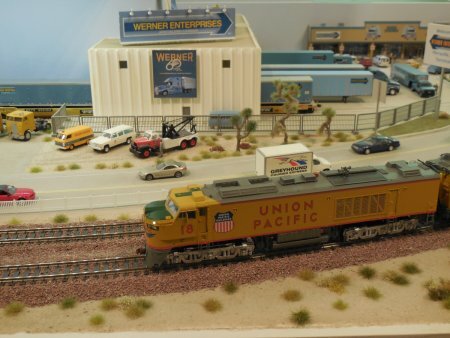 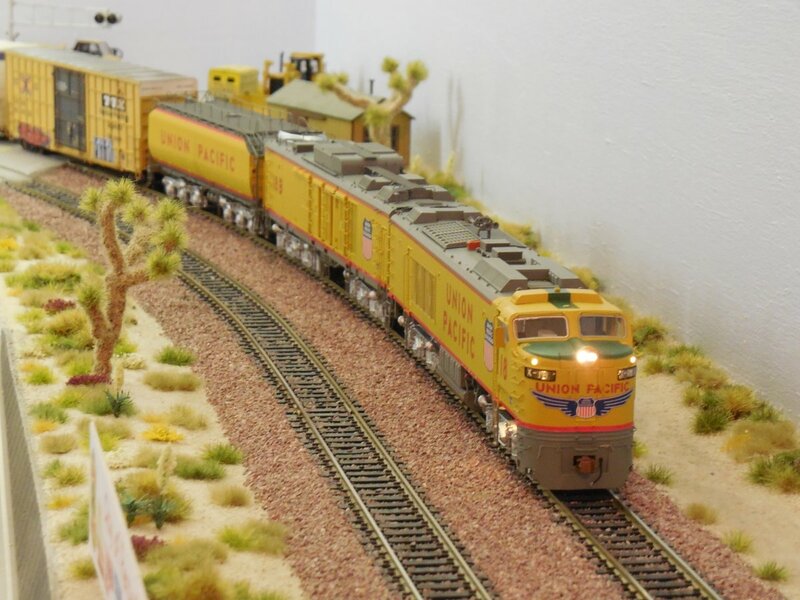 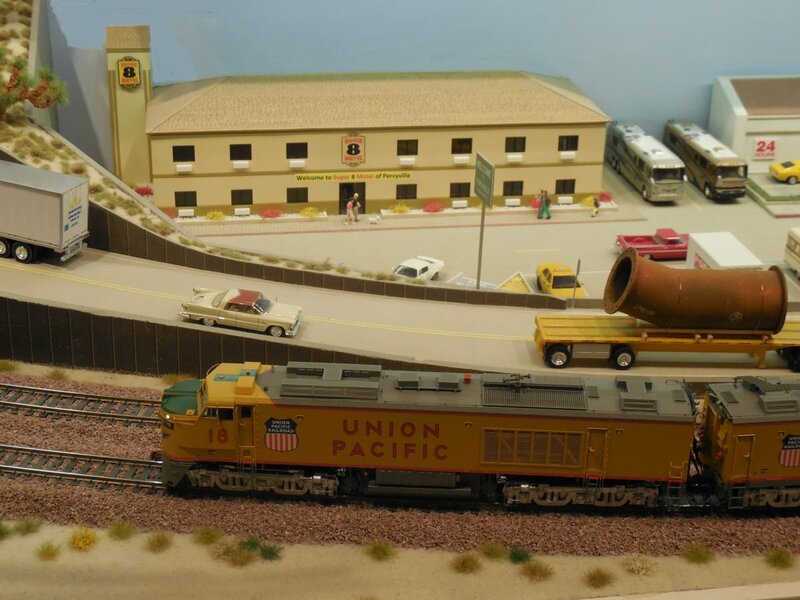 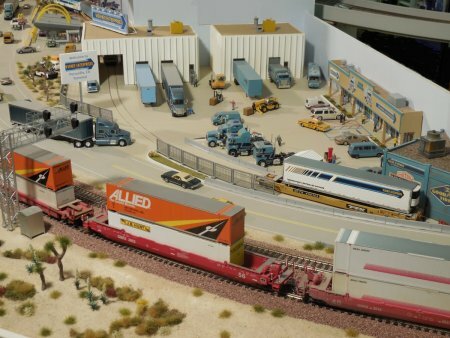 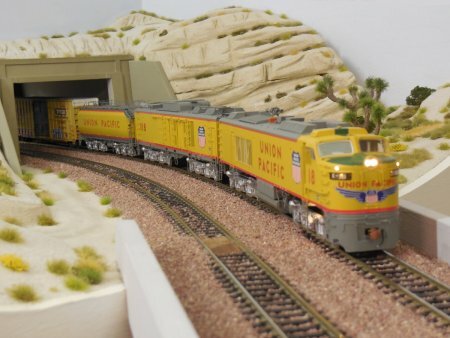 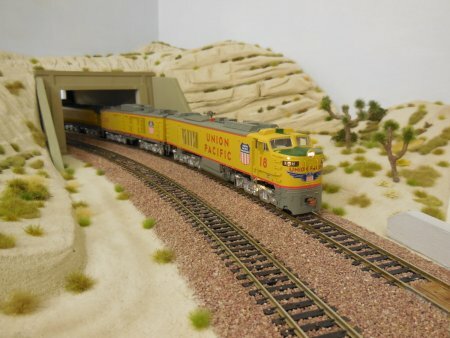 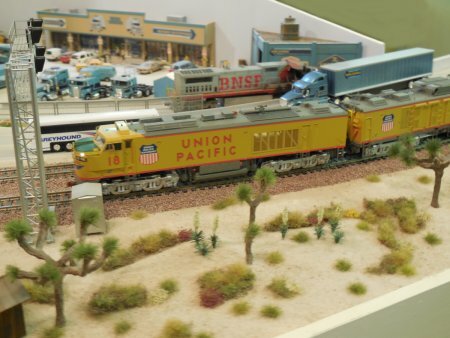 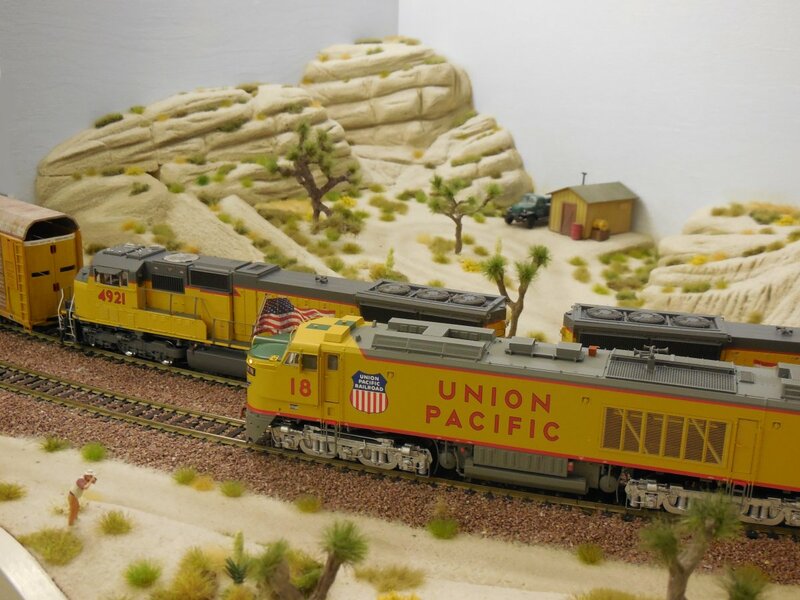 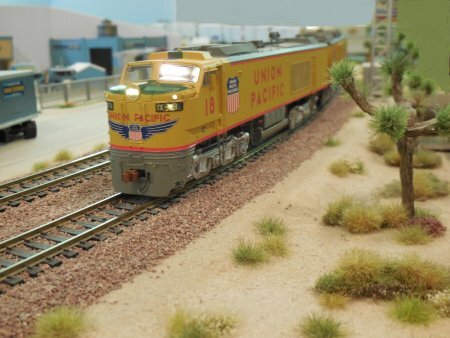 This is the end of our special UP Gas Turbine tour on my Mojave Desert layout.